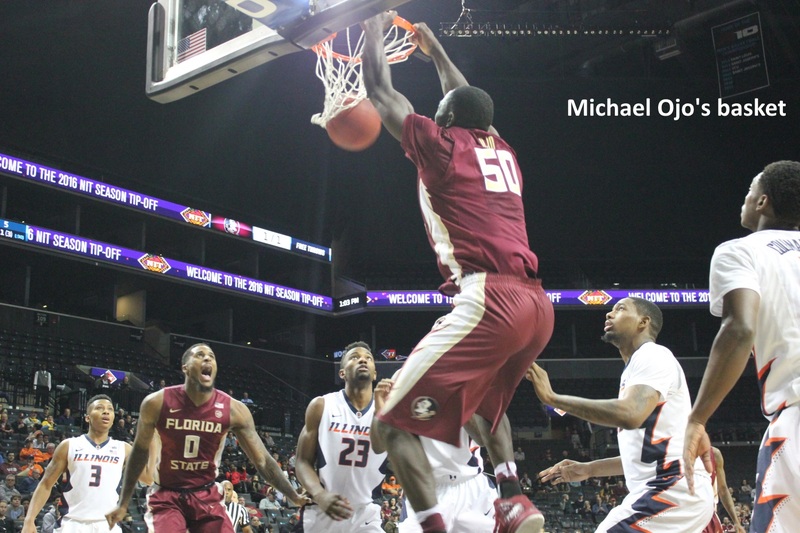 Winthrop wasn’t great. 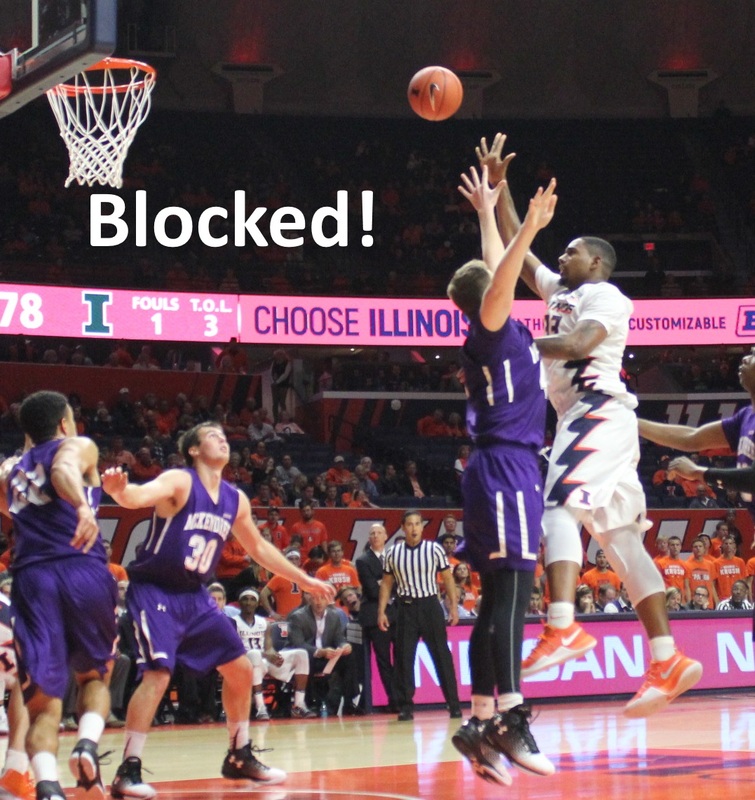 Illinois should have won. 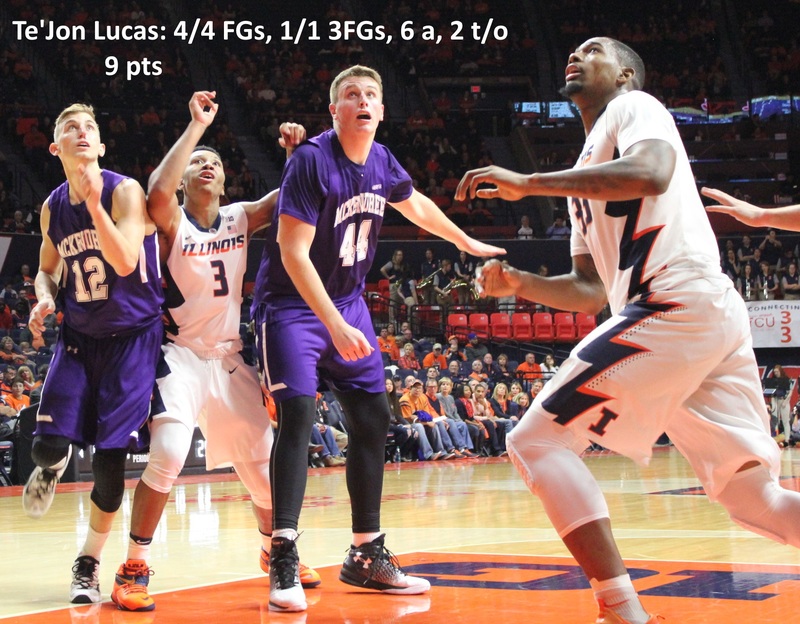 Lots of guys played poorly, for each team. 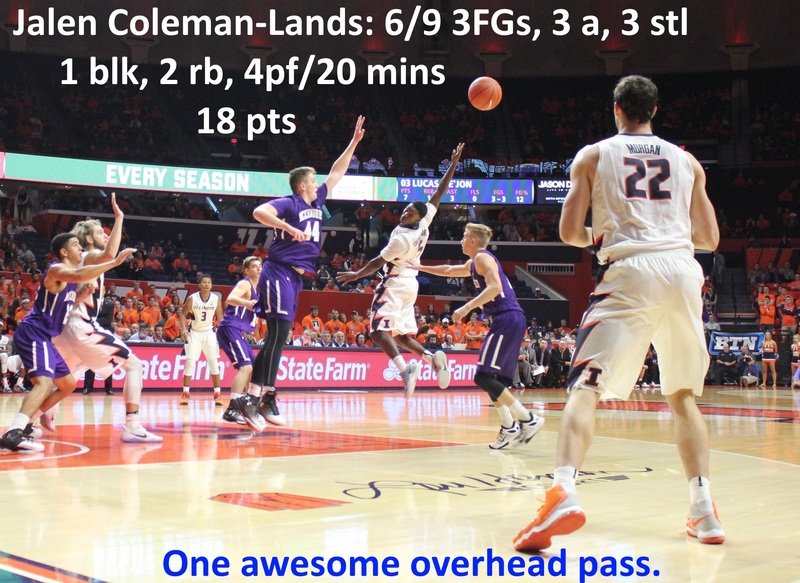 But everything about this game favored the littlest guy on the court. 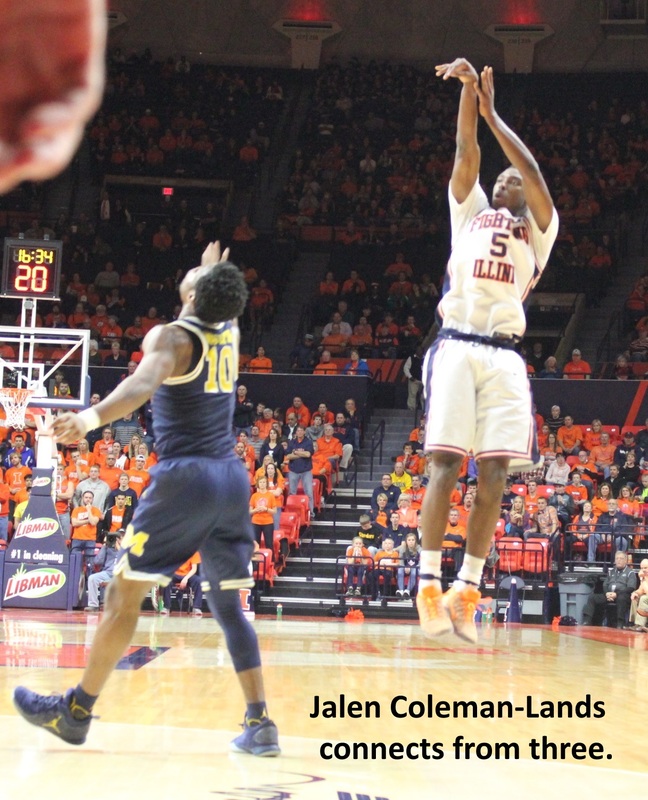 Keon Johnson is physically unable to violate the new cylinder rule. 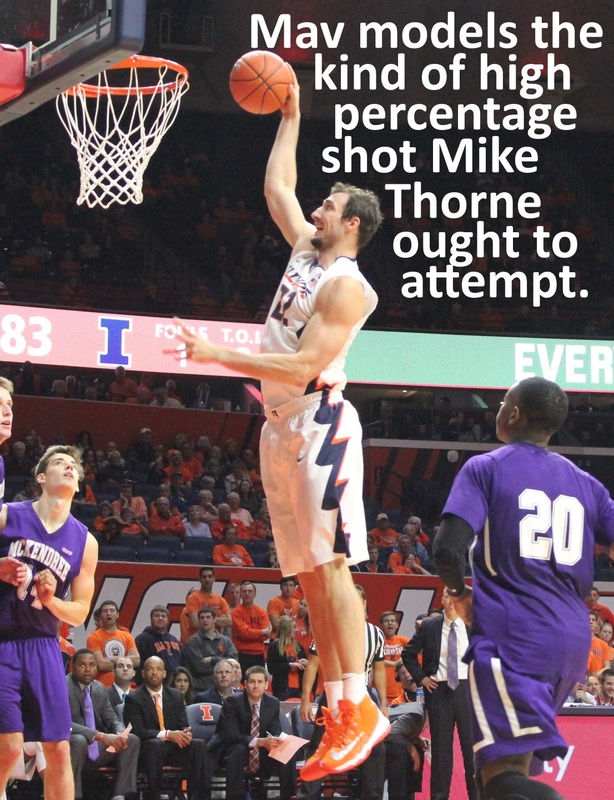 At 5’4″, he’s simply incapable of fouling a typical college player above the waist. 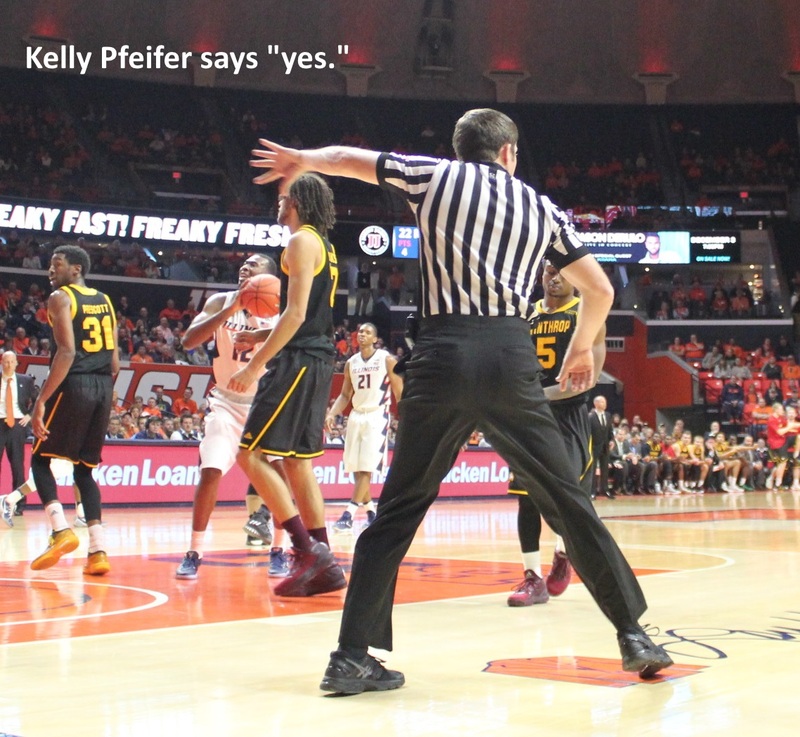 Referee Kelly Pfeifer set the tone with a lot of early whistles. 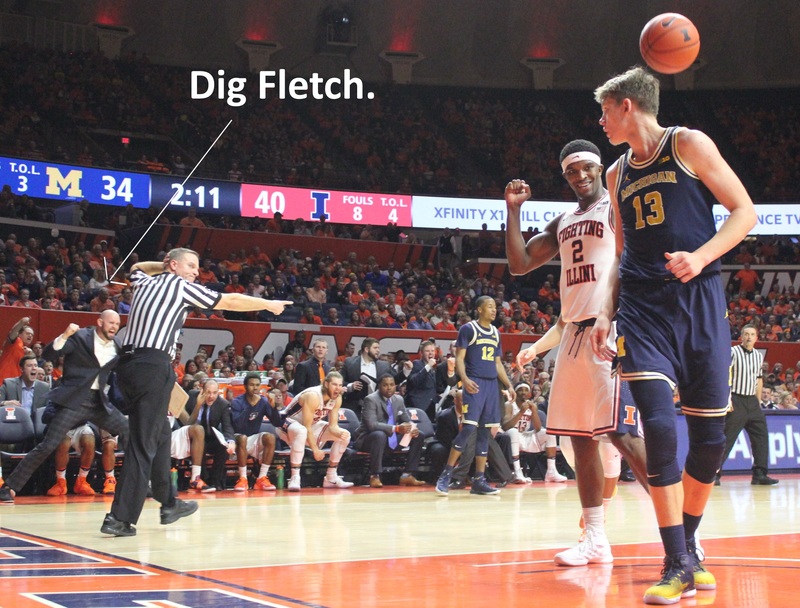 After three consecutive calls, Pfeifer seemed to recognize that he should, maybe, take a break. 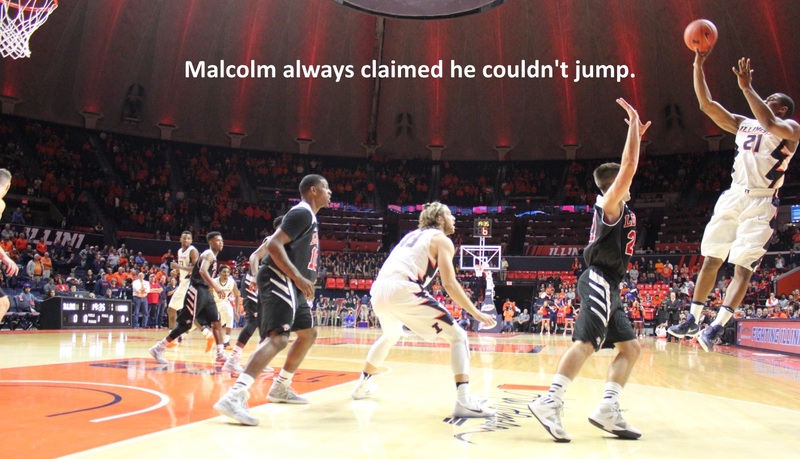 He was on the verge of becoming the story of the game. 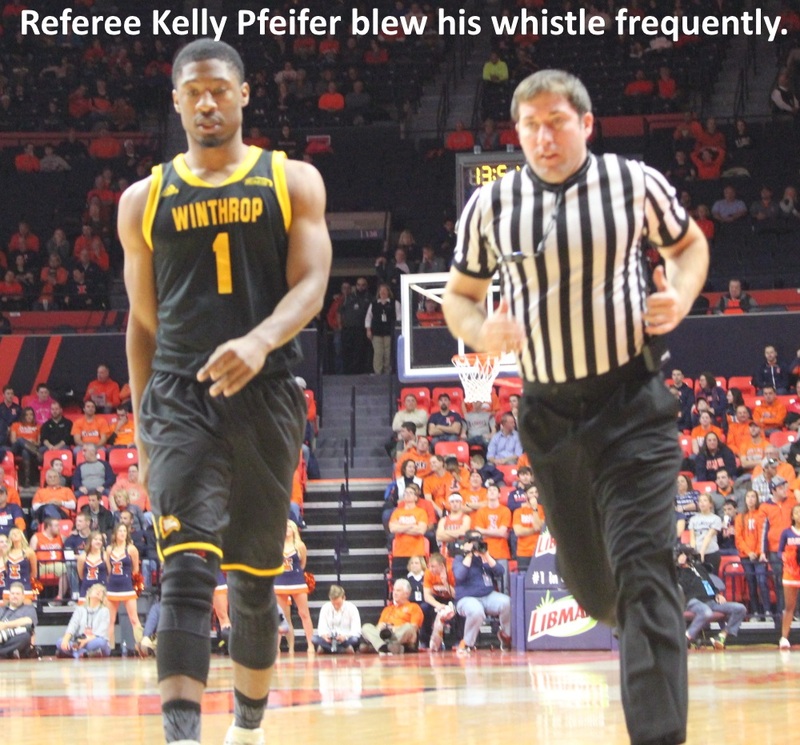 Terry Oglesby, perhaps sensing that Pfeifer shouldn’t be the only official to use his whistle, ramped up his whistling game. 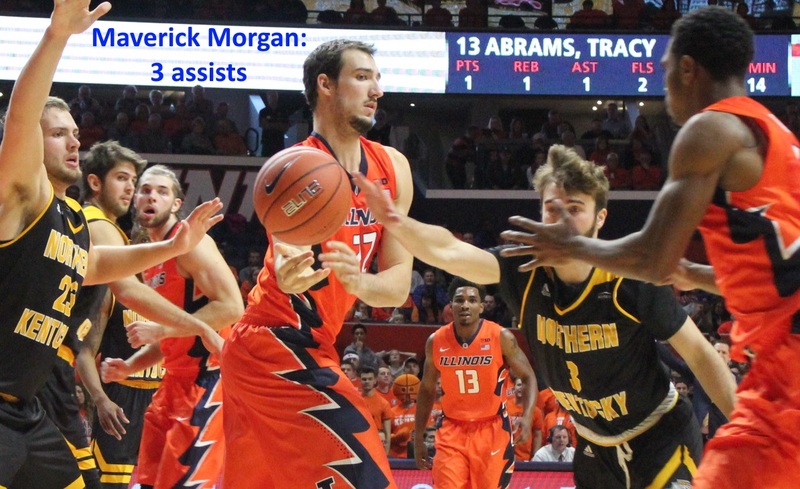 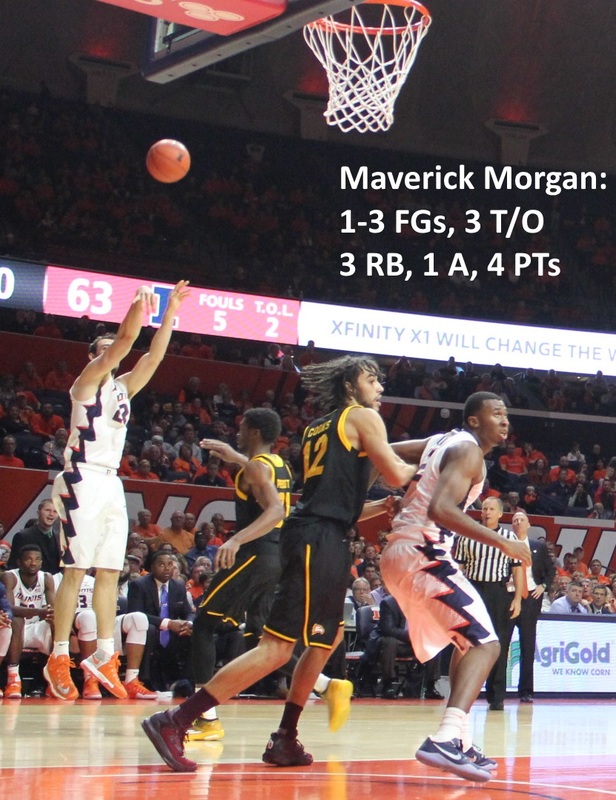 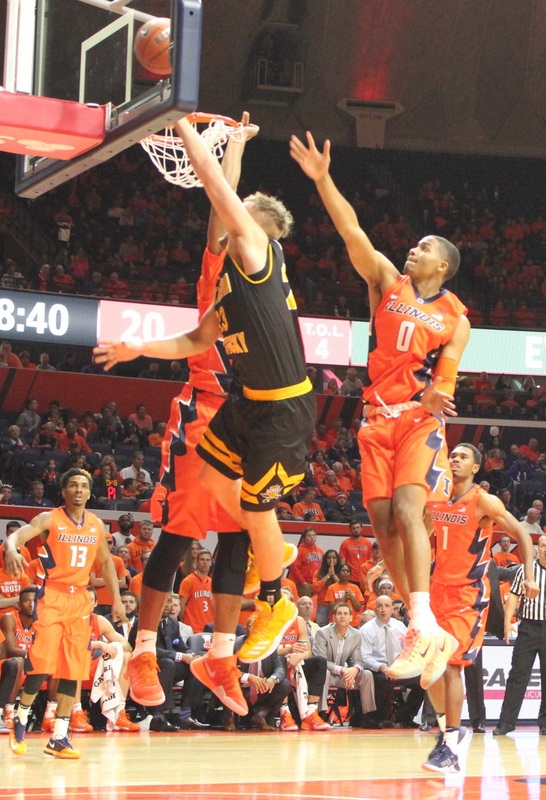 Big guys were disproportionately affected, and Illinois’ height advantage disappeared when Maverick Morgan went to the bench with two early fouls. 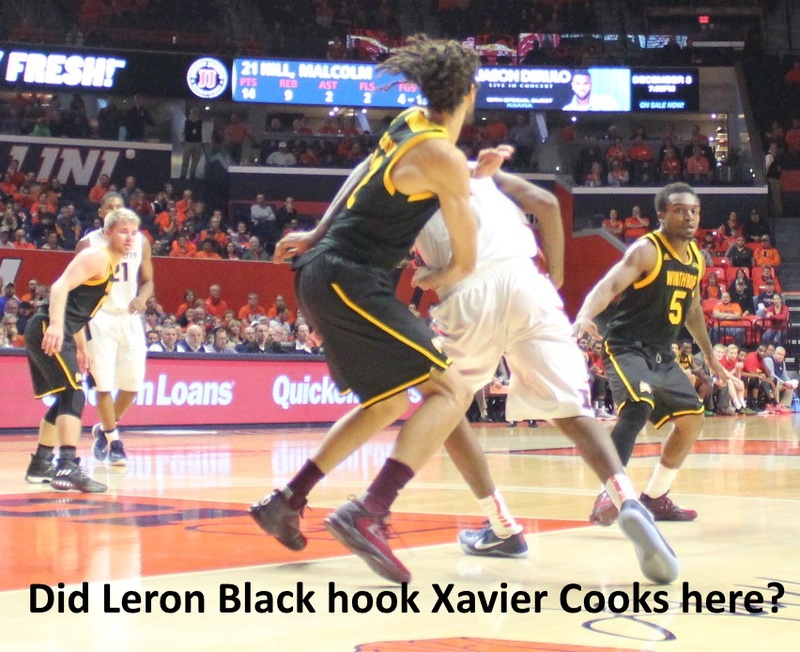 Leron Black entered the game, rusty, and picked up two of his own. 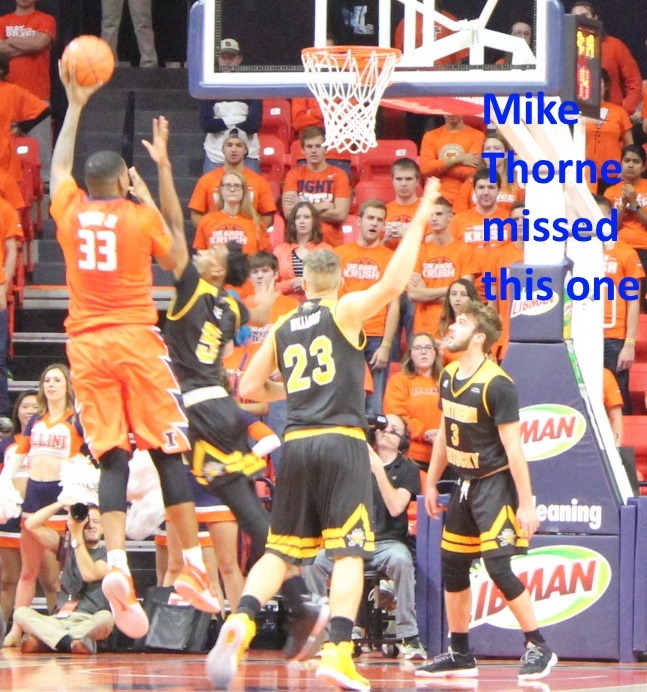 Same with Mike Thorne. 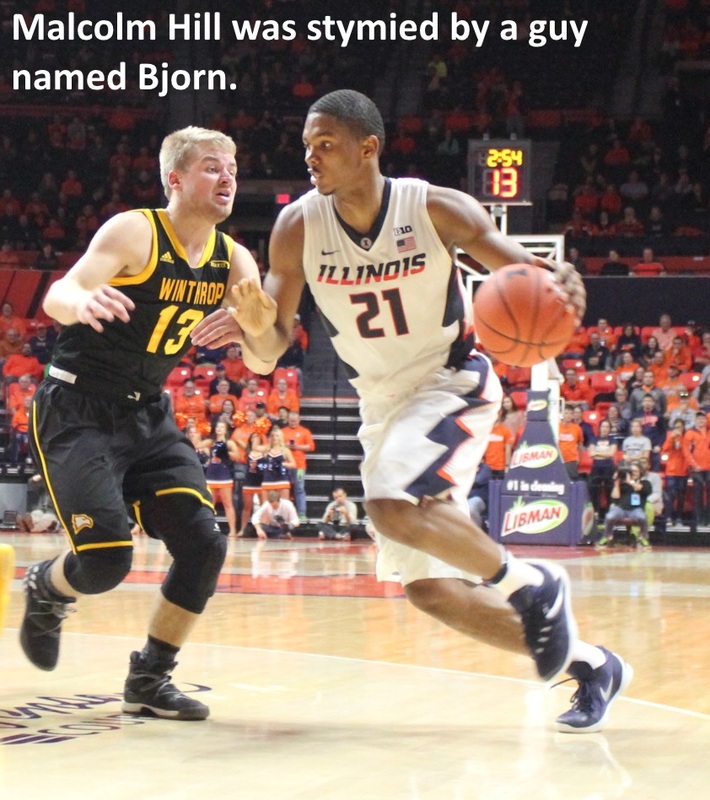 Contrast Johnson, by far the most aggressive player on the court. 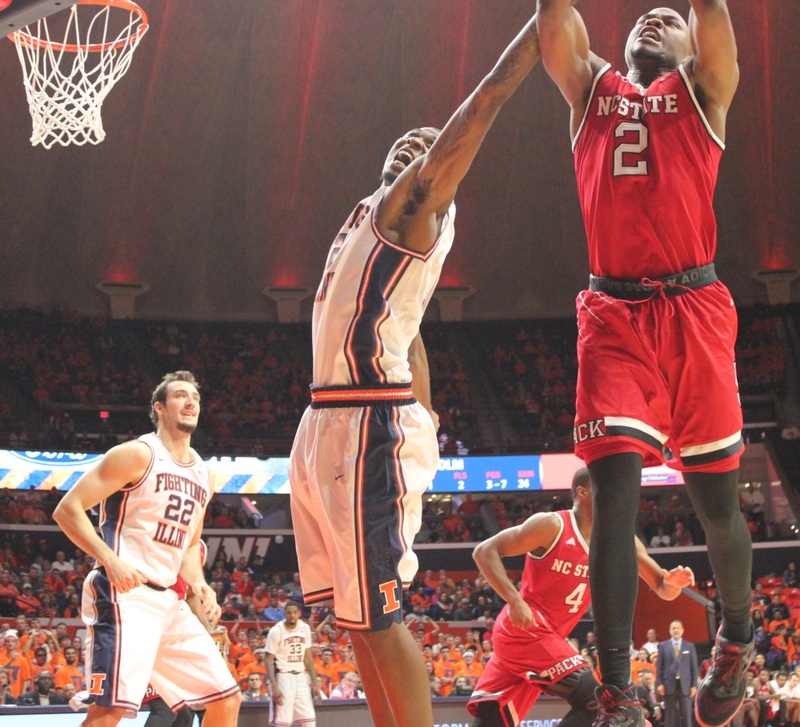 He finished the first half with 15 points and a single foul. 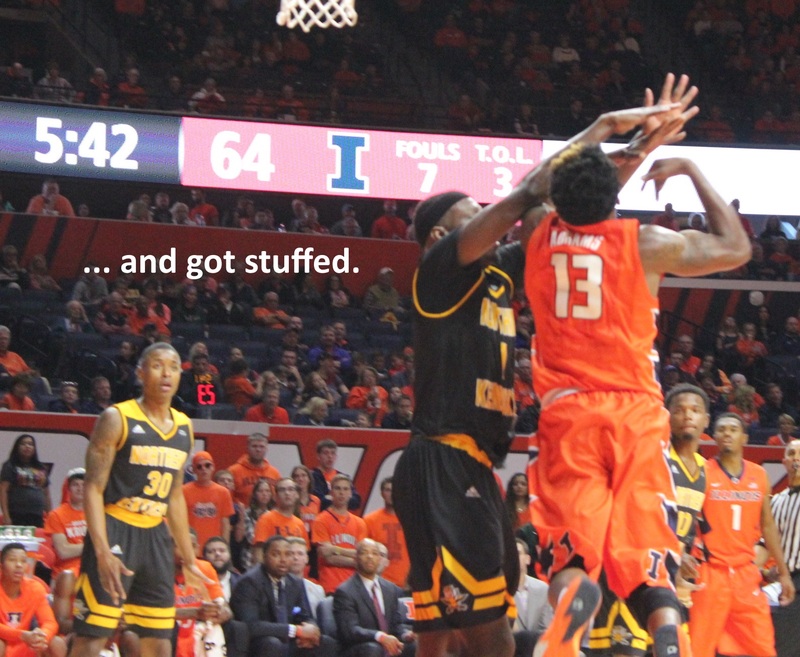 He earned another in the second half. 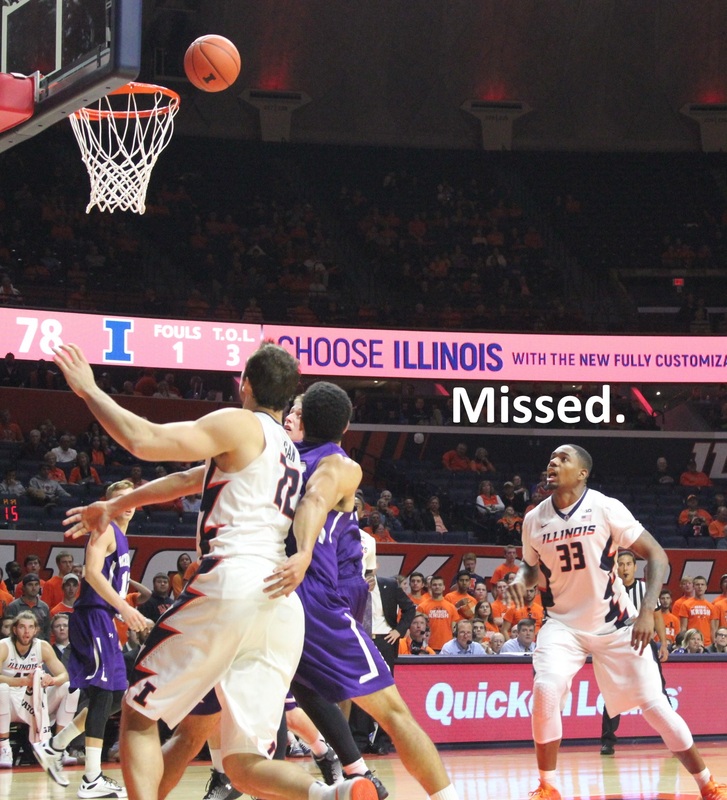 Still, Illinois should have won. 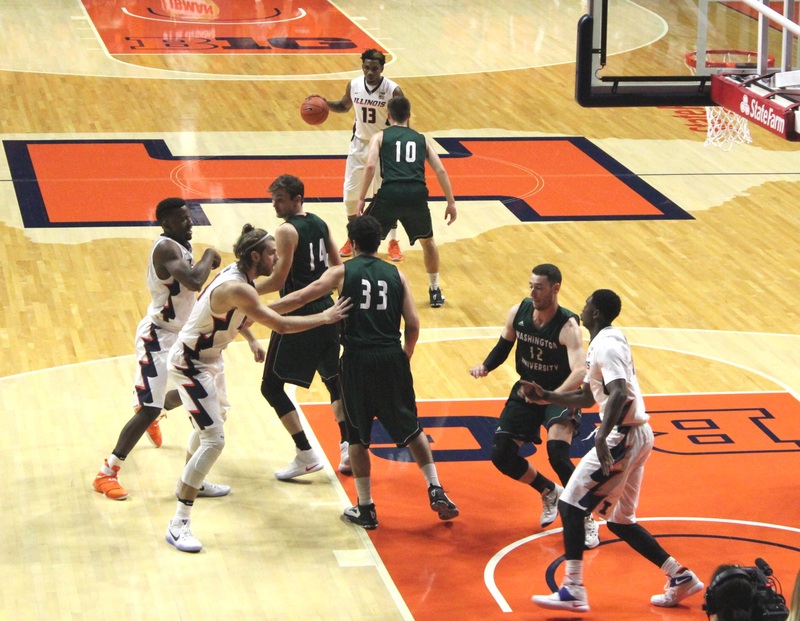 But as the clock ran toward expiry, John Groce ordered his team to take its collective foot off the gas. 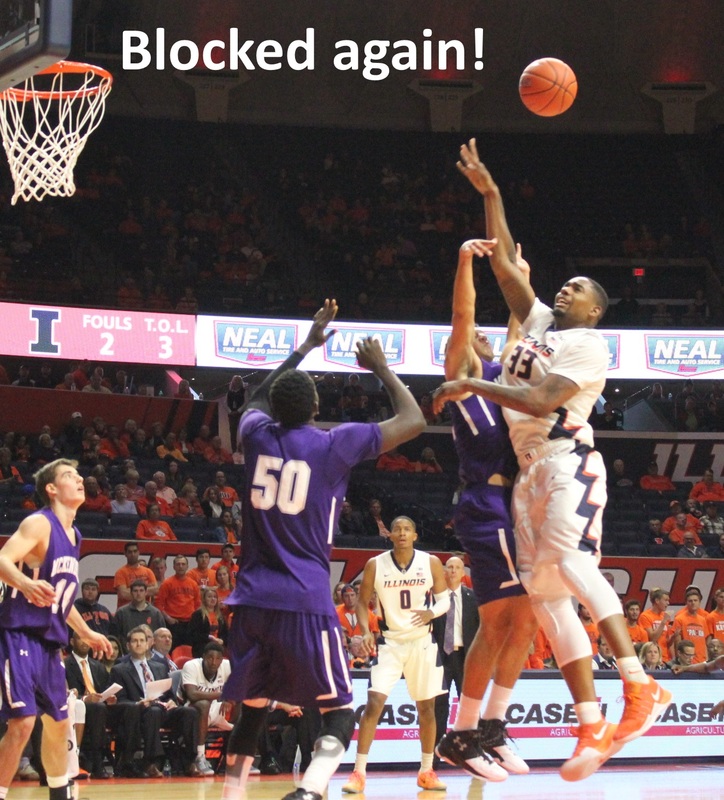 My first memory of Illini basketball features no players, no live action. 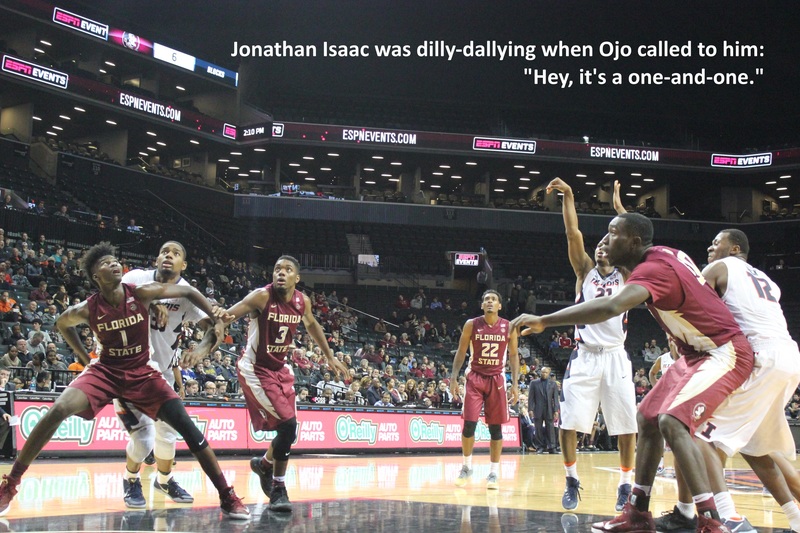 It was a criticism, spoken by a disgruntled fan. 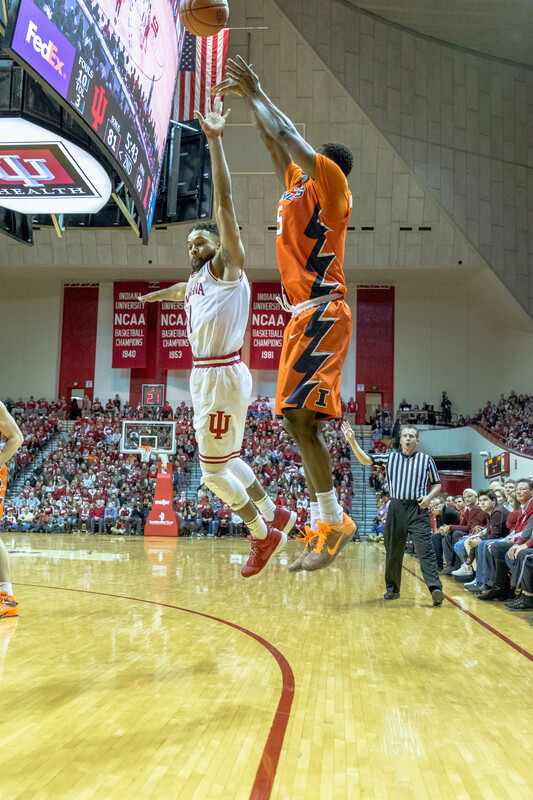 And then another one. 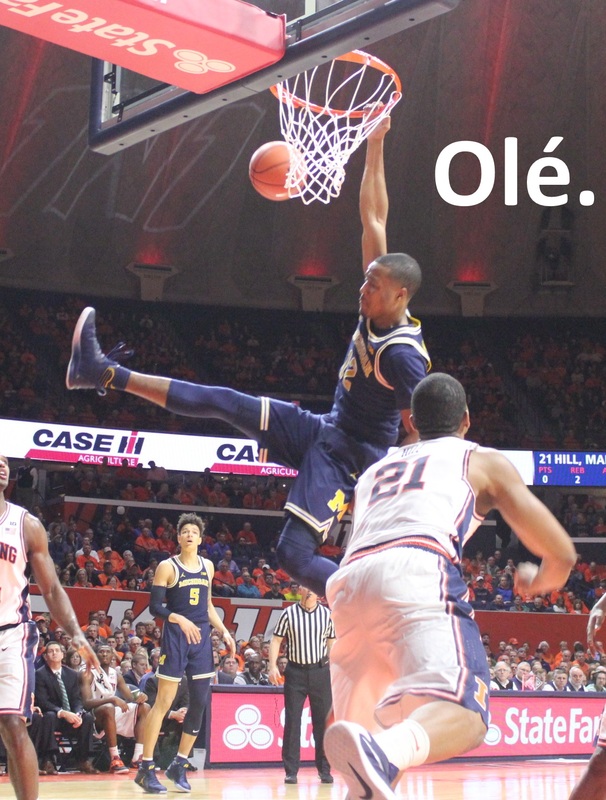 And then I remember my dad saying the same thing. 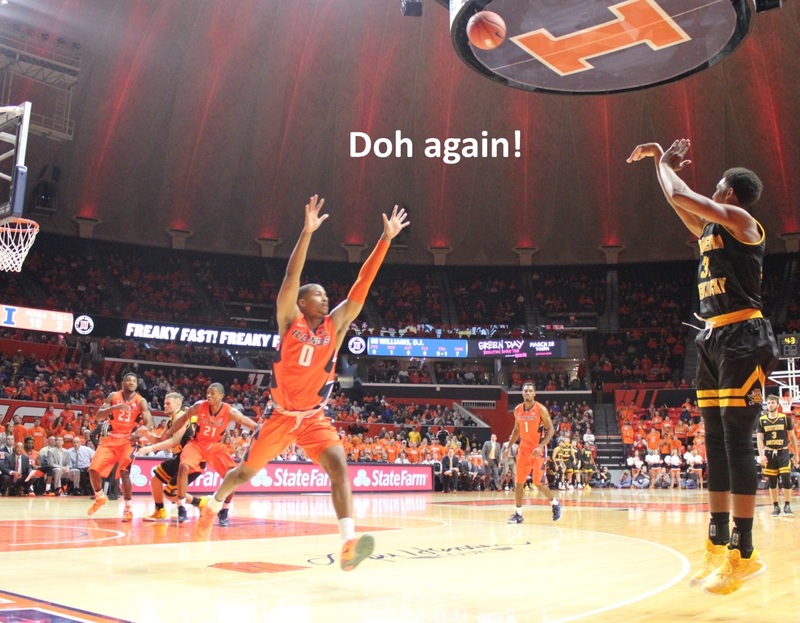 Being a tot, I interpreted the criticism literally. 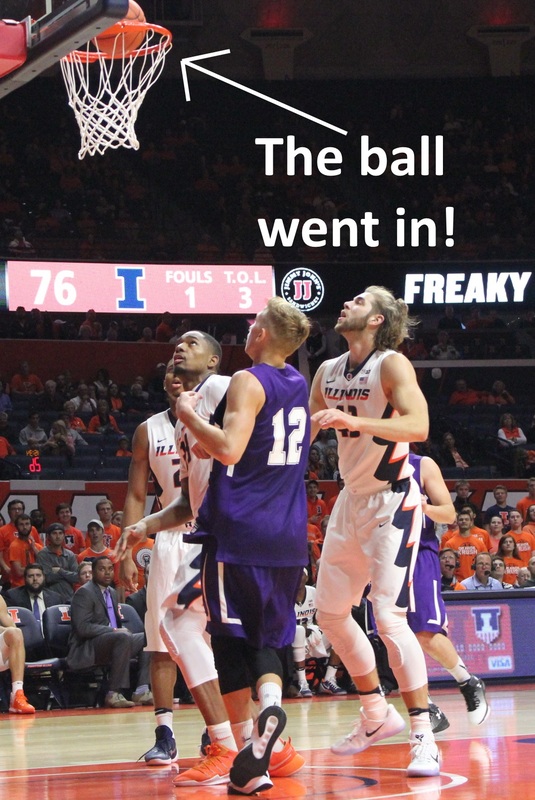 They were tired of Lou Henson’s “letting the air out of the ball.” I remembered it because it seemed absurd, not as a strategy, but as a literal interpretation. 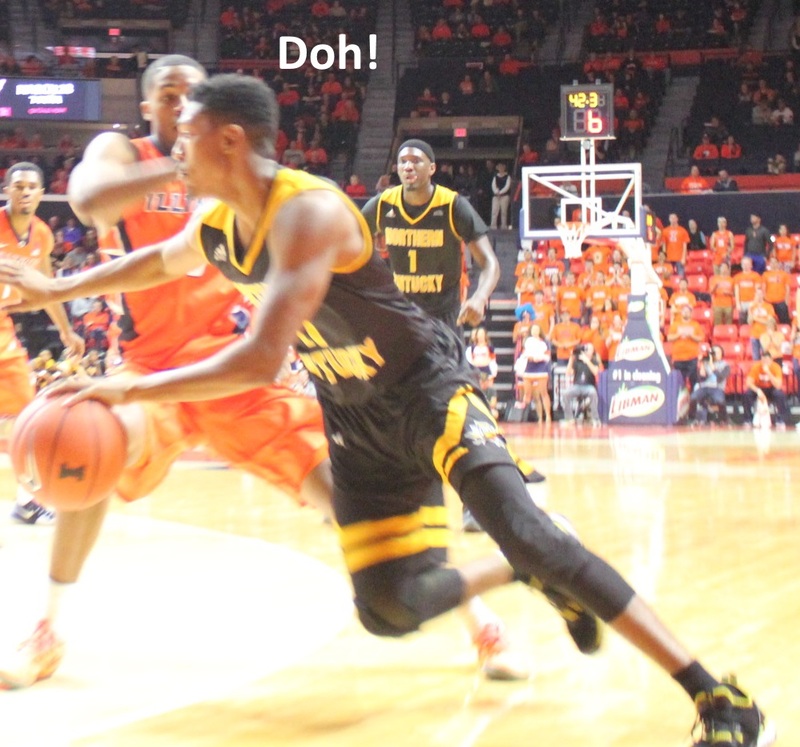 How could Henson get away with it, I thought? 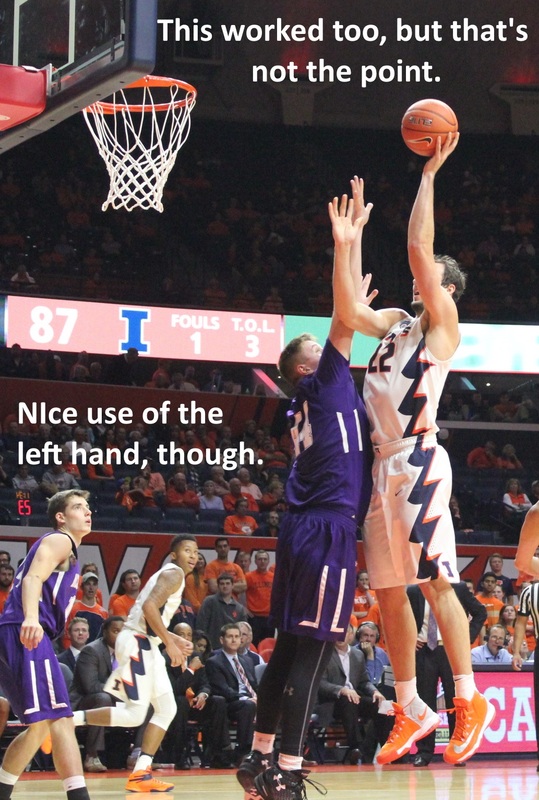 Wouldn’t somebody notice? 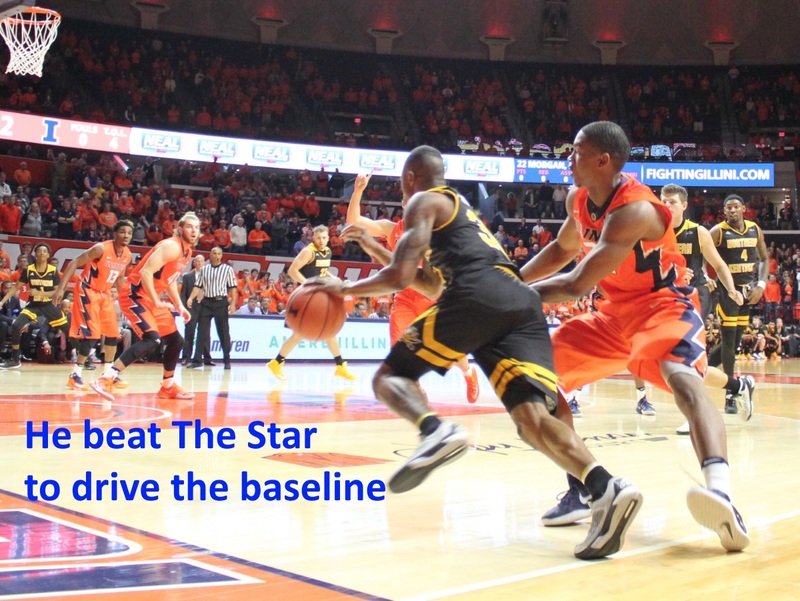 Today, the strategy still seems absurd. 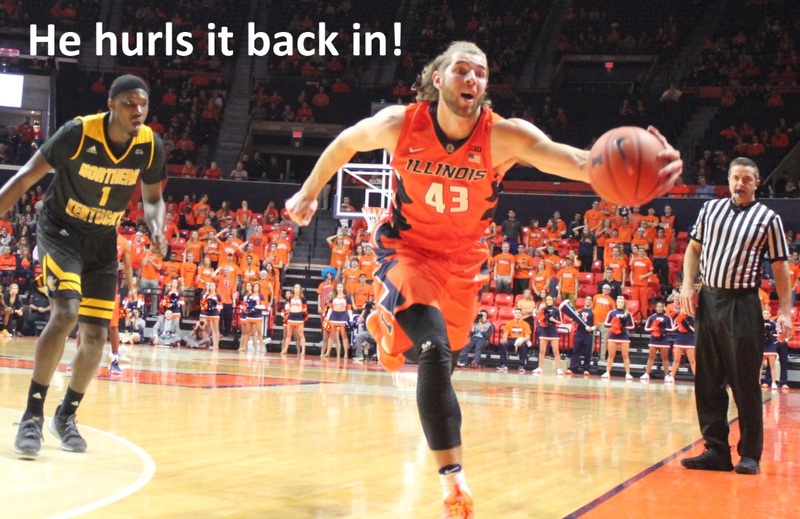 When a team gains a lead in a game, it’s done something right, right? 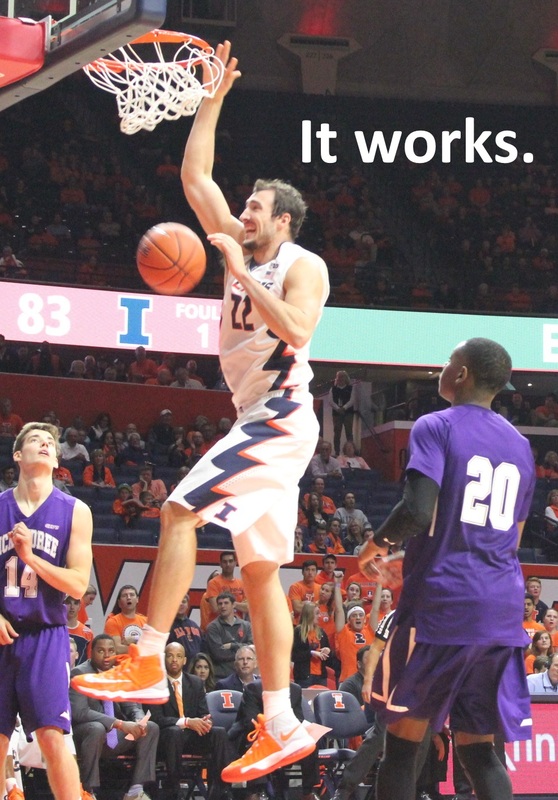 Whatever the game plan, it worked. 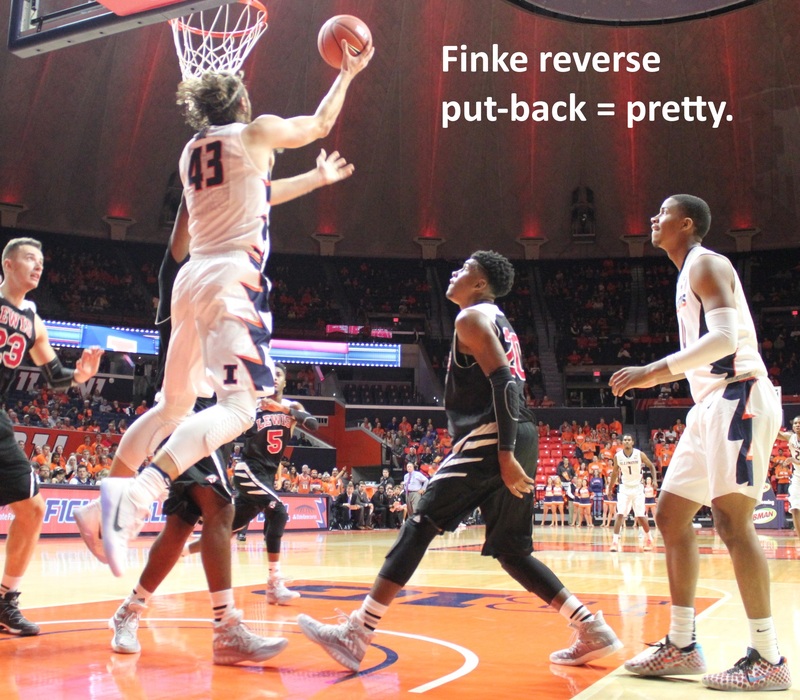 So why stop doing it? 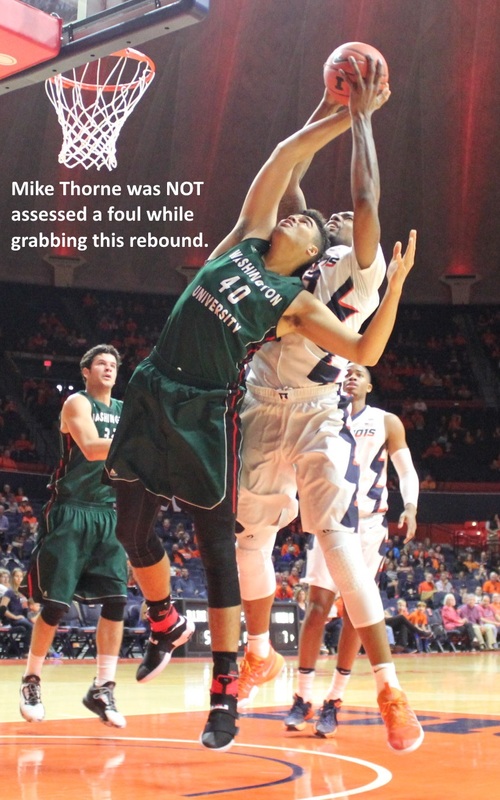 John Groce is my age, so he ought to know that “stall ball” is a bad idea. 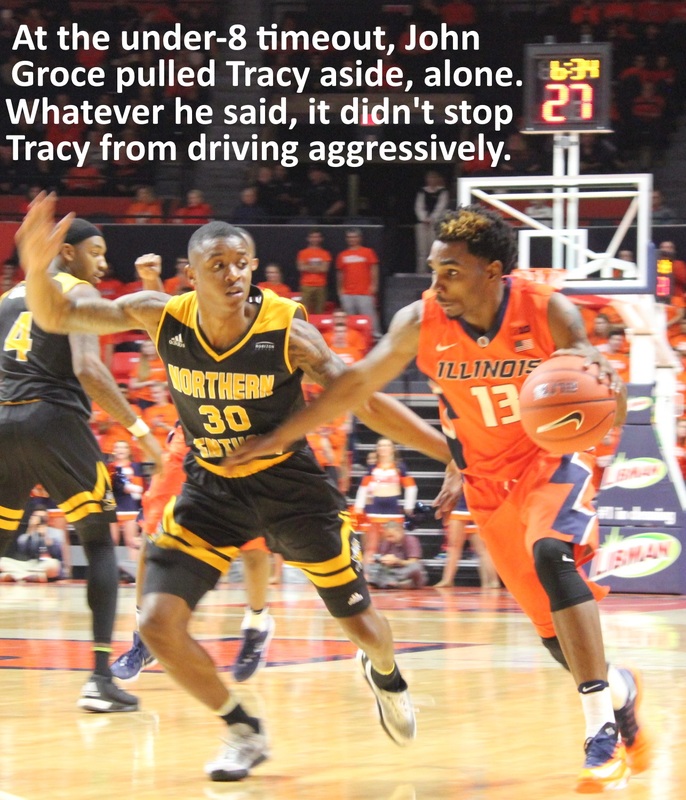 But Groce is a numbers guy, so there must be a data set that tells him to run down the shot clock, then heave a desperation shot once the defense locks down. 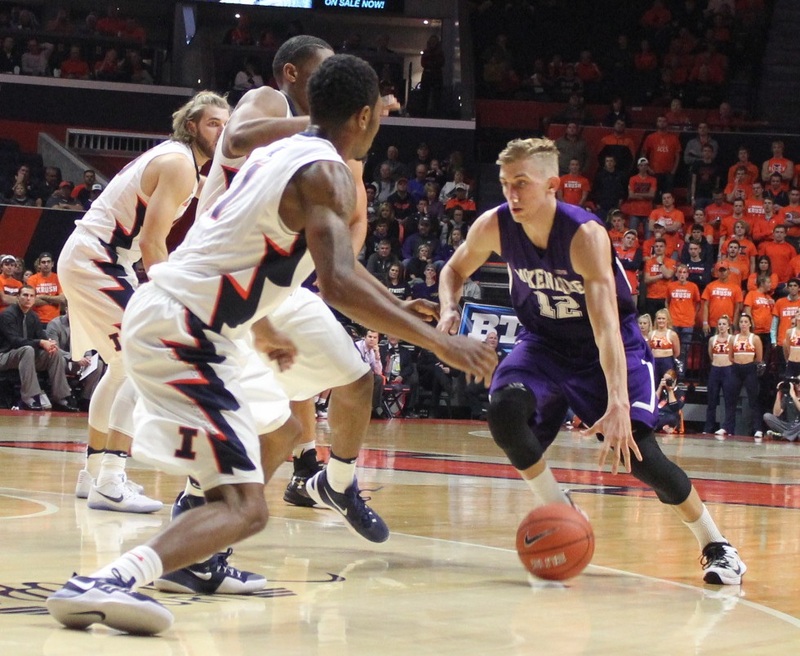 Bruce Weber employed the same terrible strategy, and it was a significant factor in his demise. 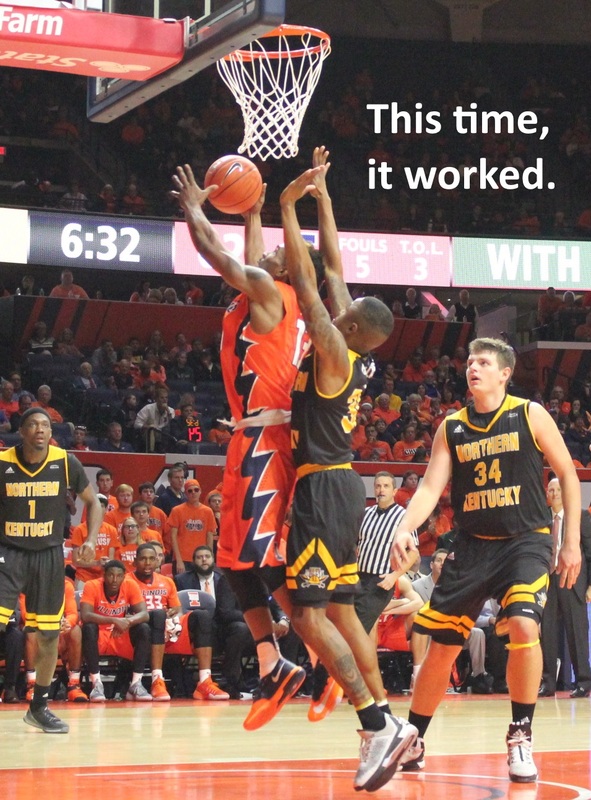 Up by ten points with less than four minutes to go, eating clock seemed like a good idea to John Groce. 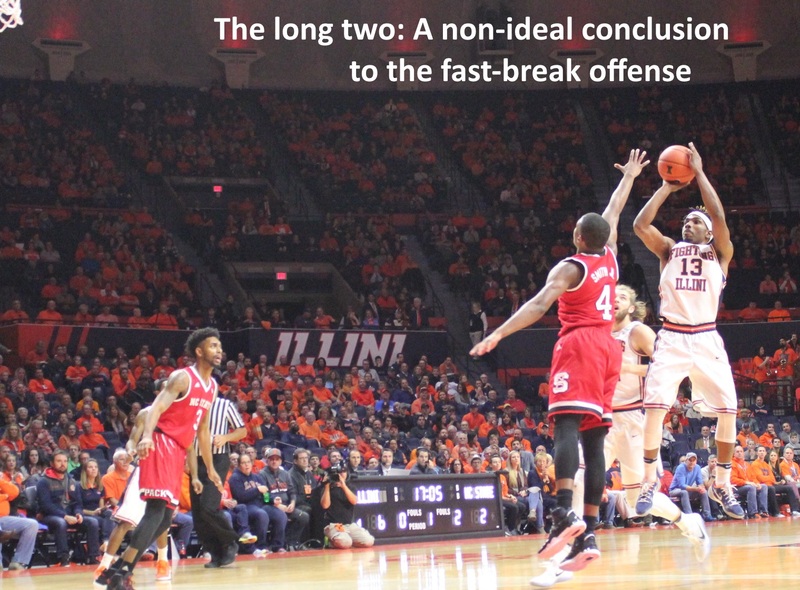 One team needed to score, and did so with a sense of urgency. 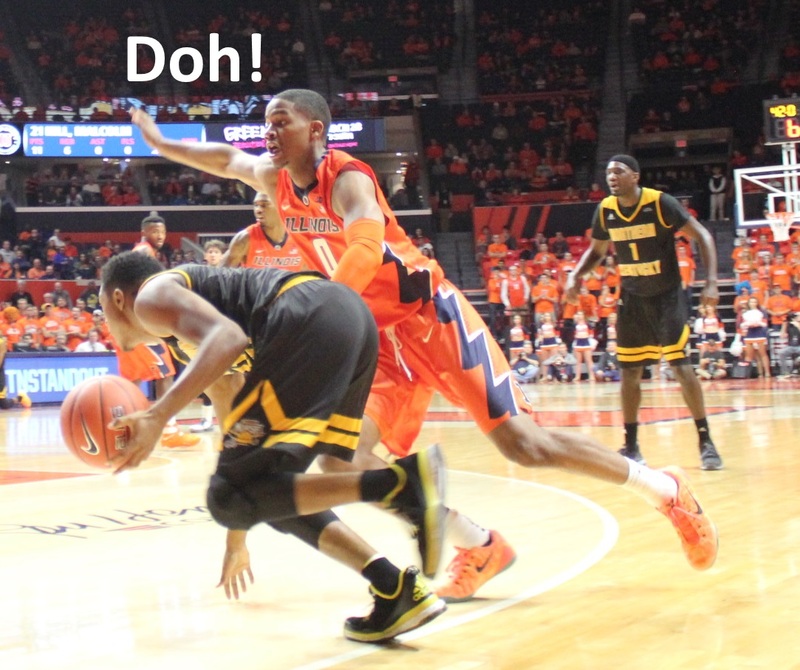 The other team dribbled a lot. 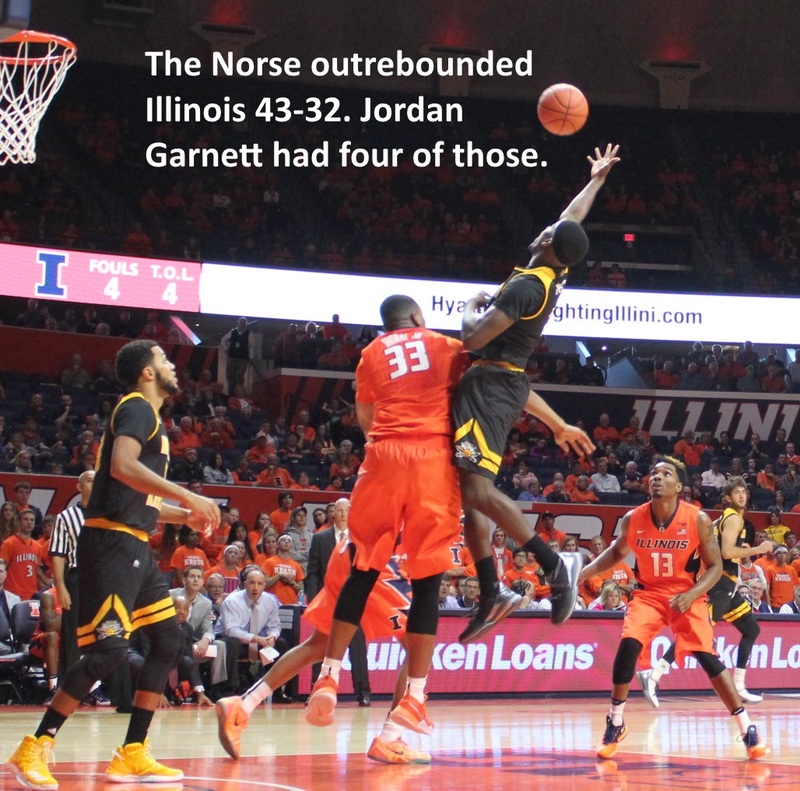 In the final 2:43, the urgent team scored ten points and took over the game’s momentum. 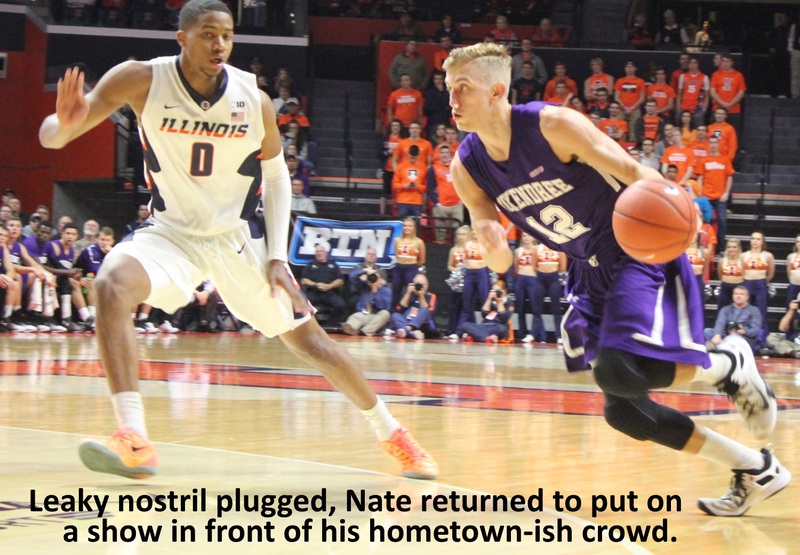 An already small crowd groaned. 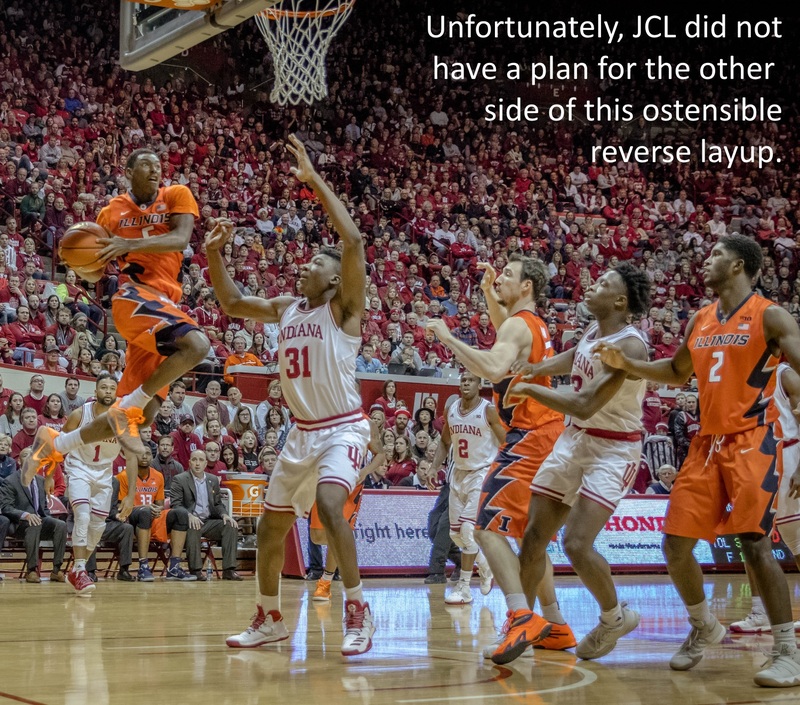 They’ve seen this scenario play out many times in their collective lives. 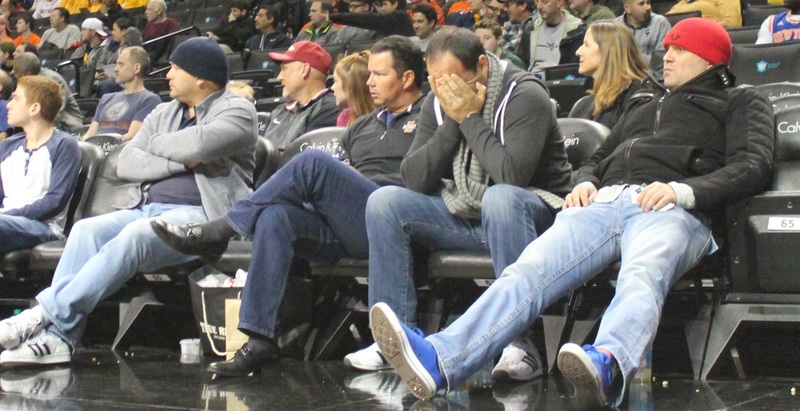 Even when the stalling team wins, the game becomes closer, more tense. 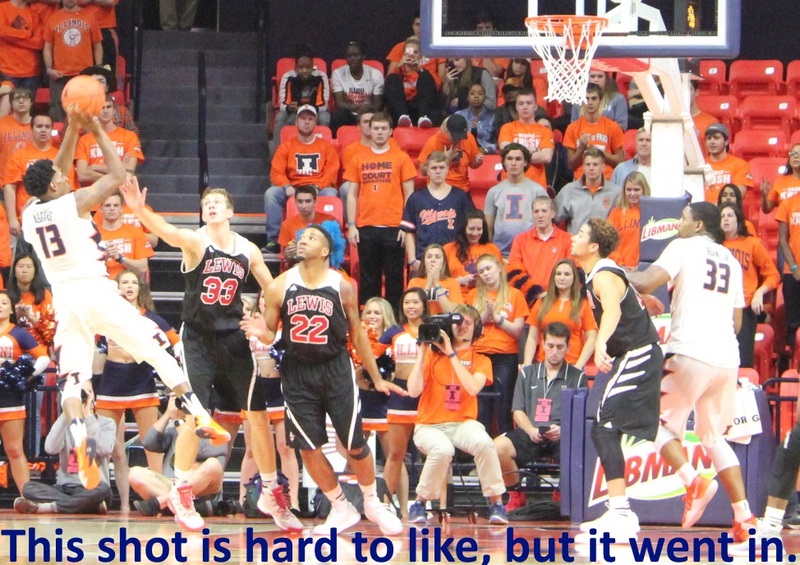 Fans don’t enjoy it. 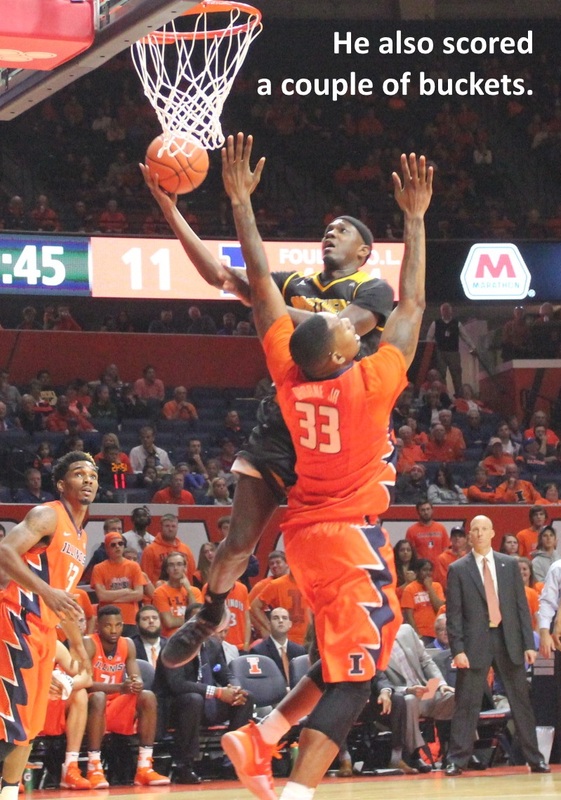 You’ll notice that Phil Ford threatened to drive to the basket. 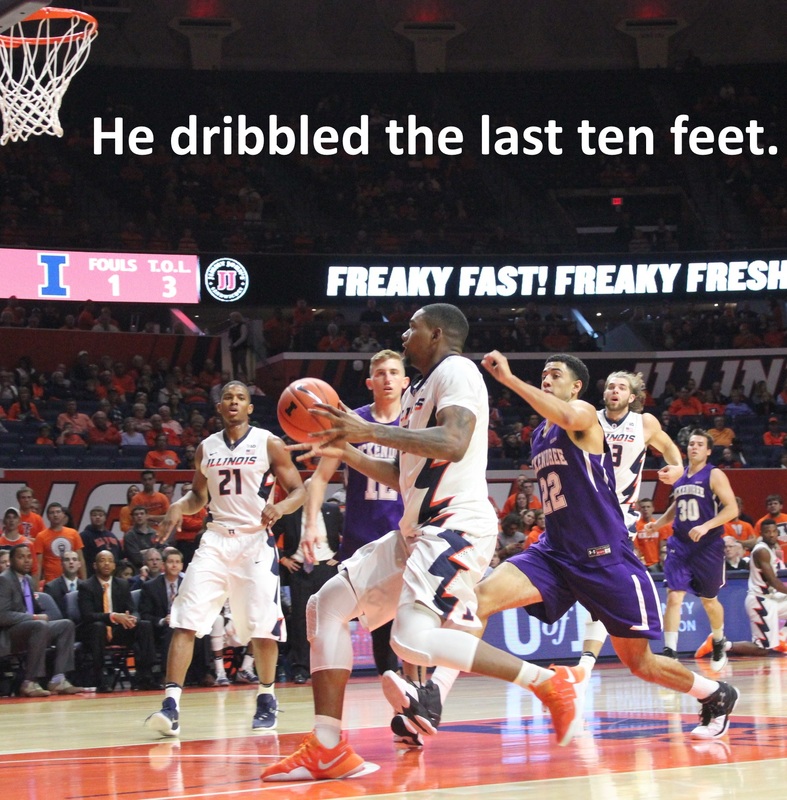 He didn’t just stand there, dribbling. 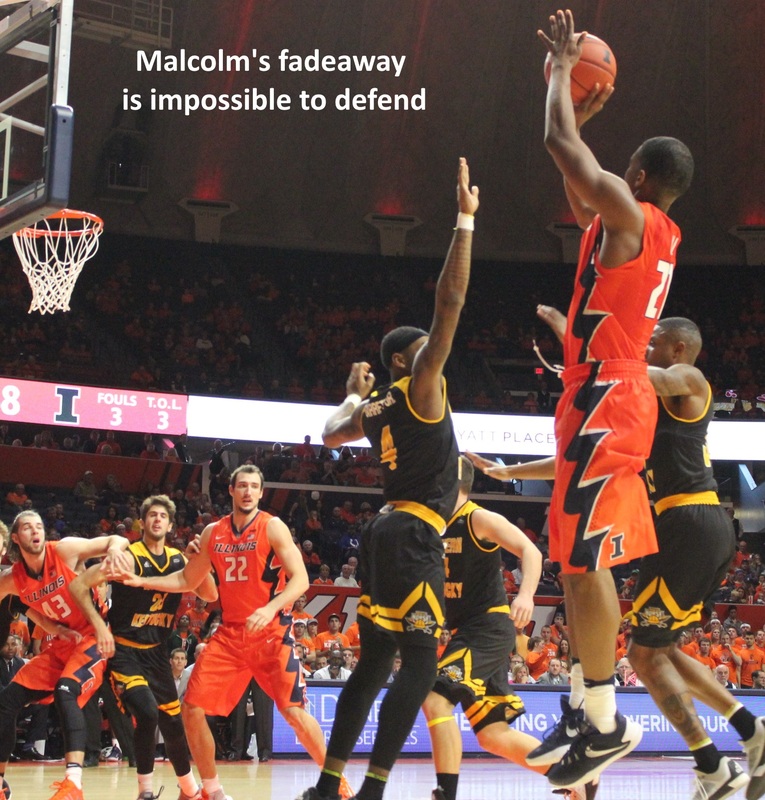 When the defense gave him an open look, he took it. 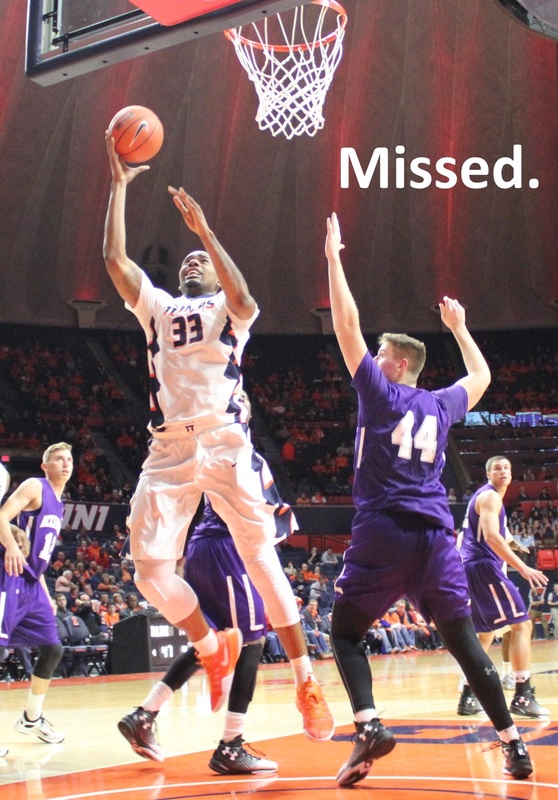 Monday night will be remembered for a long time. 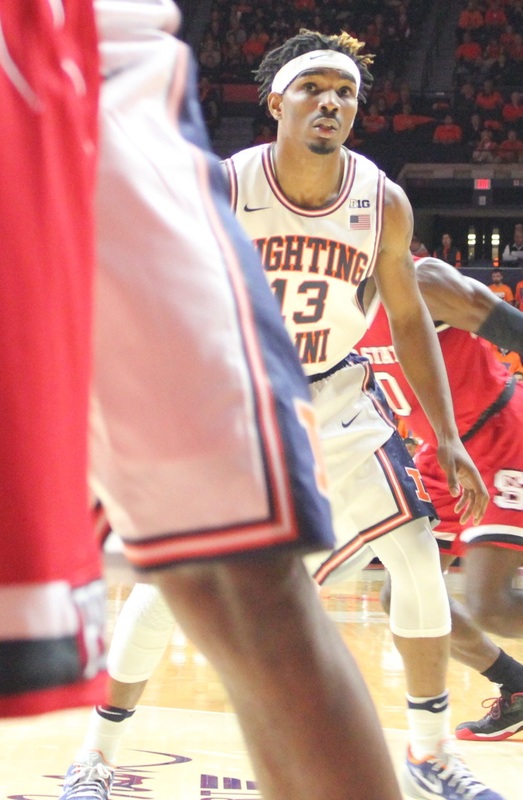 Keon Johnson’s performance was amazing. 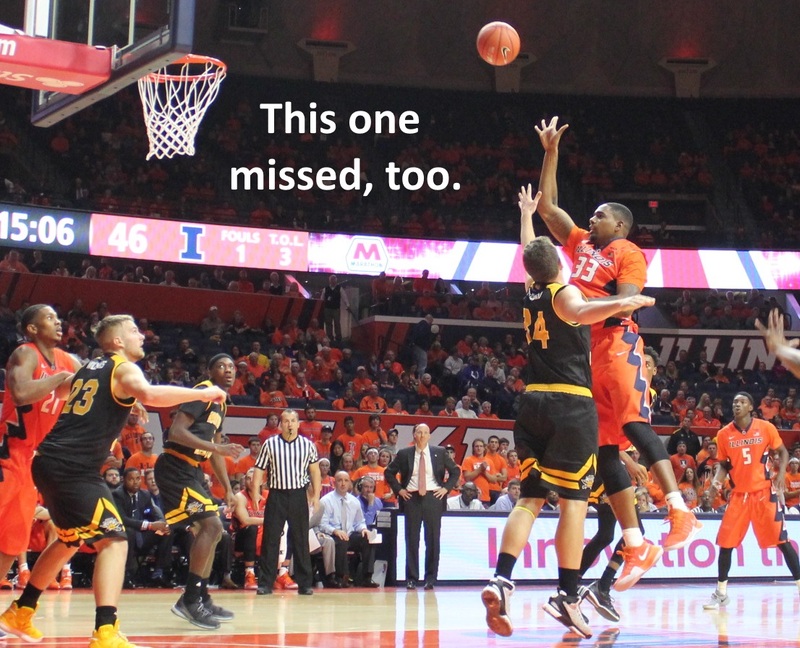 So was the Illinois collapse. 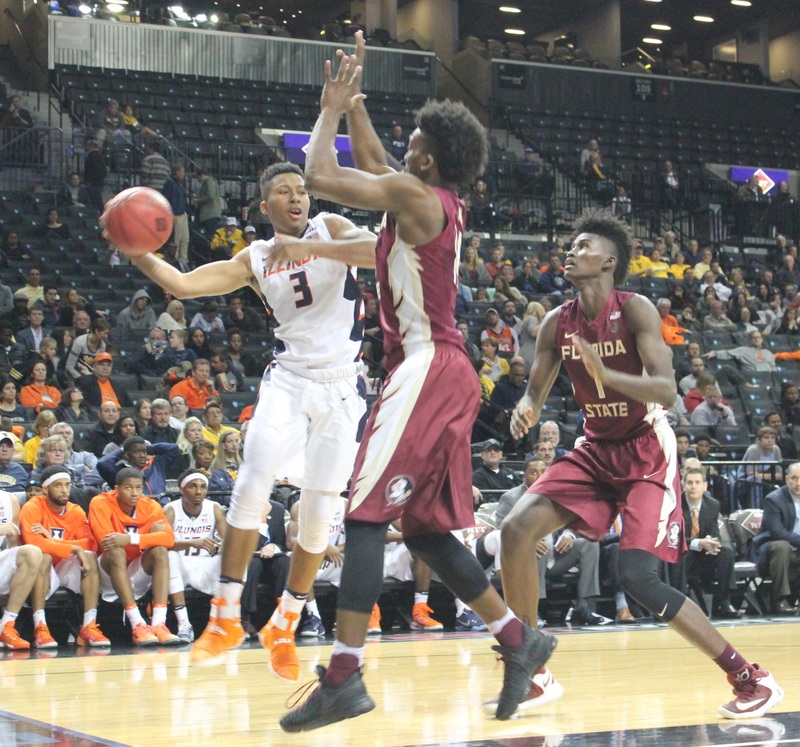 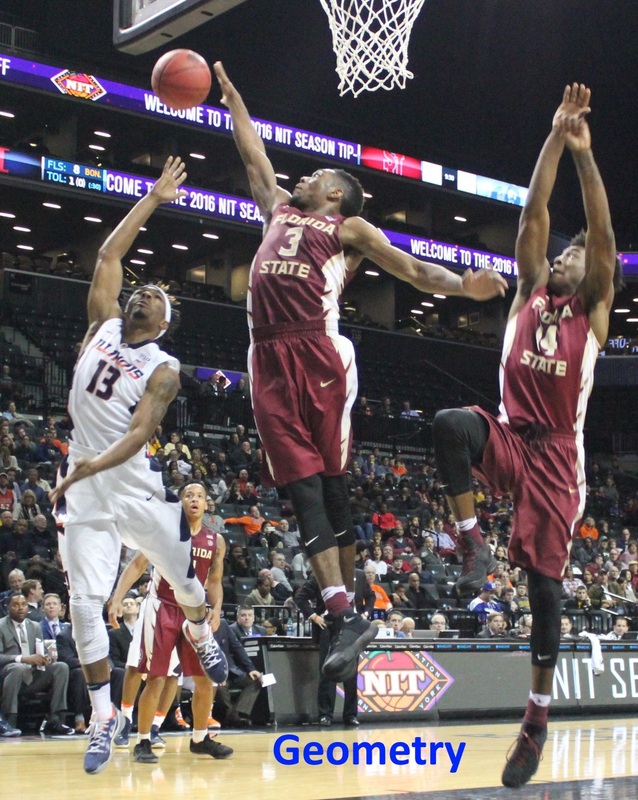 If the Groce era ends in the next sixteen months, the Winthrop game will be a talking point. 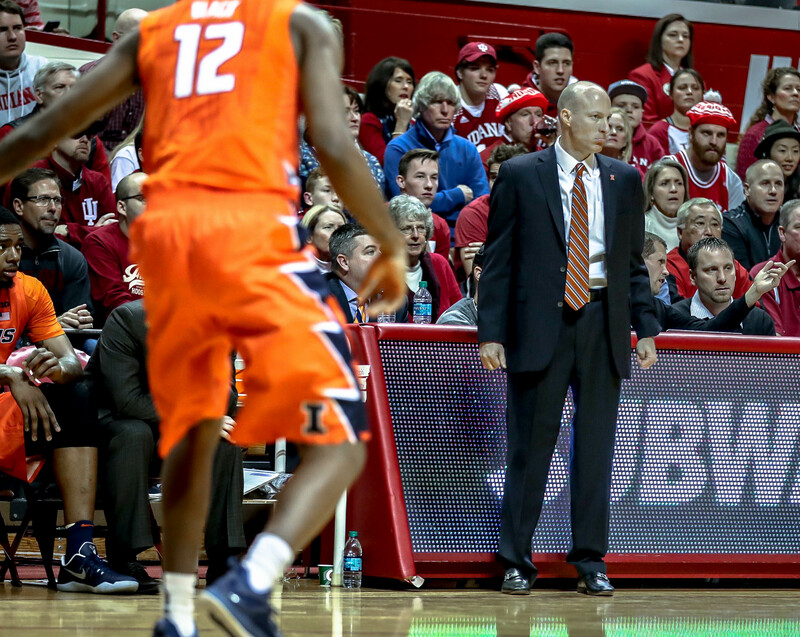 Player rotations, a frequent topic among Groce’s most outspoken critics, will be an issue. 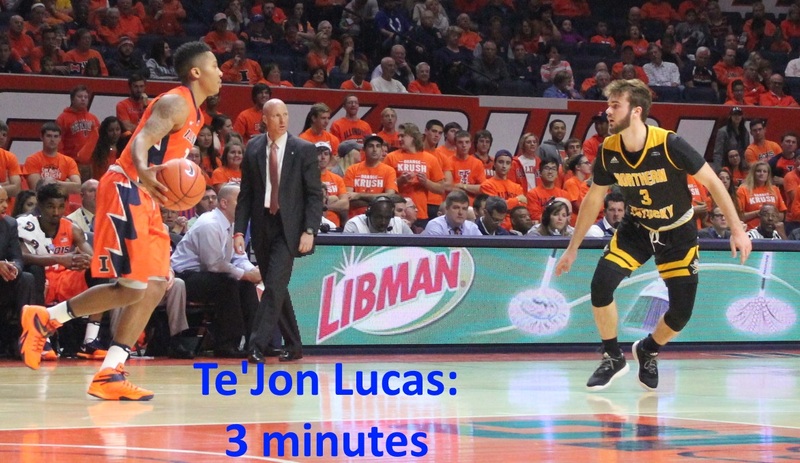 On Monday, Te’Jon Lucas did not play and D.J. 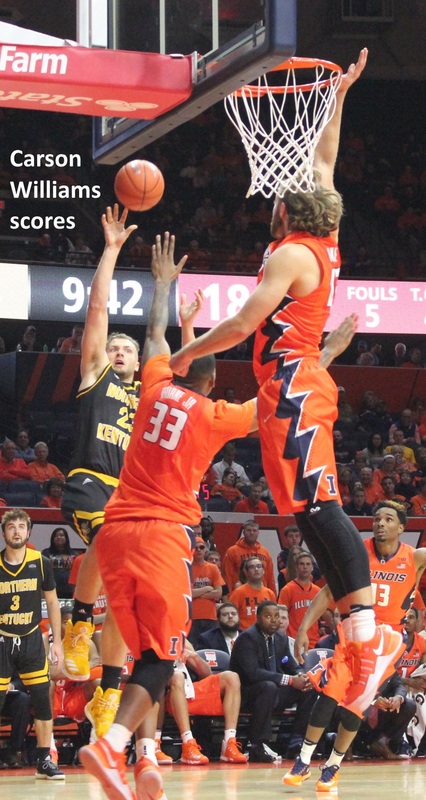 Williams got three minutes. 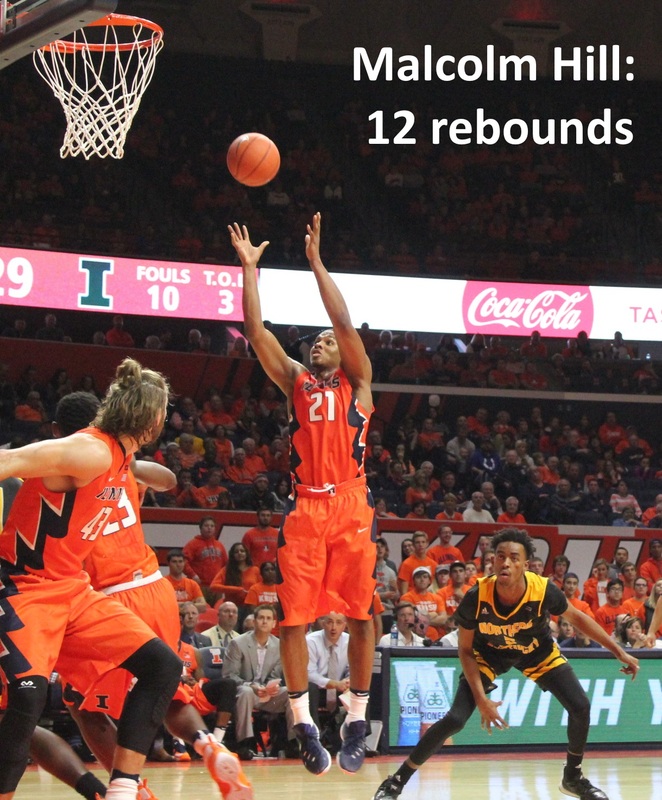 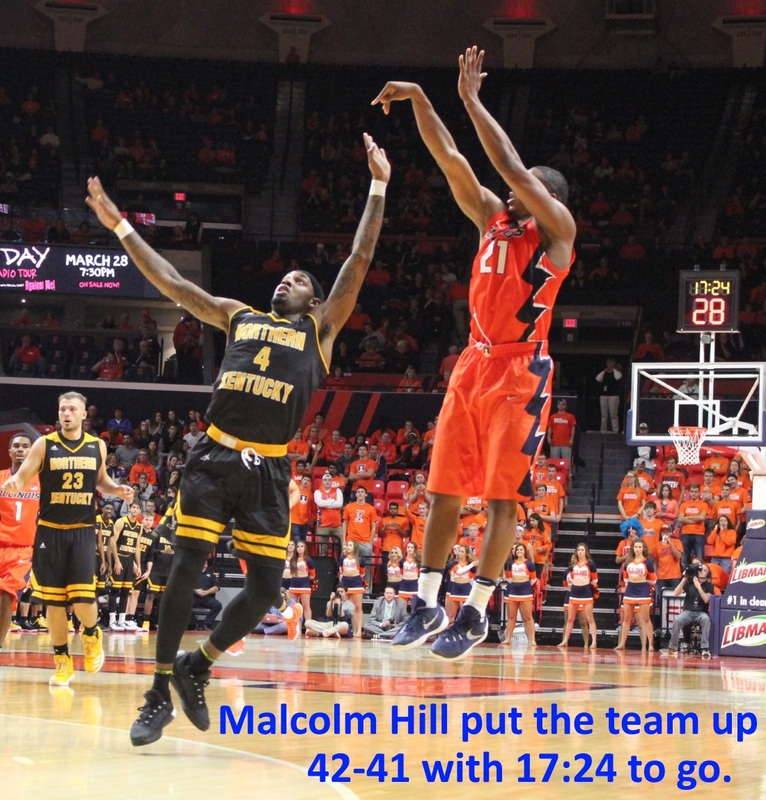 Malcolm Hill played 39, and connected on 0-of-10 two-pointers. 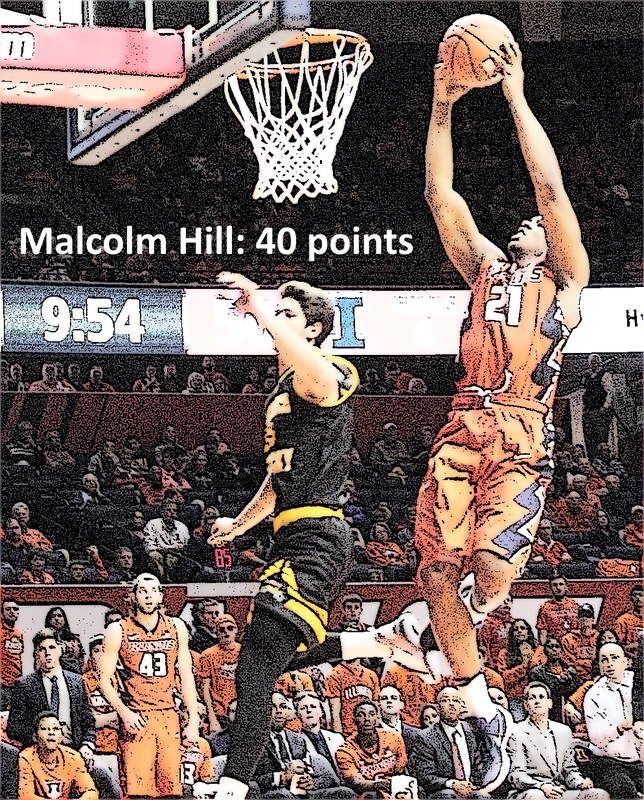 Was he fatigued? 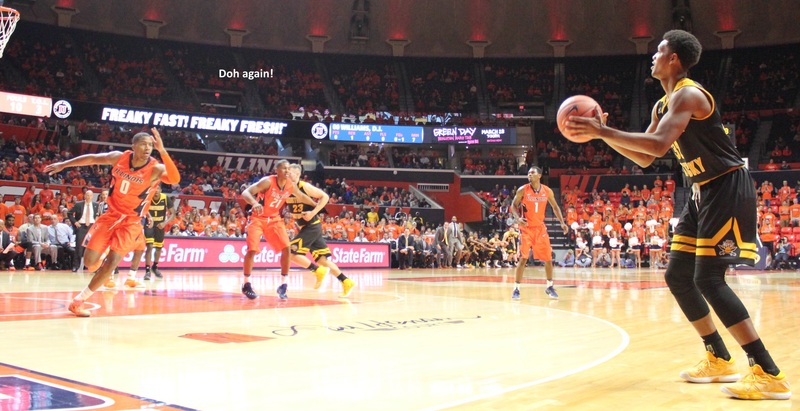 Jaylon Tate chased Keon Johnson around all night, but Lucas might have been able to help hold Johnson to 15-of-21 shooting. 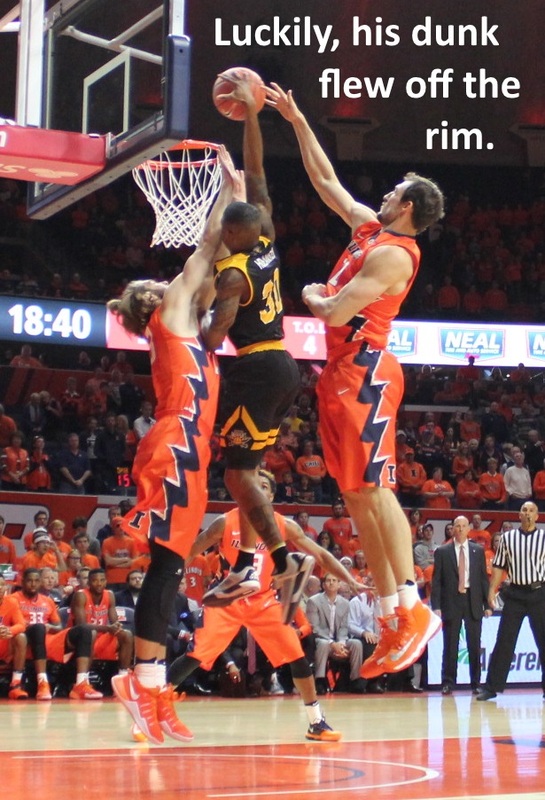 Frankly, no one could stop Johnson. 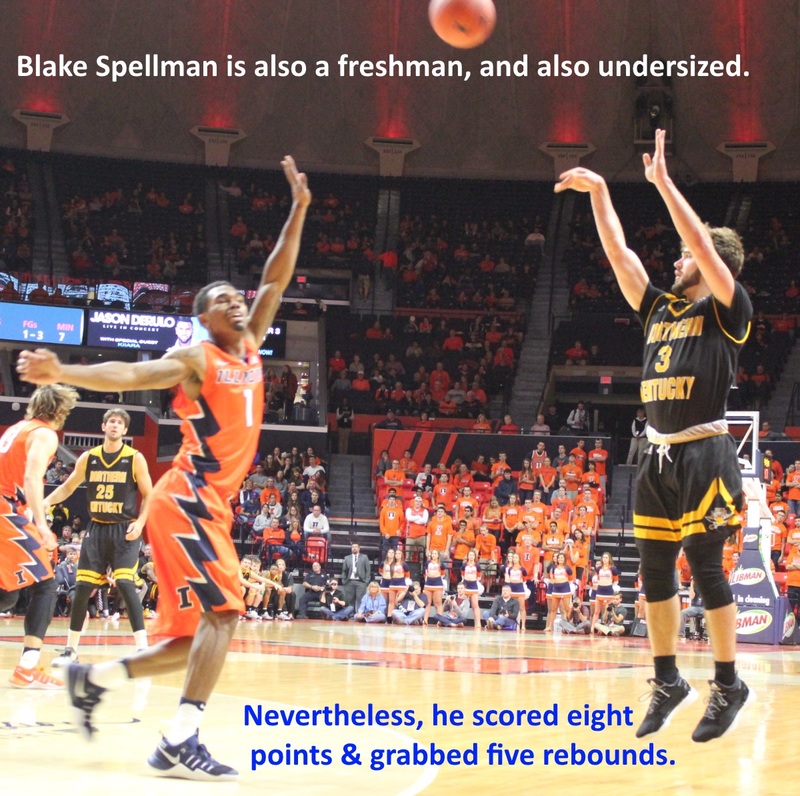 His game is incomprehensible to major college basketball players, because they never experience a 5’4″ spark plug. 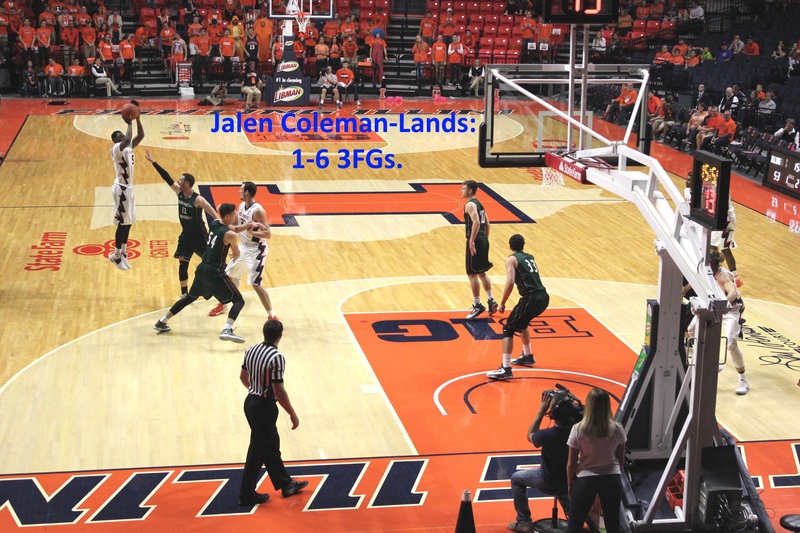 Instead of Lucas, Groce employed Jalen Coleman-Lands, where dead balls allowed, as an offense-for-defense substitute for Tate. 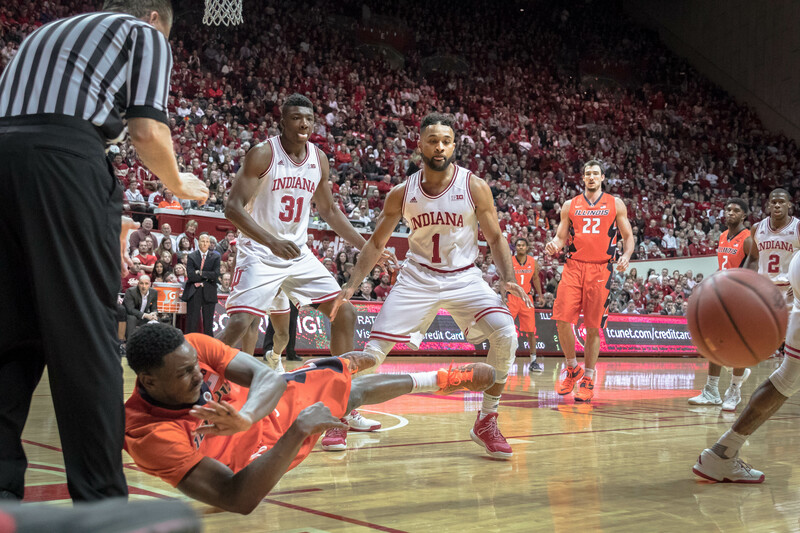 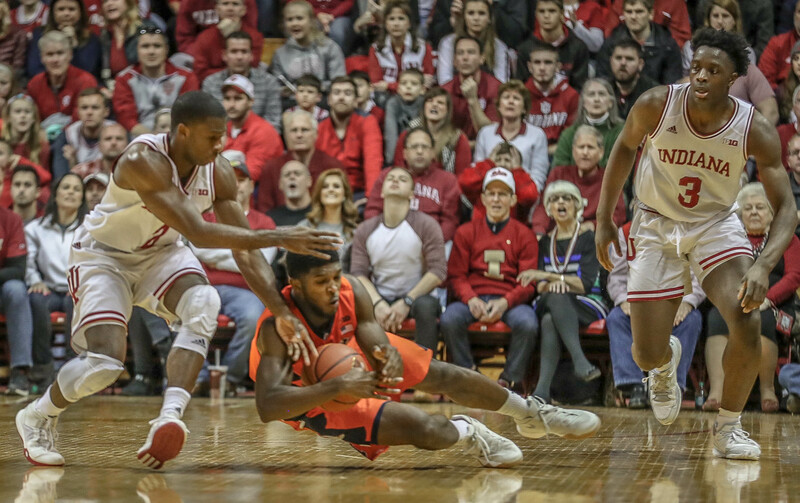 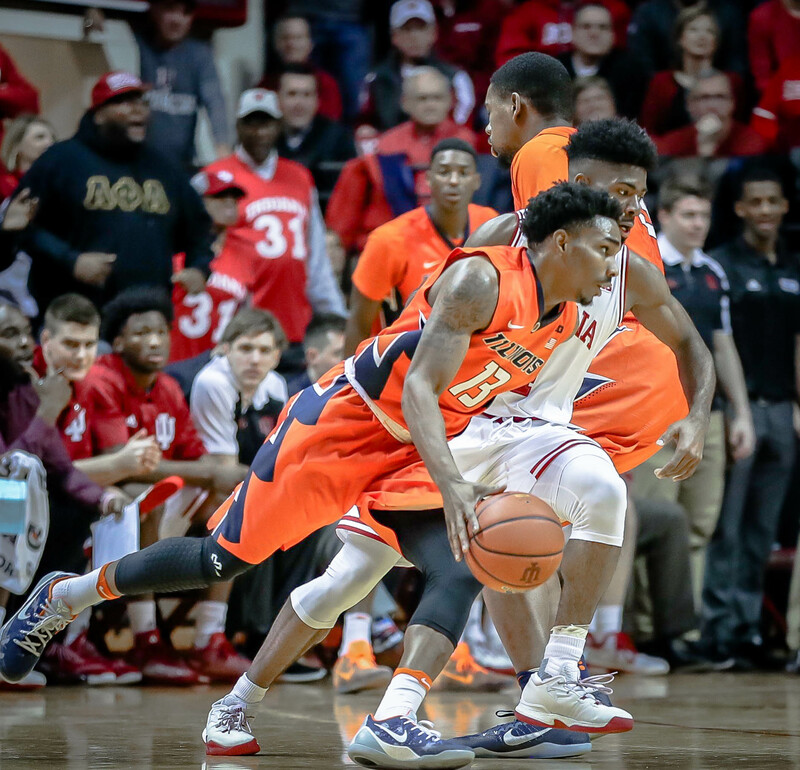 Groce did so even when Keon Johnson curled up in a heap, with a leg cramp. 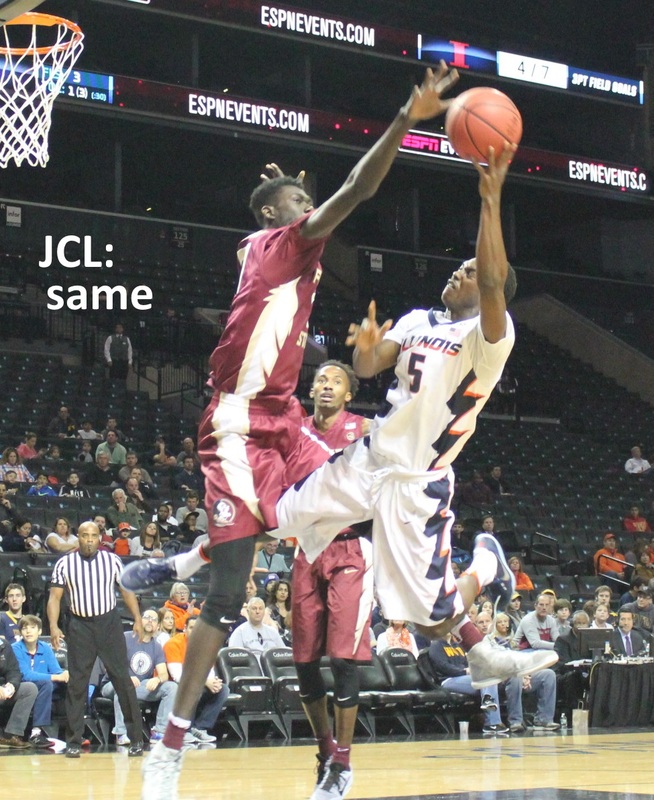 JCL was pretty scrappy in the endgame, BTW. 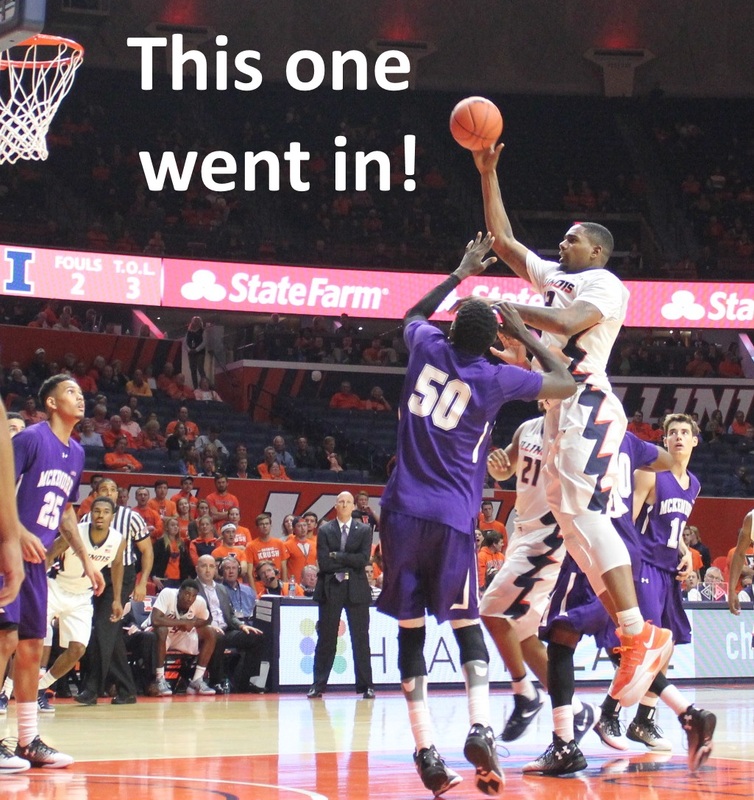 Everybody involved with Illini basketball had an off-night. 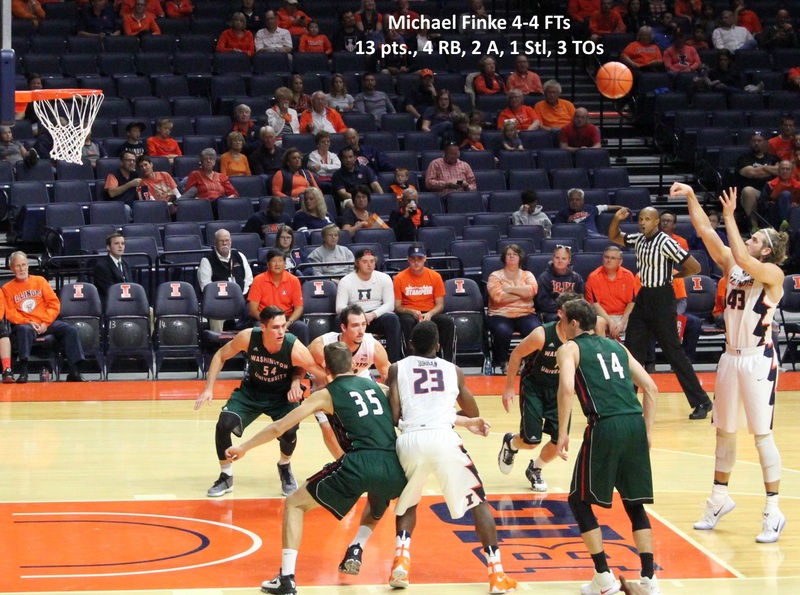 John Groce’s was the offest. 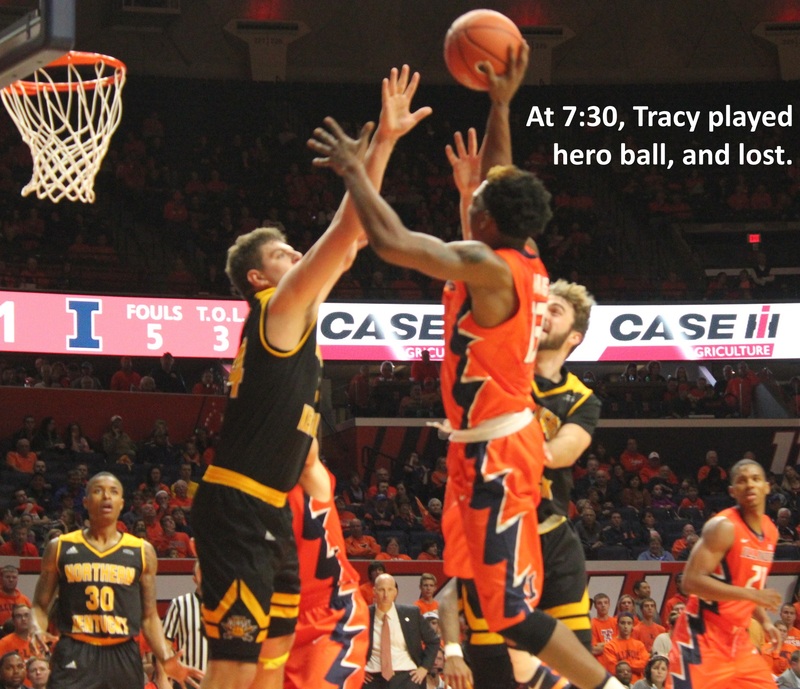 Te’Jon Lucas verballed his commitment to Illinois basketball six weeks after Tracy Abrams’s second season-ending injury. 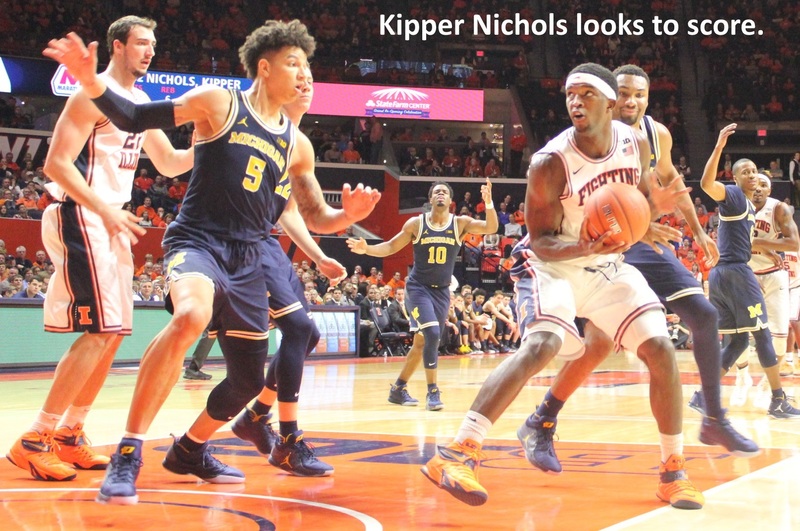 So he’s known all along that his freshman season would find him on a roster featuring two veteran upperclassmen at his position. 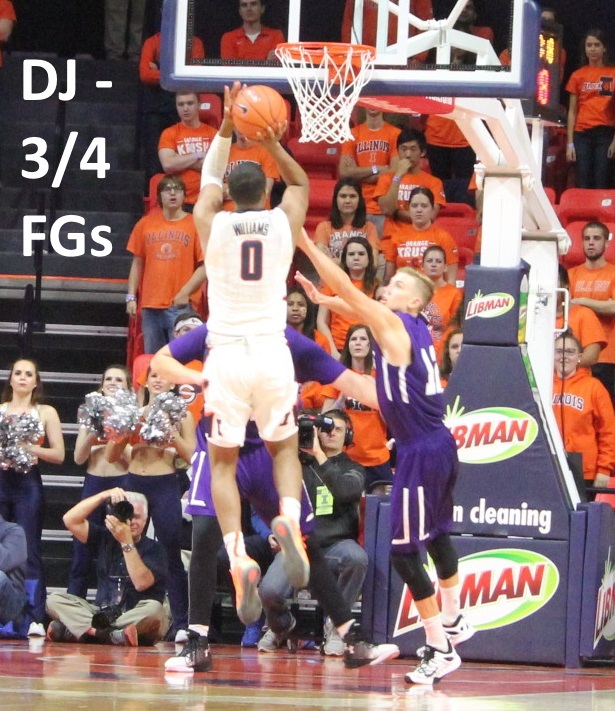 Maybe Te’Jon never regarded himself as Option 3 among the point guards. 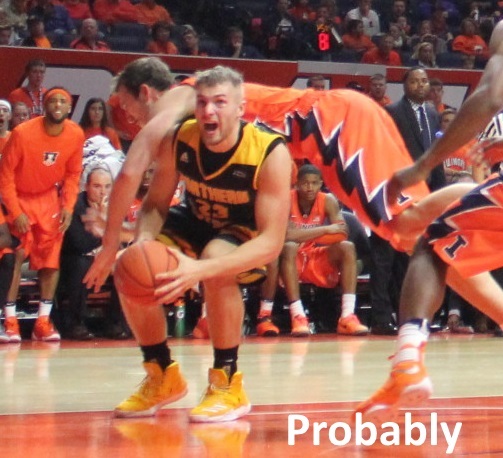 And maybe he’s not. 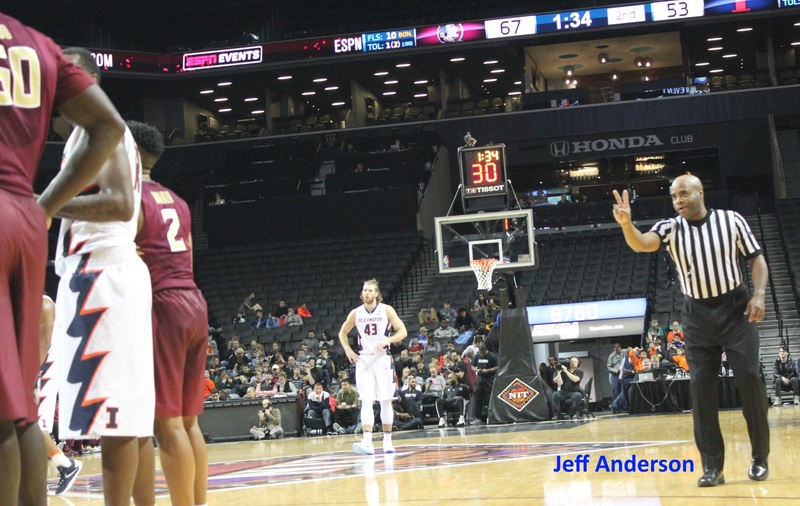 Ten days ago, he said the option of a freshman redshirt year has been discussed only by family members, and mostly because they weren’t up-to-speed on his recovery from a broken ankle in early February. 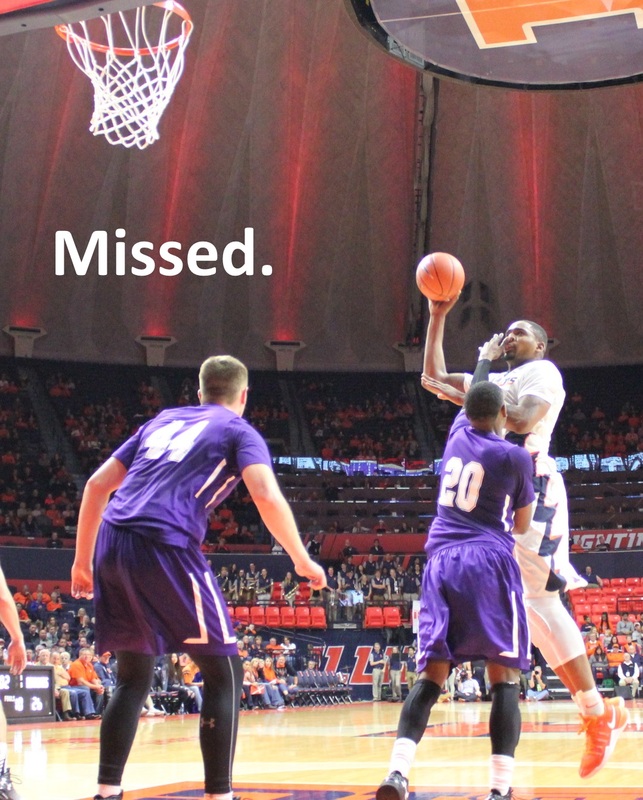 But whatever the depth chart, the Illini roster recalls one of the most intriguing (and in hindsight brilliant) strategic maneuvers in Illinois basketball history. 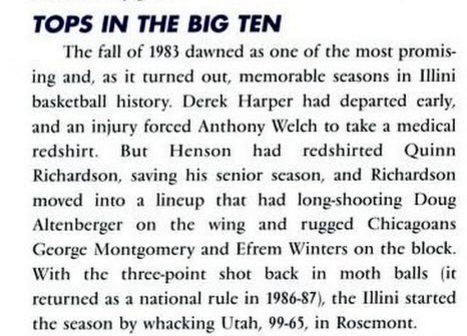 Lou Henson knew Derek Harper and Bruce Douglas were going to handle the ball in 1983. 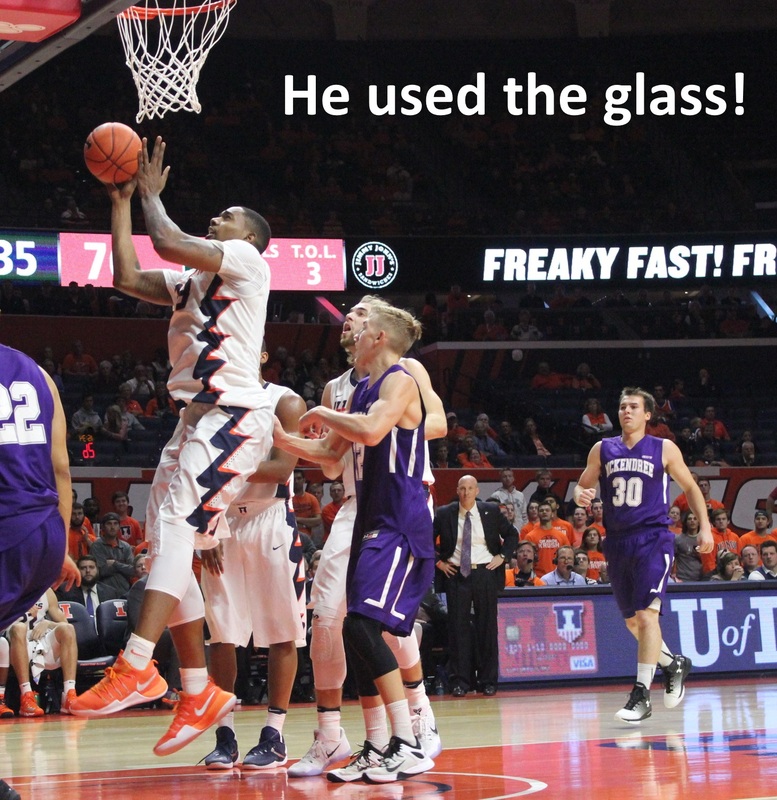 He must have known that Harper would then enter the NBA Draft. 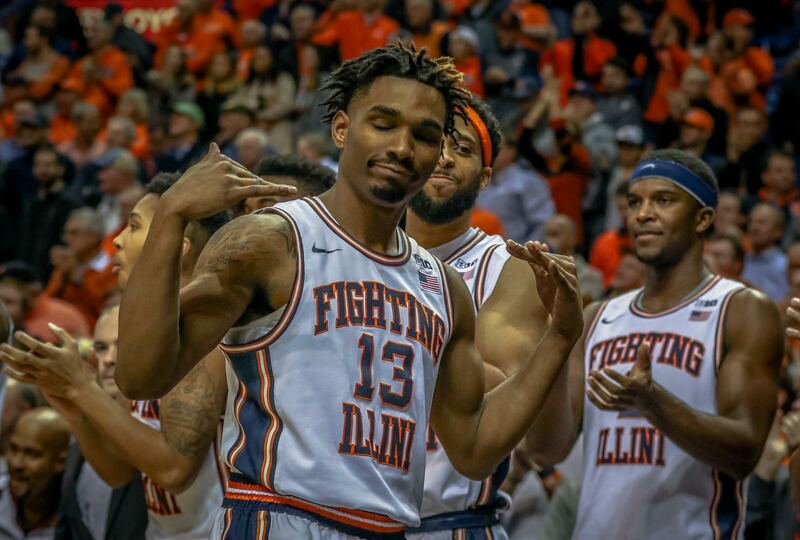 So Henson asked Quinn Richardson to sit out his senior season, and bank his last year of eligibility for 1984. 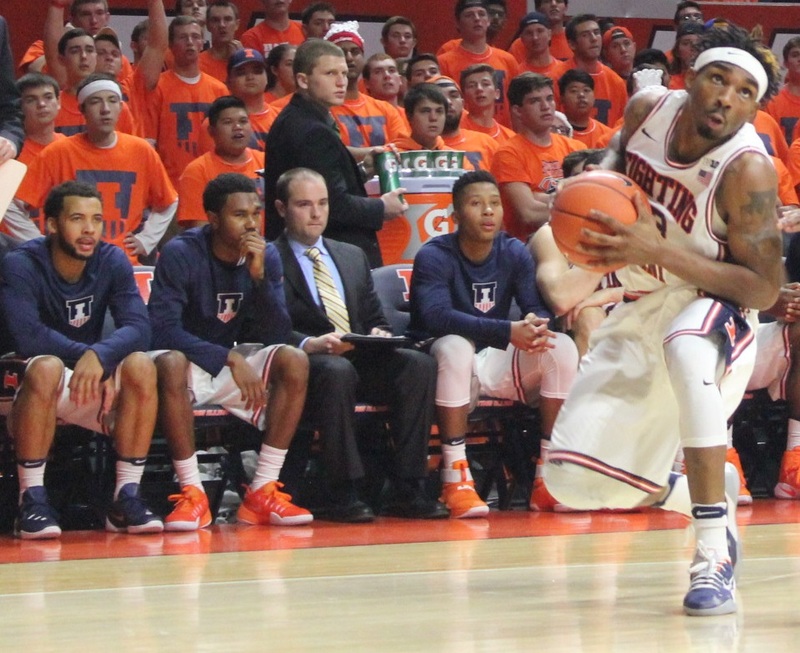 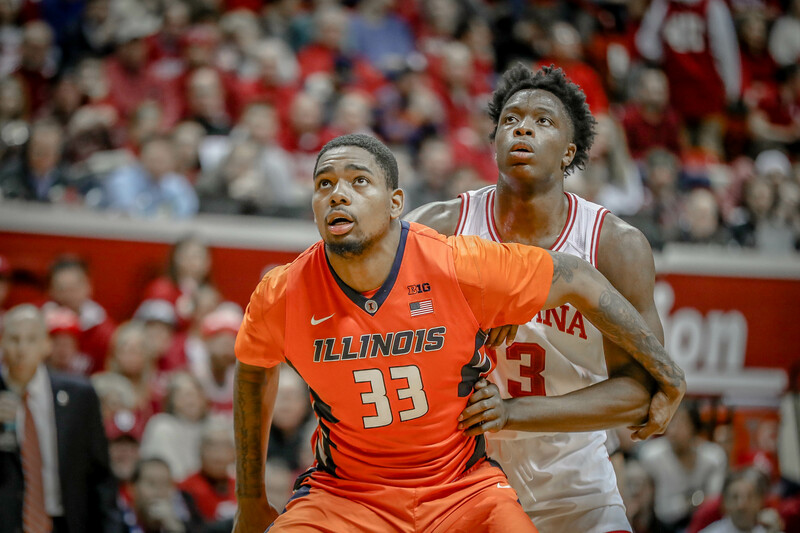 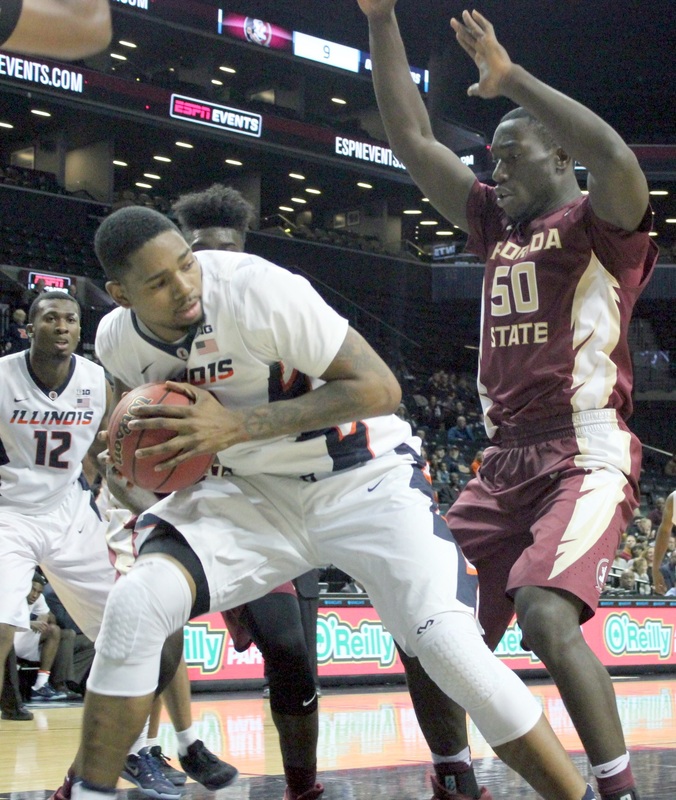 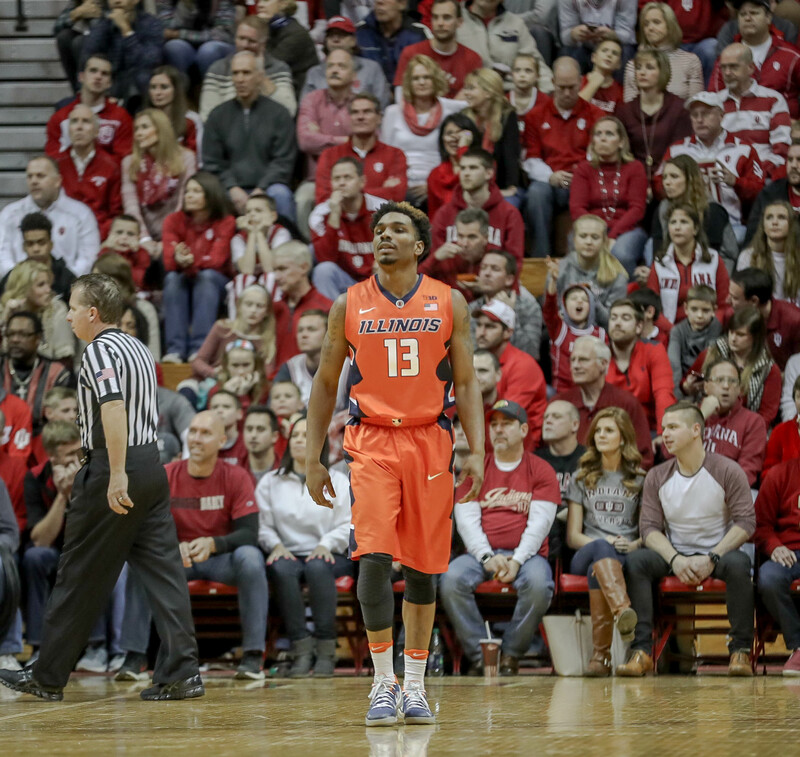 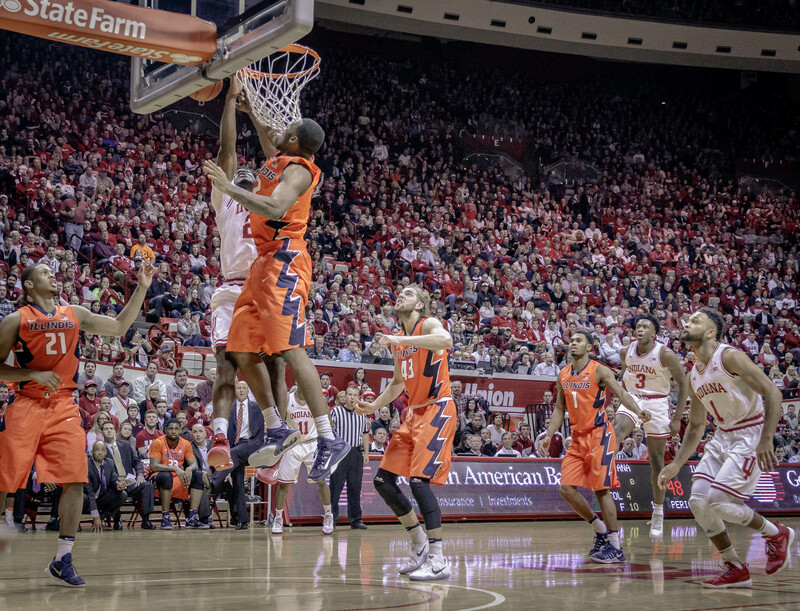 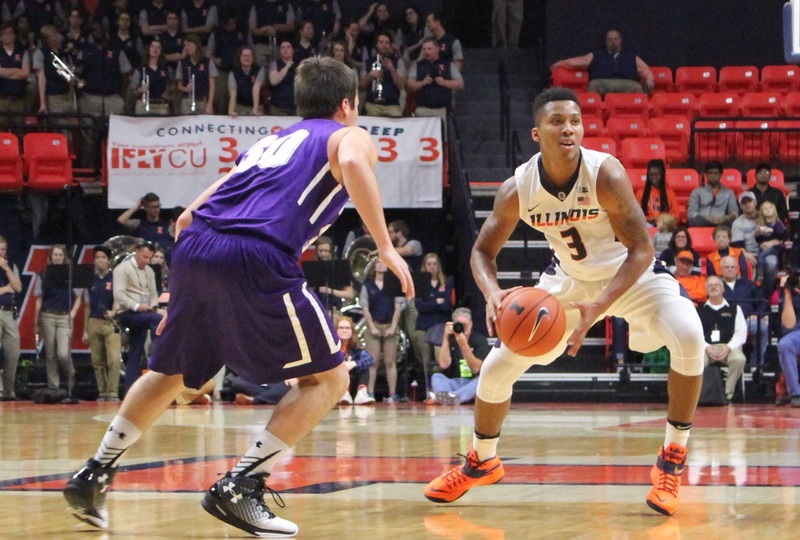 As a 5th year senior, Richardson was a starter on Illinois’ B1G championship team. 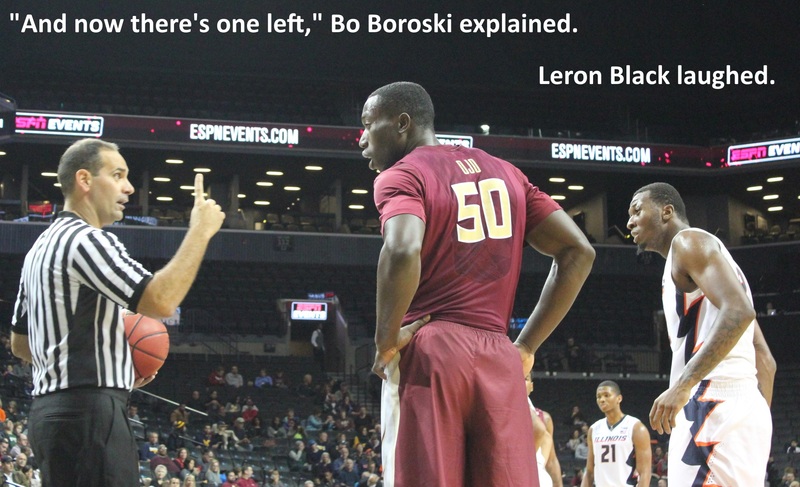 Jim Rossow interviewed Richardson in 2009, prefatory to the 1984 team’s reunion. 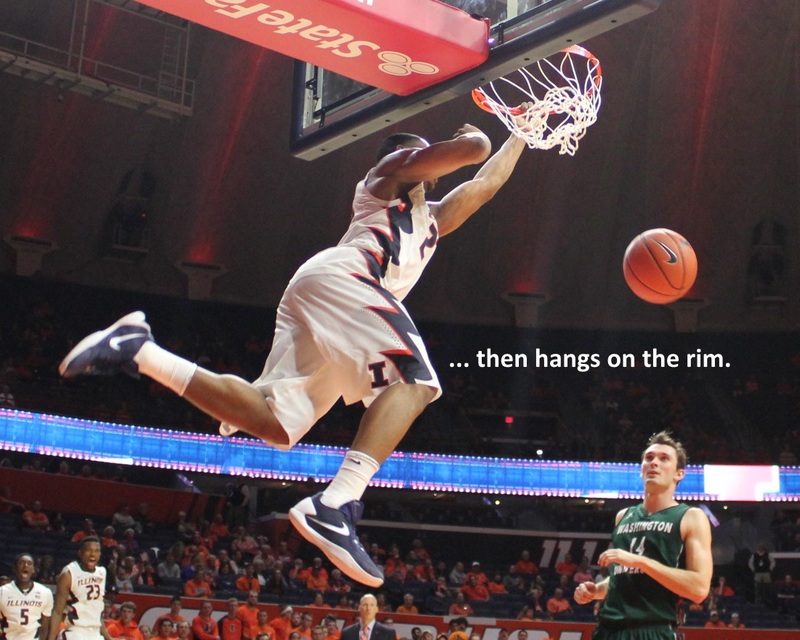 All I had to hear was “more playing time” and I jumped at it. 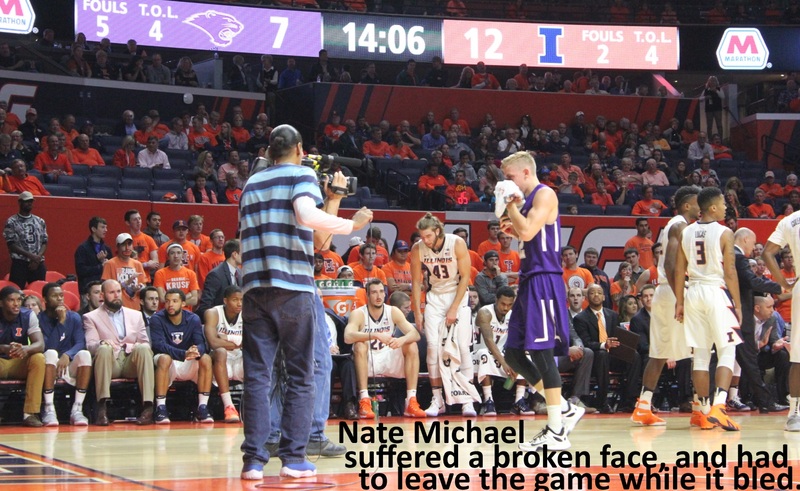 That was probably an atypical situation, especially for a senior. 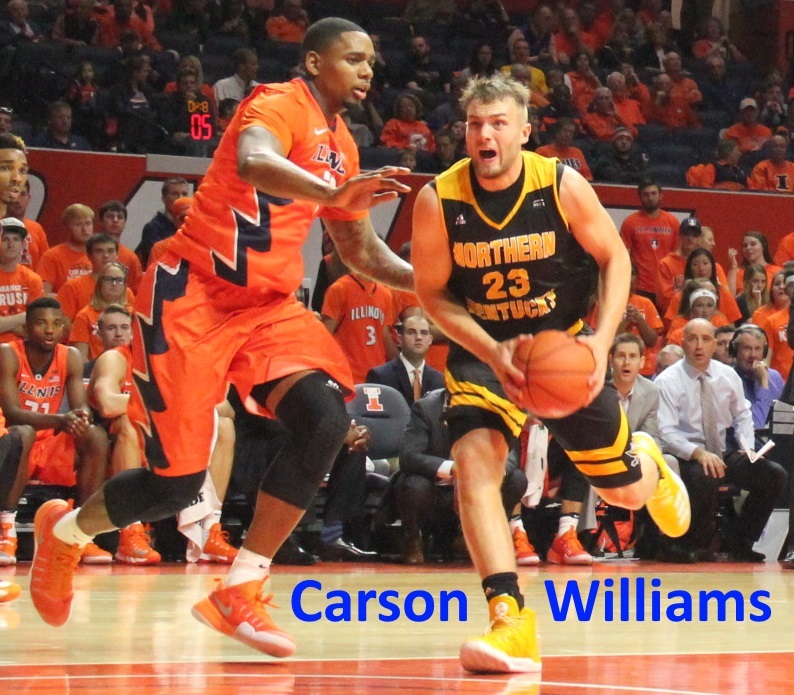 Seldom do you have seniors redshirt unless they get injured. 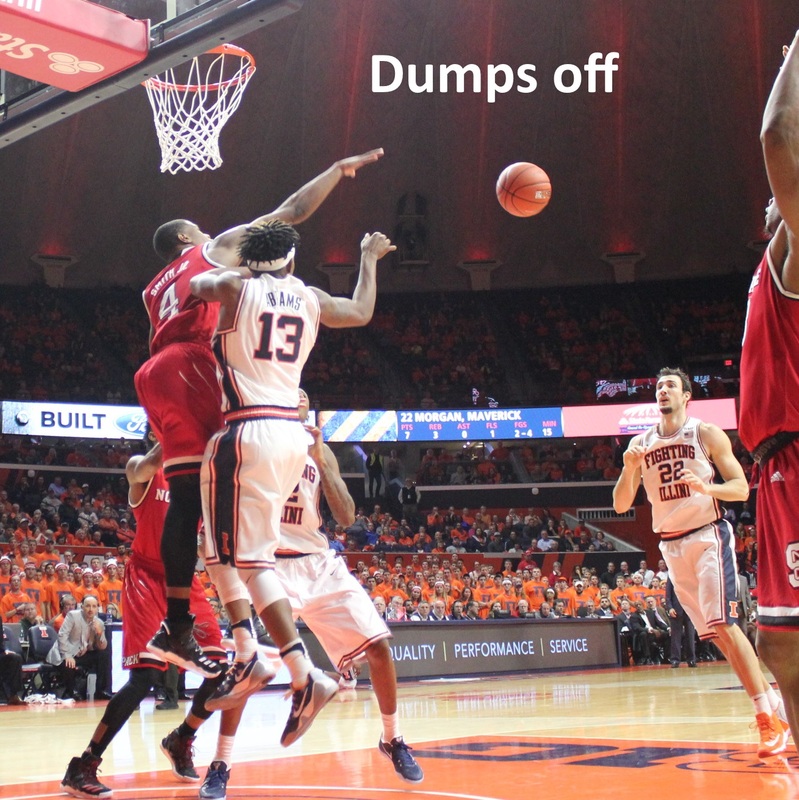 But look how it turned out. 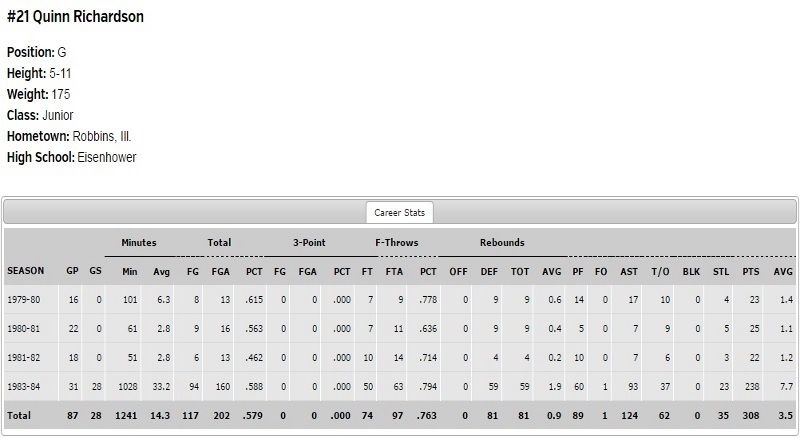 Quinn Richardson’s career stat line is remarkable to behold. 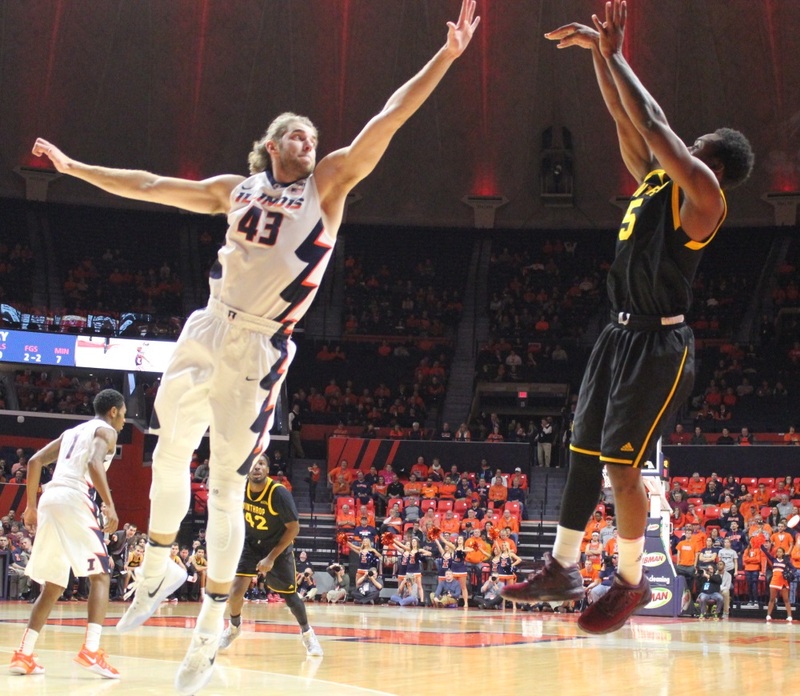 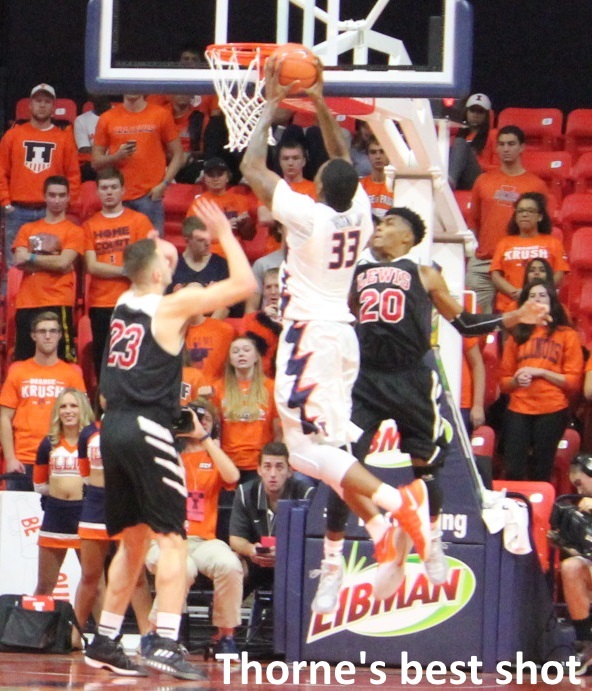 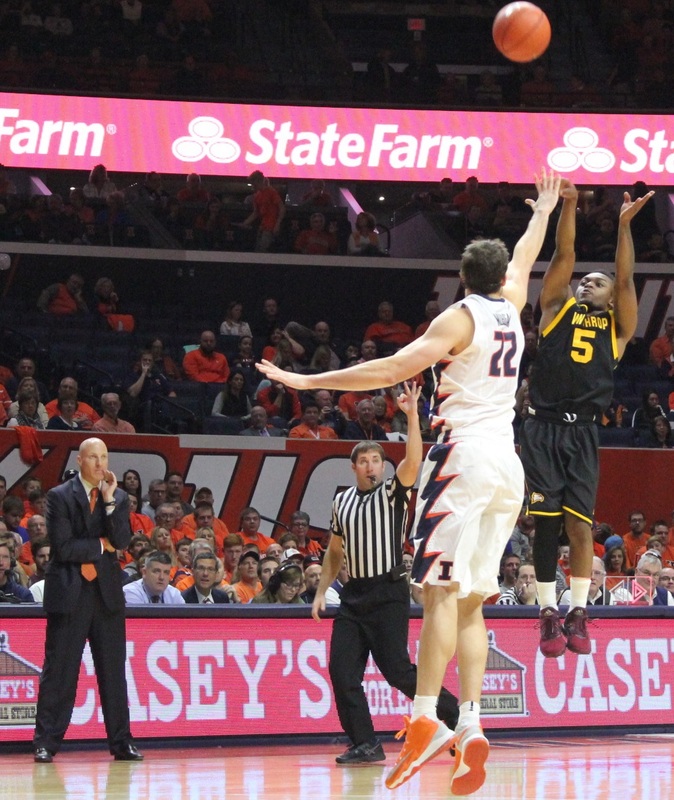 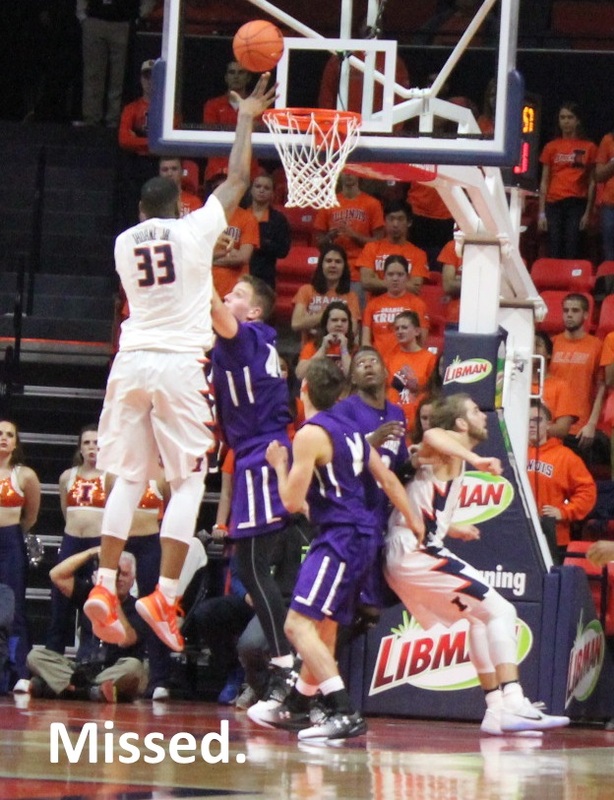 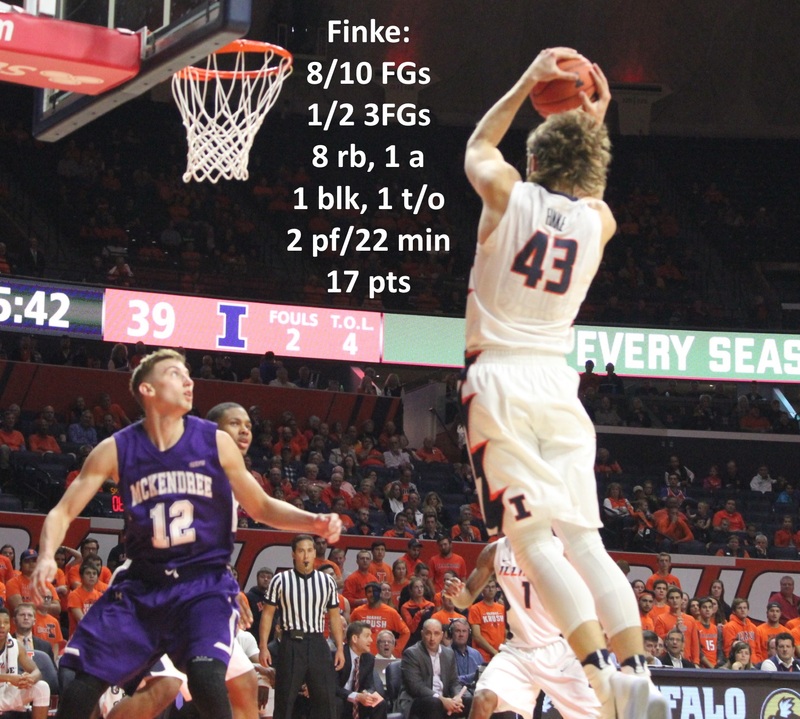 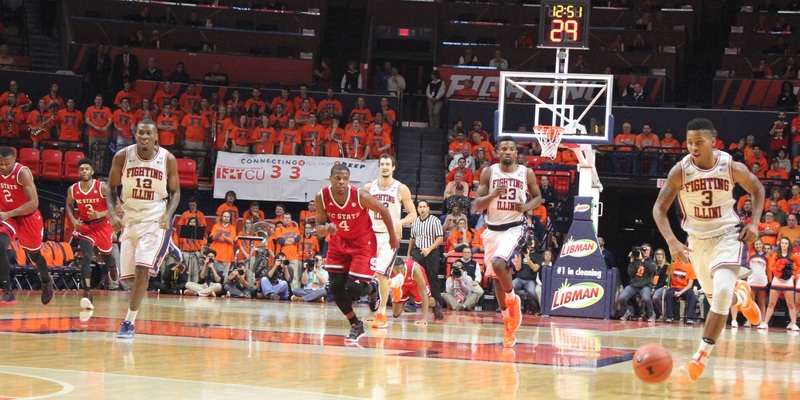 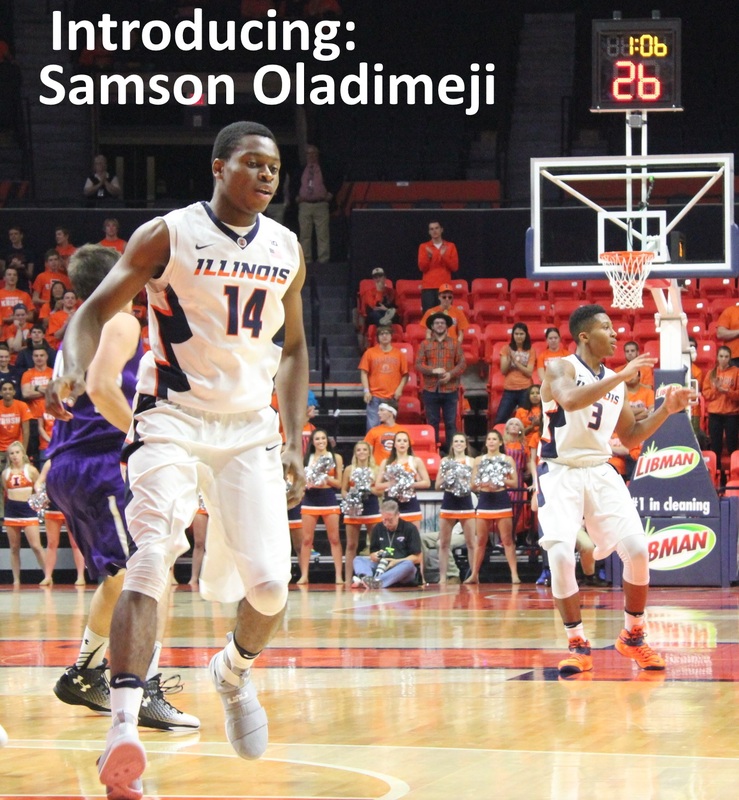 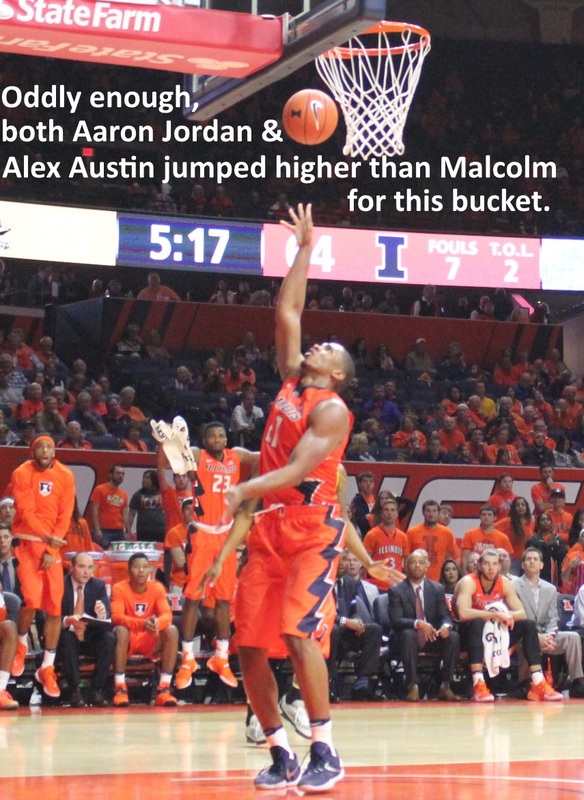 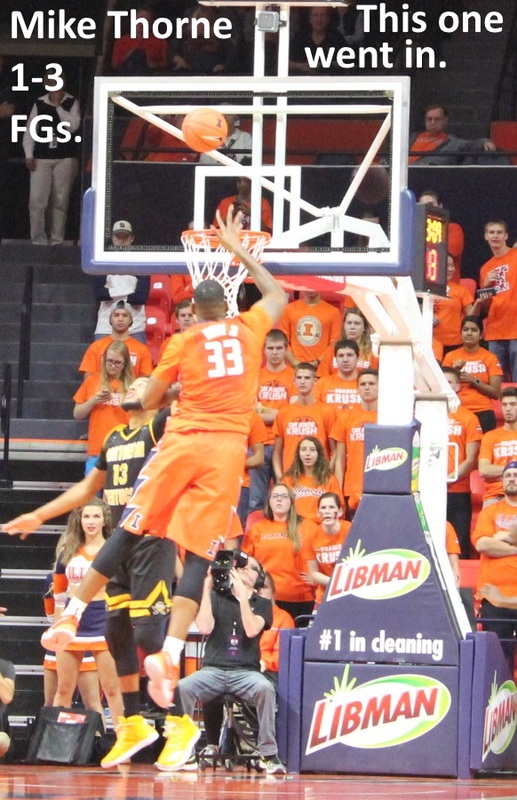 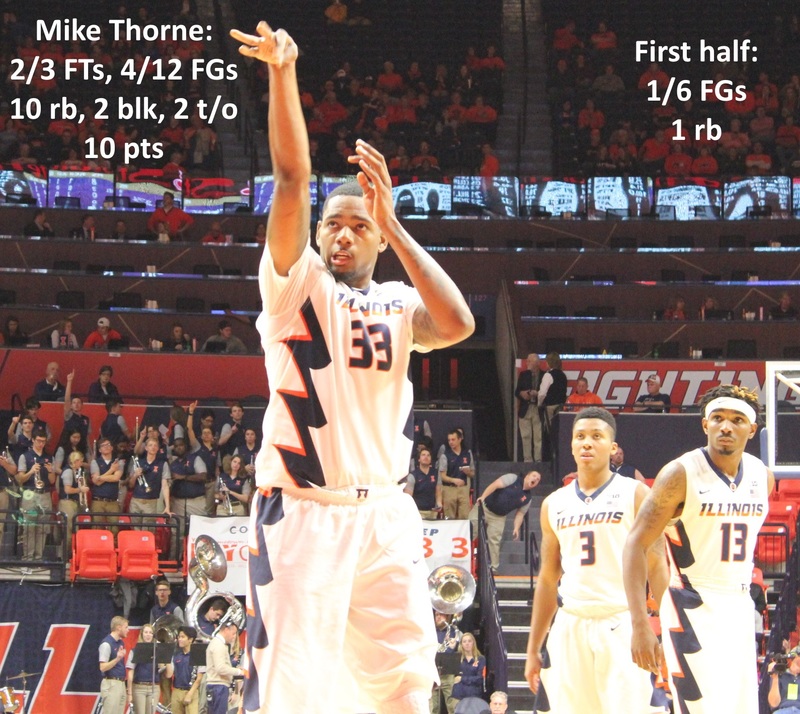 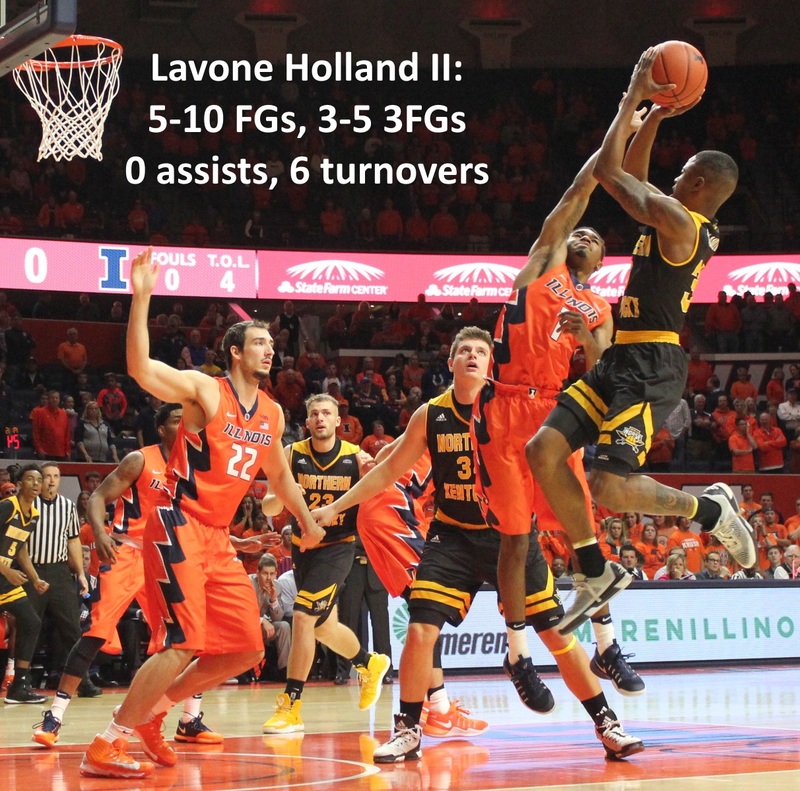 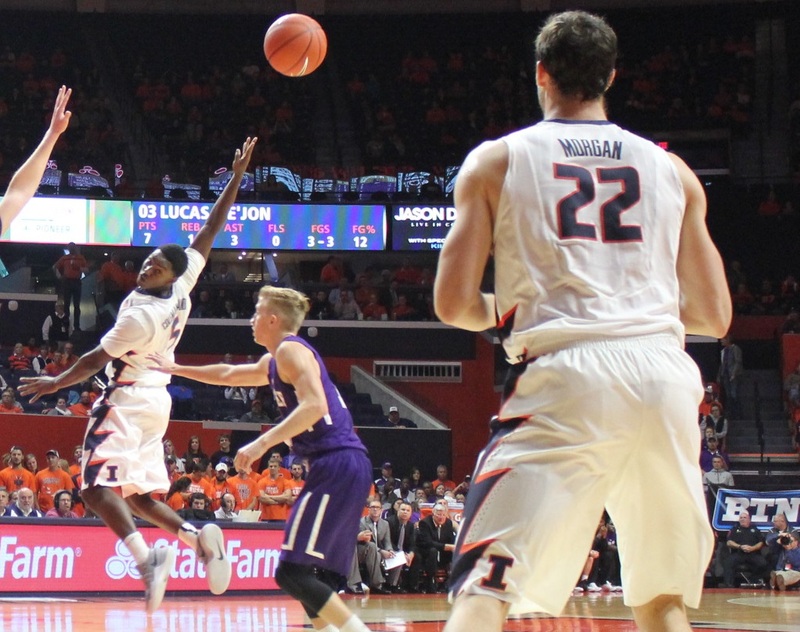 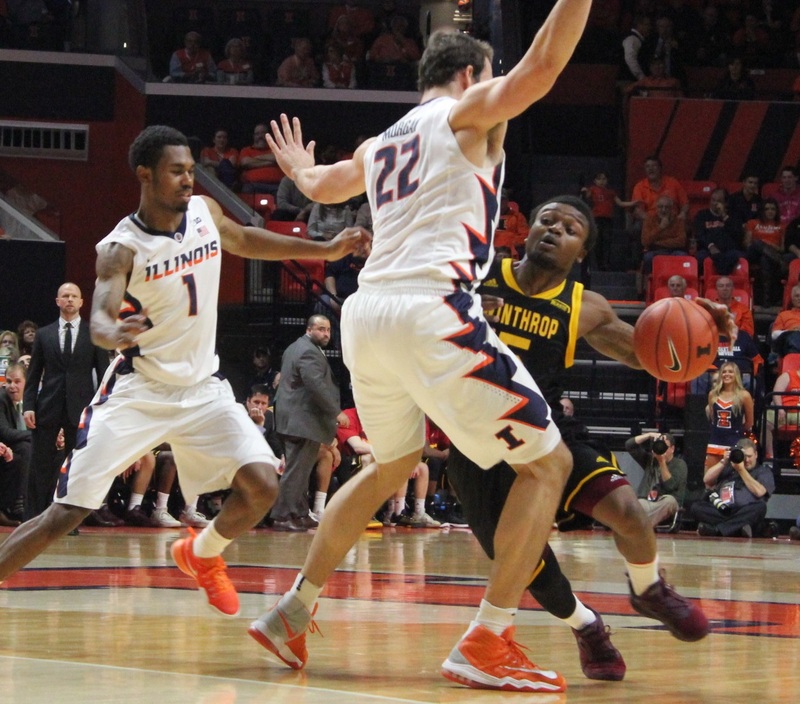 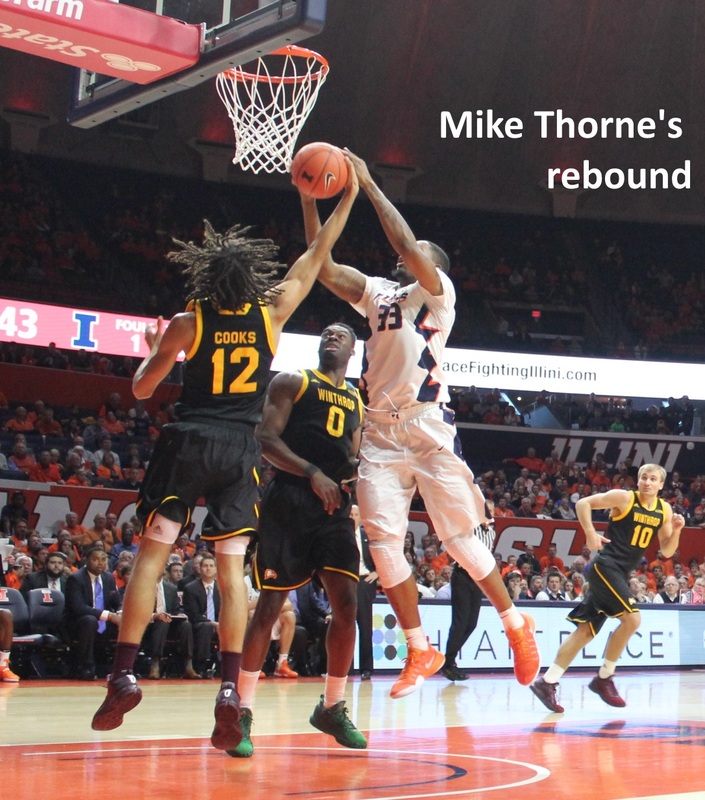 By deferring to two all-century Illini, he sextupled his scoring average. 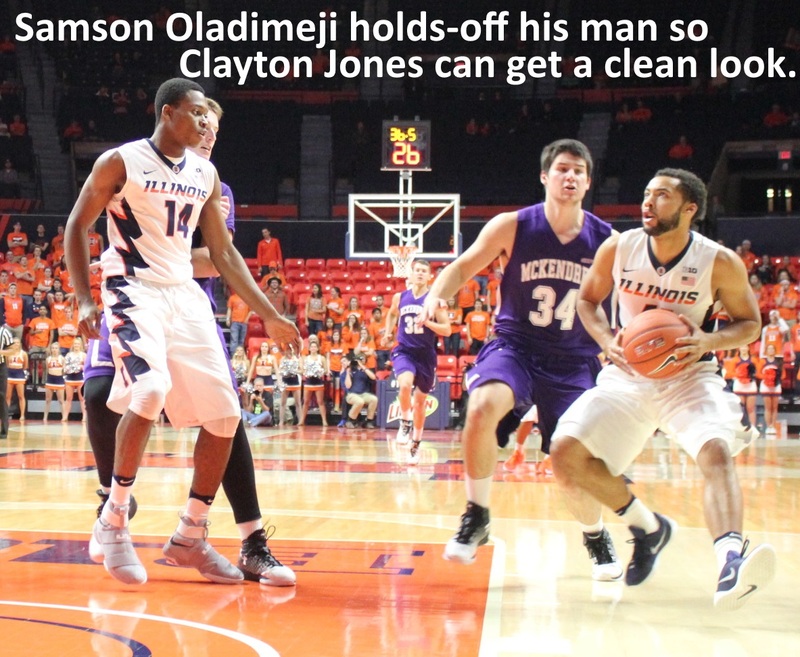 His minutes increased by NINETY-FIVE PERCENT over his junior year. 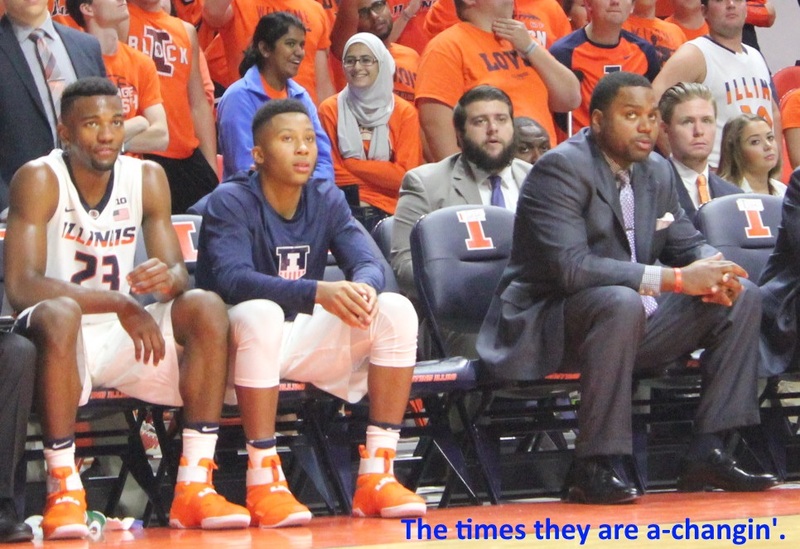 Jaylon Tate, Te’Jon Lucas and Tracy Abrams can’t all play 20 minutes per game this year. 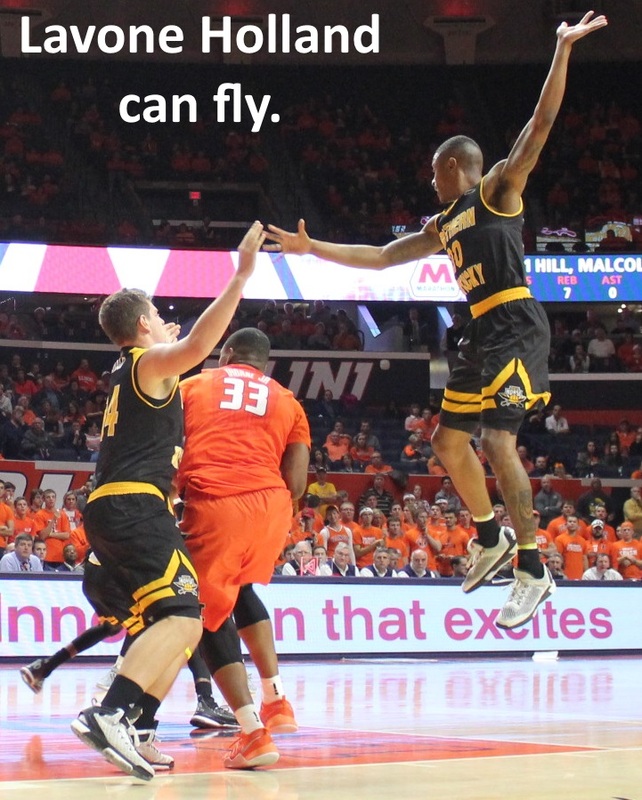 And they won’t. 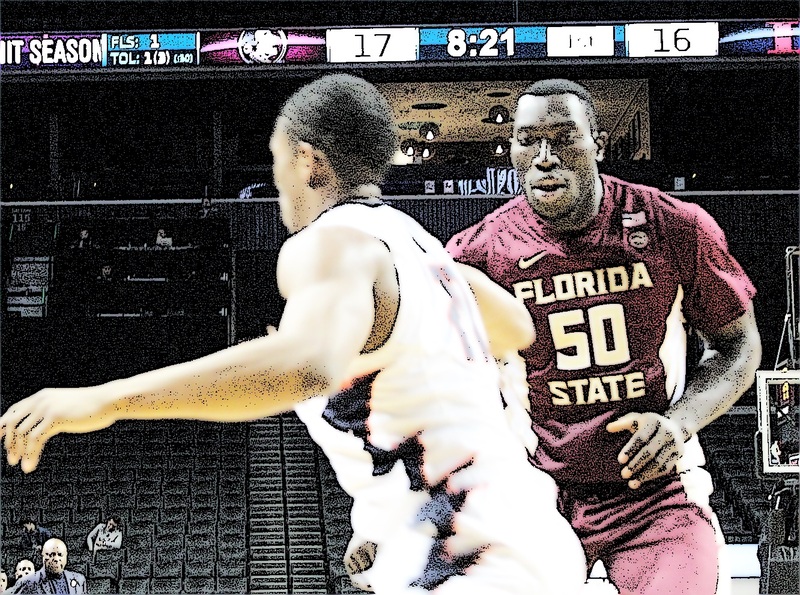 Abrams must and will play this year. 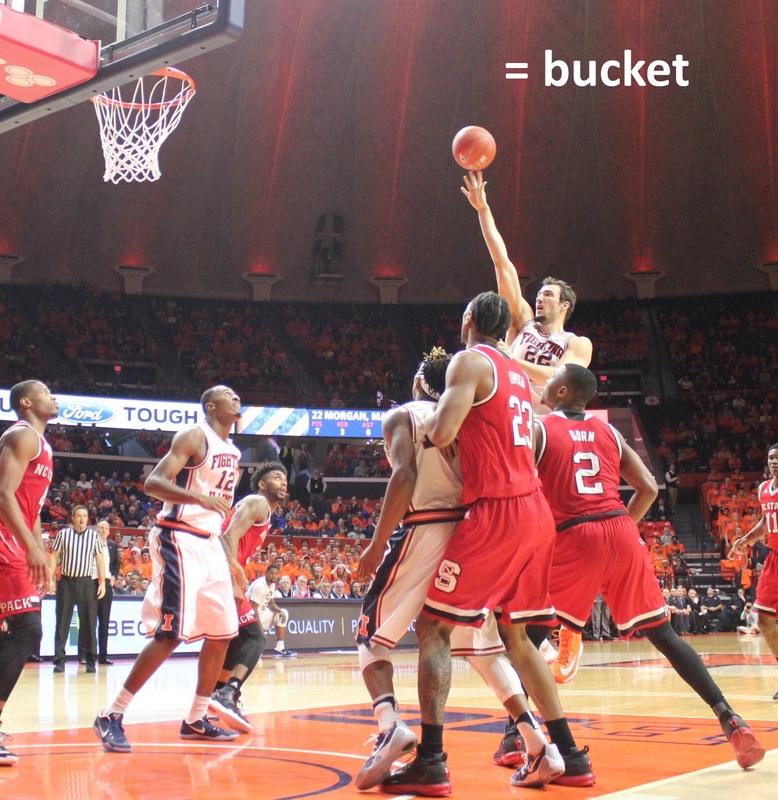 But what about the other two? 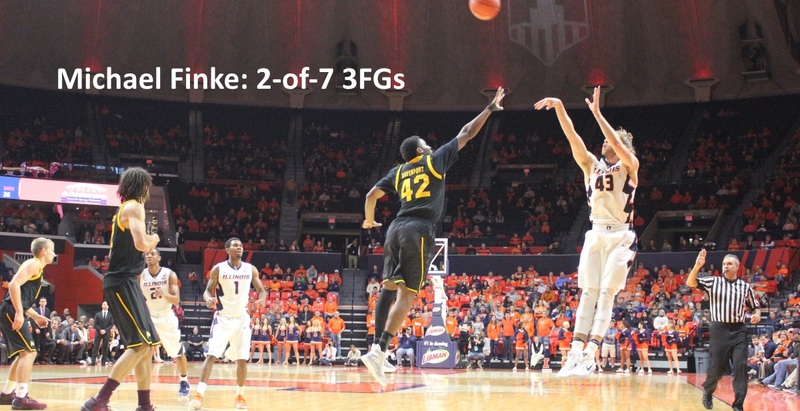 Tate started half of the games he played in last season (missing a few with that nasty pinky dislocation in game 1), but averaged only 17.5 minutes. 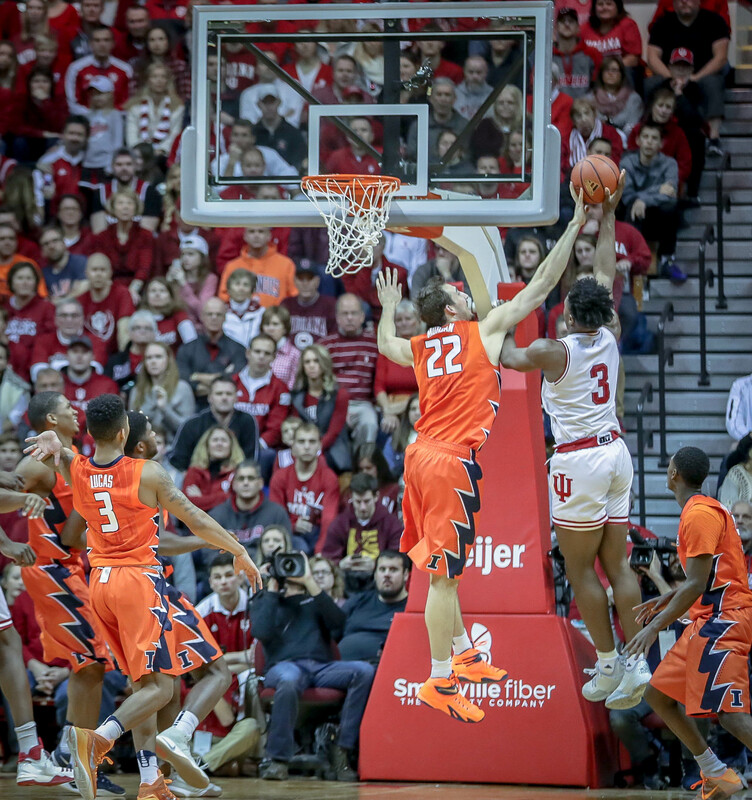 He didn’t play at all at Wisconsin, and only three minutes against Indiana. 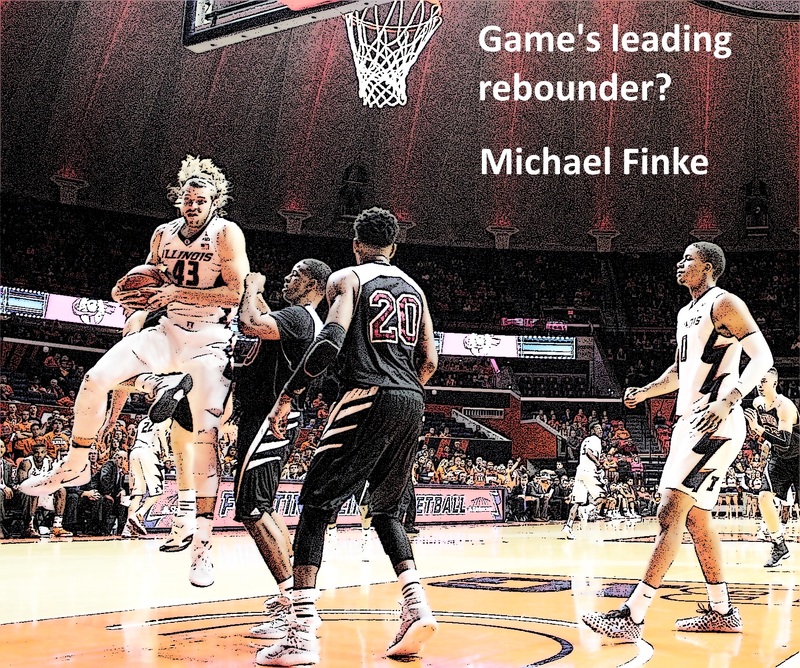 But Tate knows the flowgame and the packline. 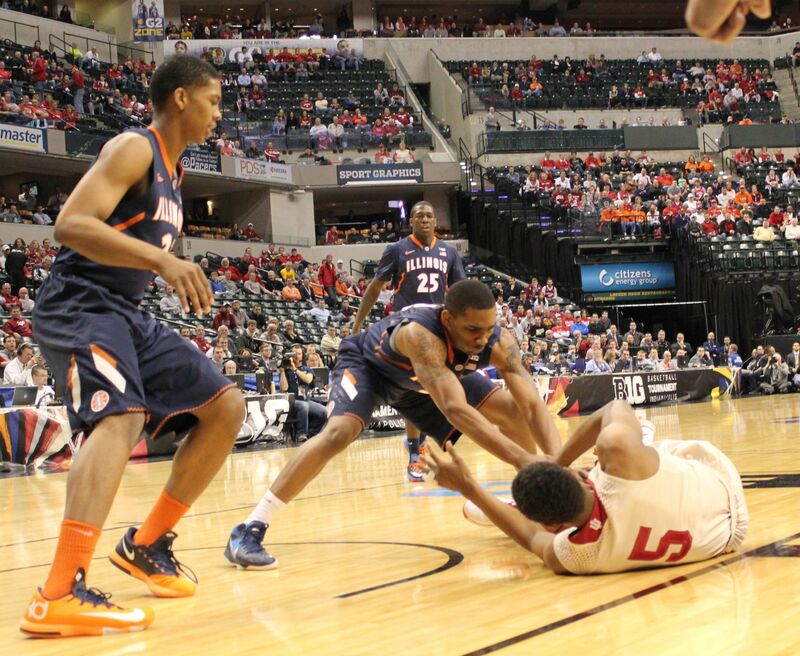 He’s in good physical condition. 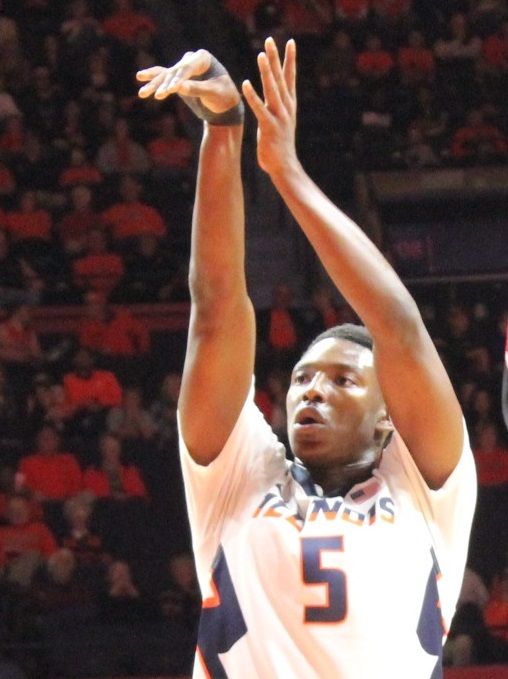 So even if John Groce lost faith in him last February, it’s hard to imagine Groce supplanting him with a kid who turned 18 this month, who’s recovering from major surgery, and who’s just now learning the system. 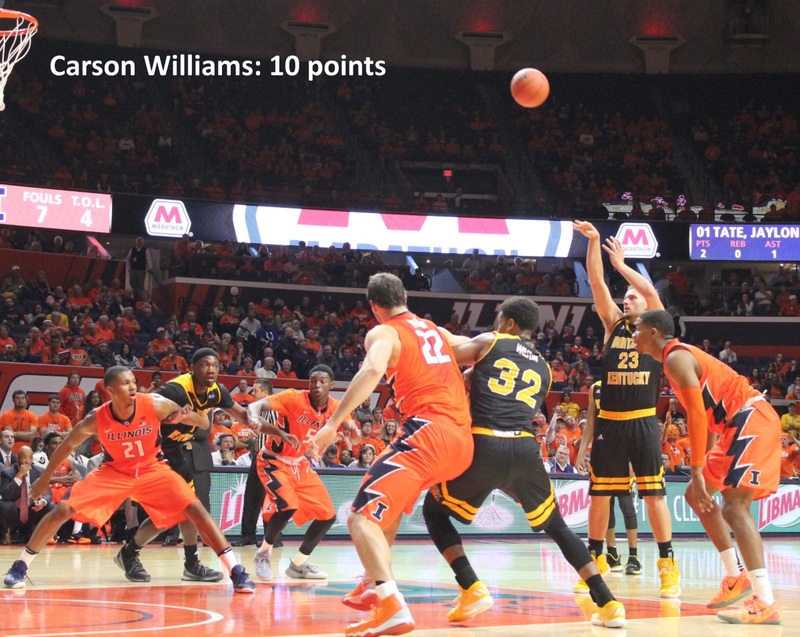 Lucas could follow in Tate’s footsteps by spelling Abrams for eight to ten minutes a game. 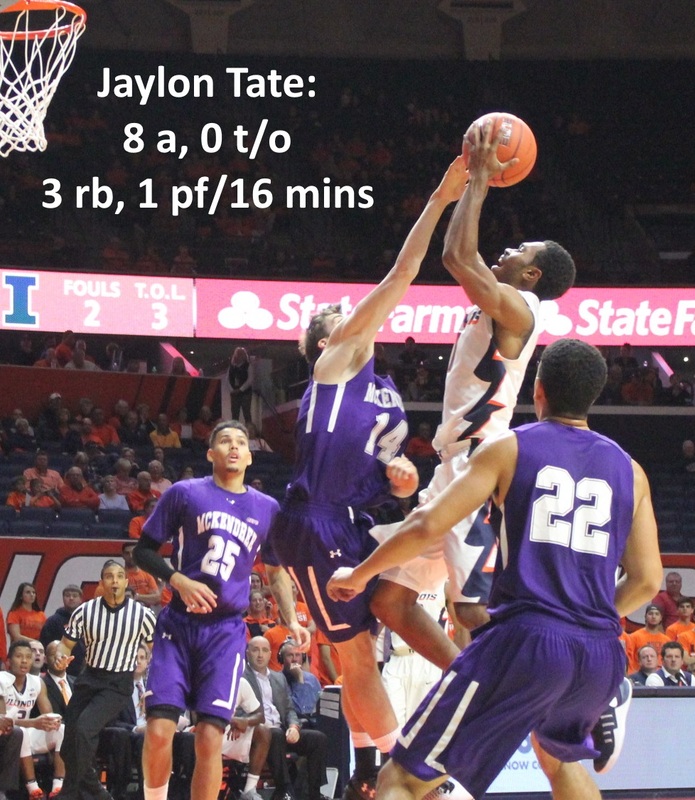 But as of now, that’s still Tate’s job. 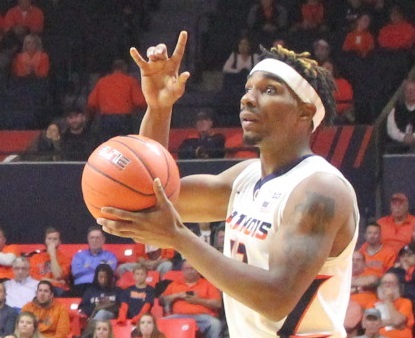 Tate is unlikely to opt out for the 2016-17 season, but what if he did? 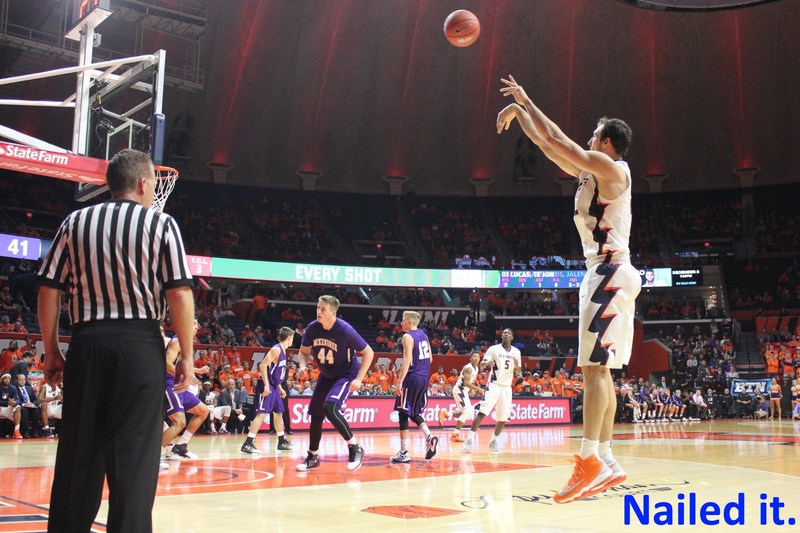 There are no scholarship seniors on next year’s roster. 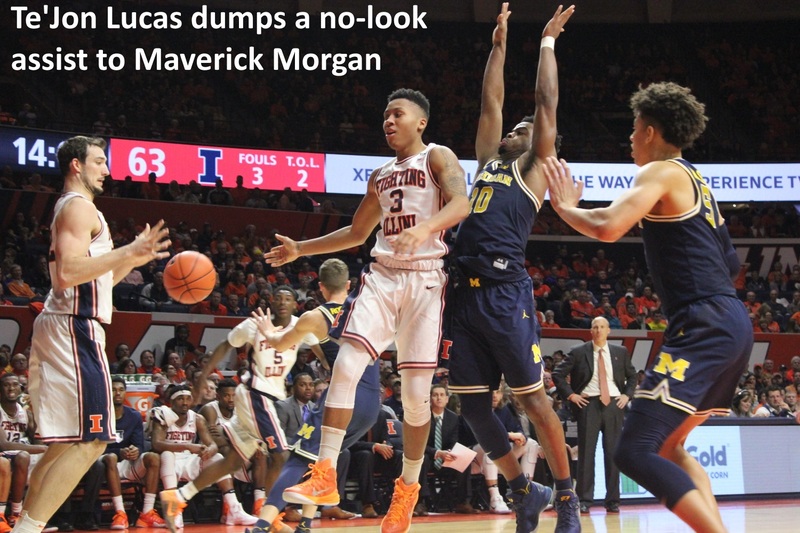 Lucas’s conditioning and inexperience would seem to make him a prime candidate for a redshirt, but nobody knows that. 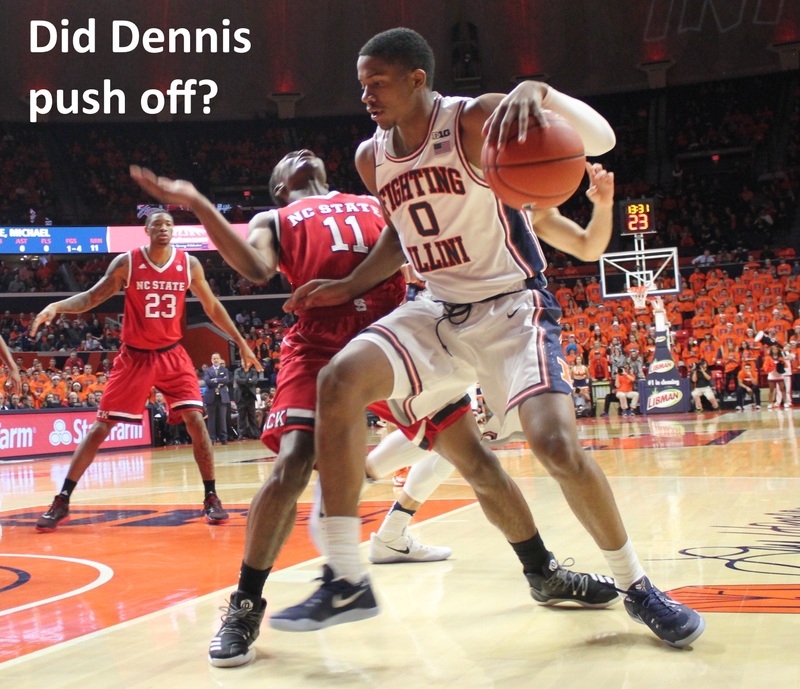 It’s just a hunch. 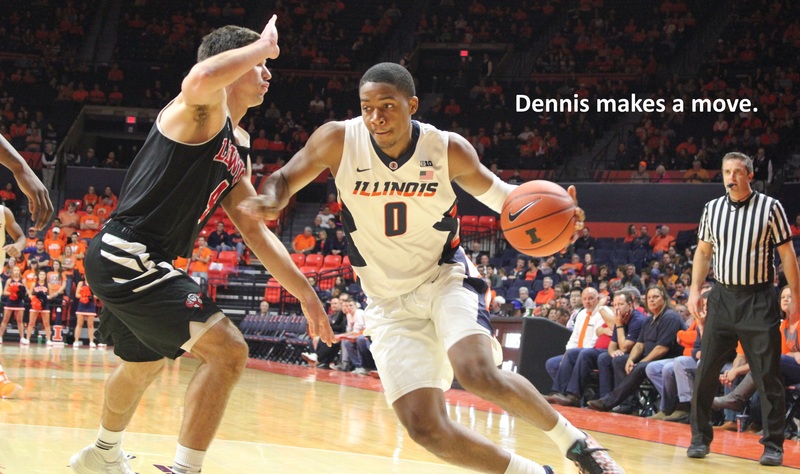 His teammates think he can contribute this year. 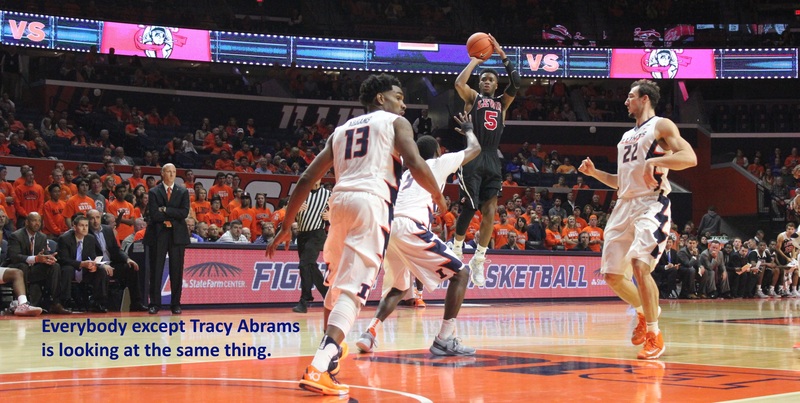 Should everyone universally assume that Tracy Abrams is the starter at point guard? 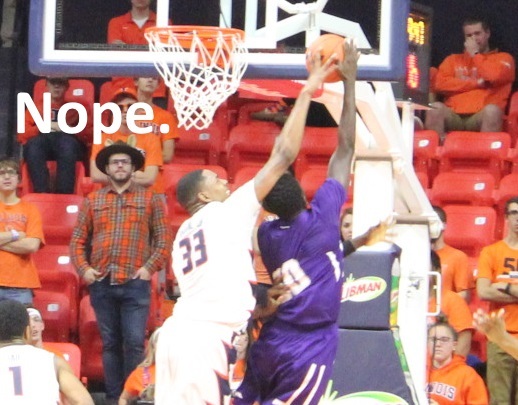 It seems like the safest bet in town, right? 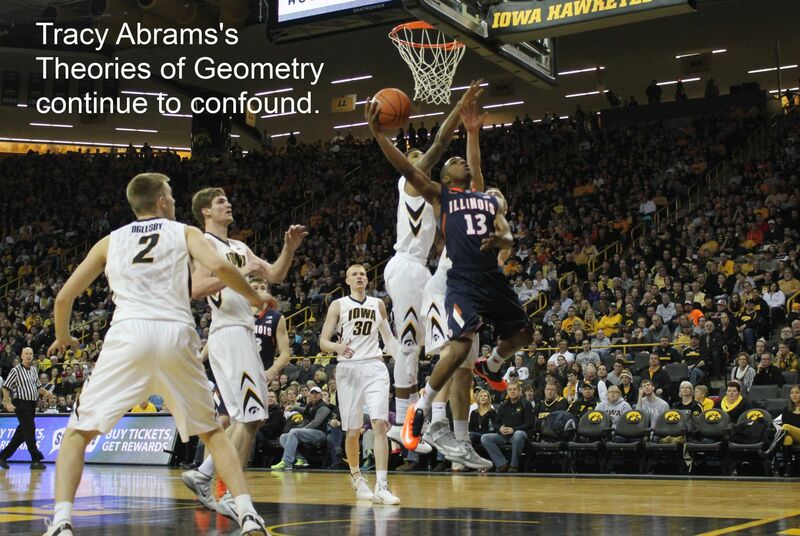 Well, keep in mind the intriguing aspect of the Groce-Abrams relationship, revealed at the 2014 MBB banquet. 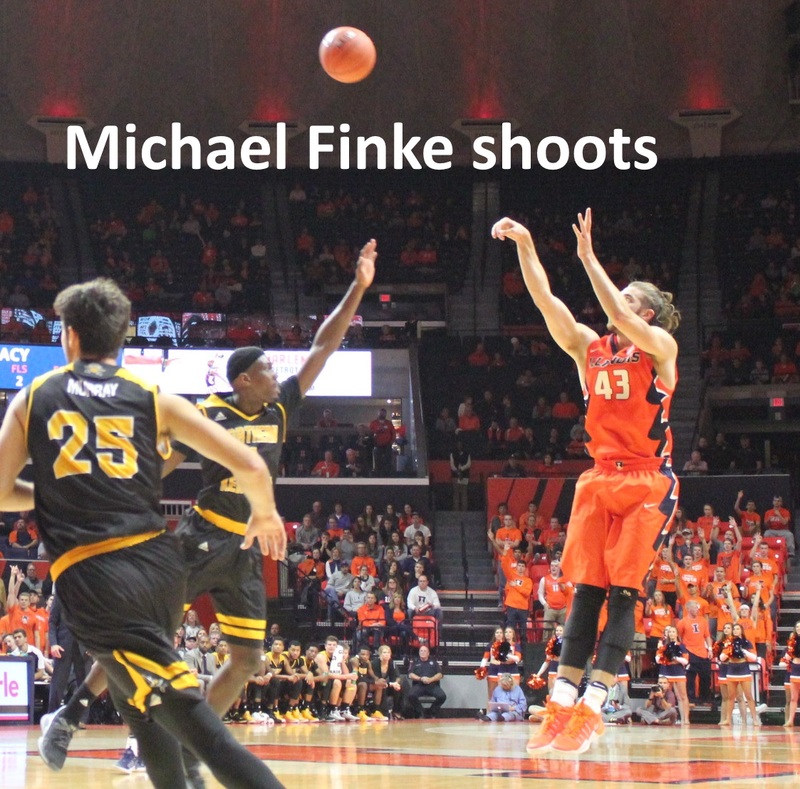 Groce praised Joe Bertrand and Jon Ekey for accepting diminished roles mid-season (paving the way for Malcolm Hill) and added that such “sacrifice” would be a key to the next season’s success. 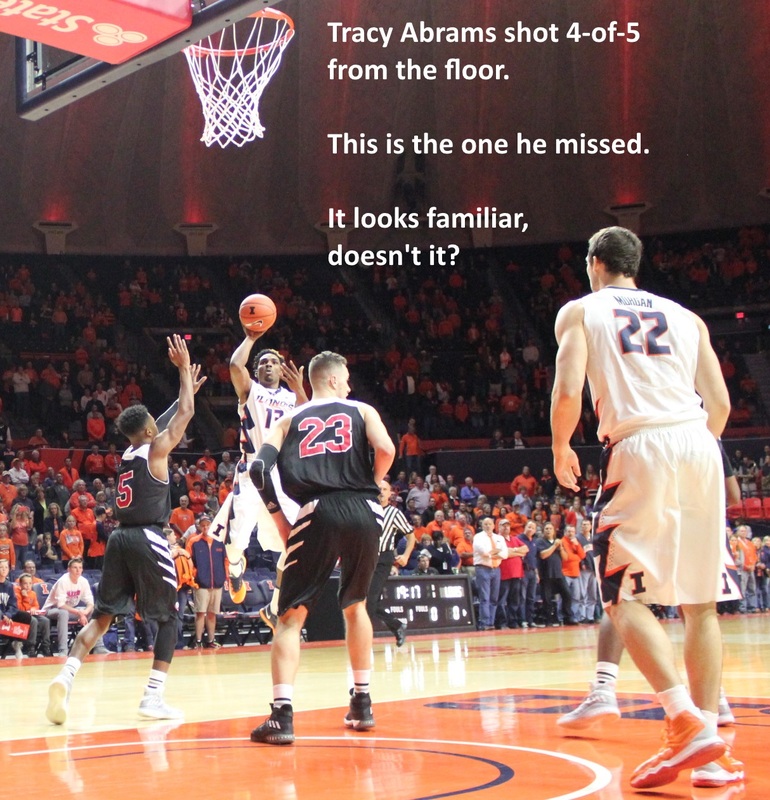 Groce was talking about Tracy Abrams. 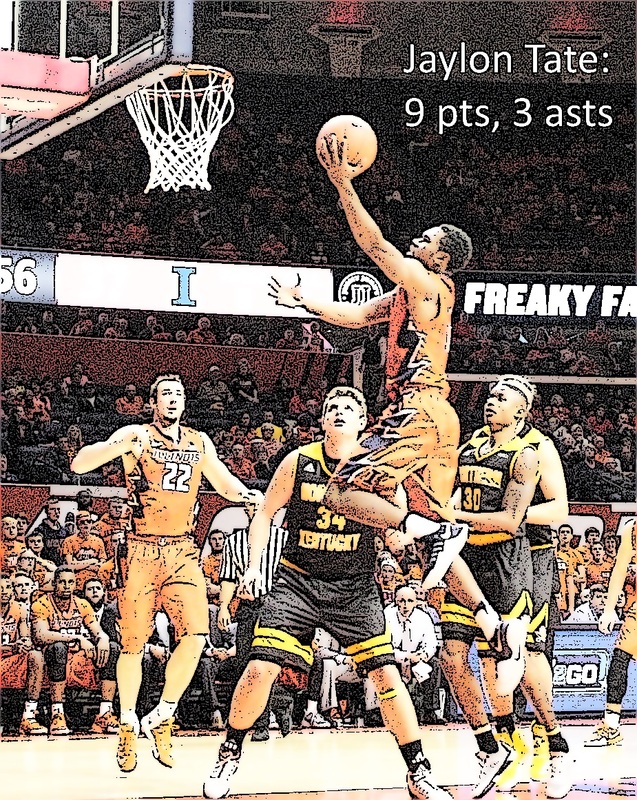 You’ll remember how 2014’s slim NCAA hopes ended: Tracy Abrams alligator-armed a runner against Michigan, in a one point loss. 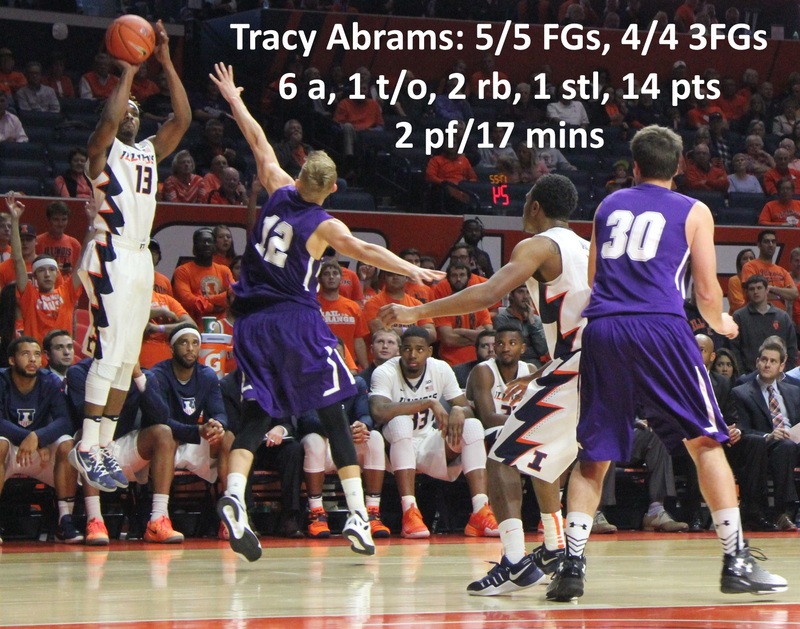 You’ll remember how 2014 ended overall: Tracy Abrams firing a long airball at Clemson, in a one point loss. 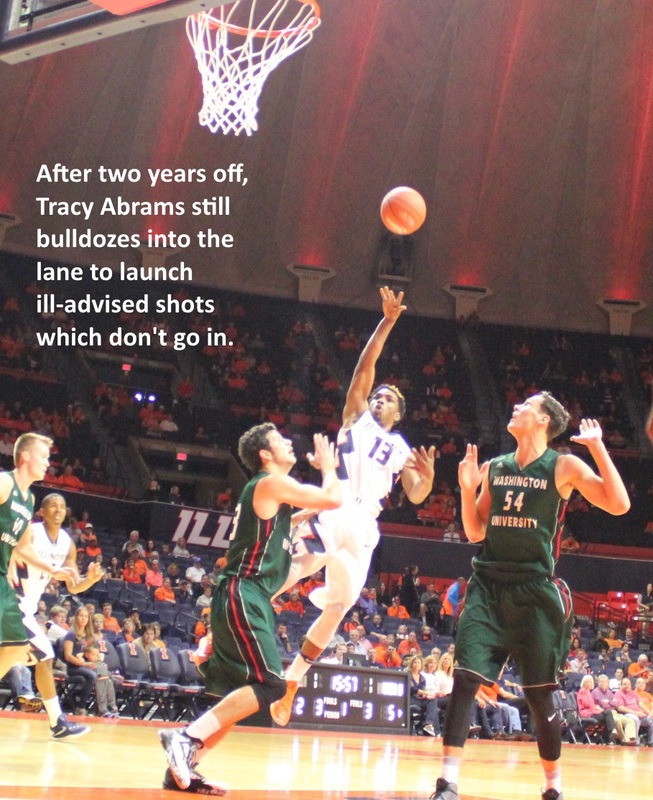 So in April of 2014, Tracy Abrams was not the wave of the future in John Groce’s mind. 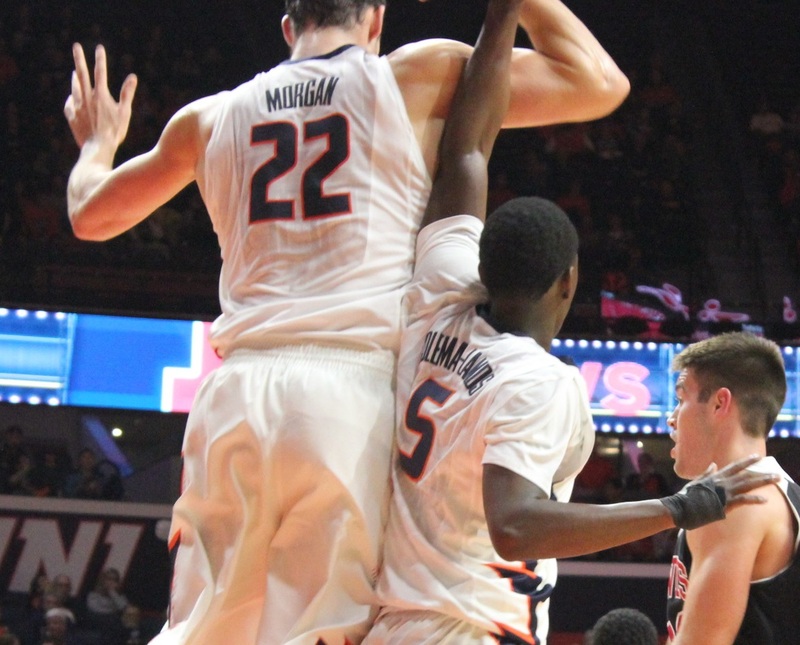 On the other hand, Groce incessantly voices appreciation for Abrams’s work-ethic and leadership. 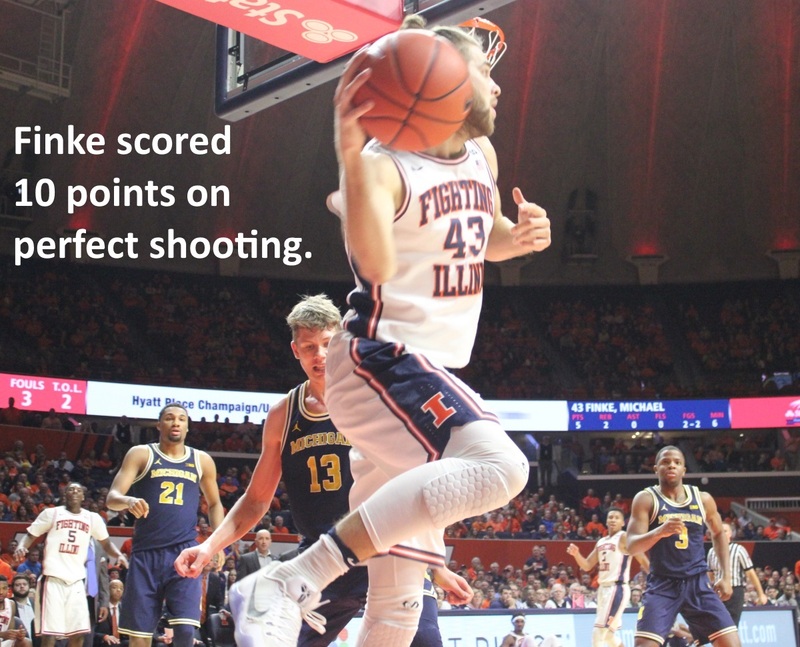 Before the collapse, those qualities took the spotlight in Abrams’s amazing performance during the first game of that Big Ten Tournament. 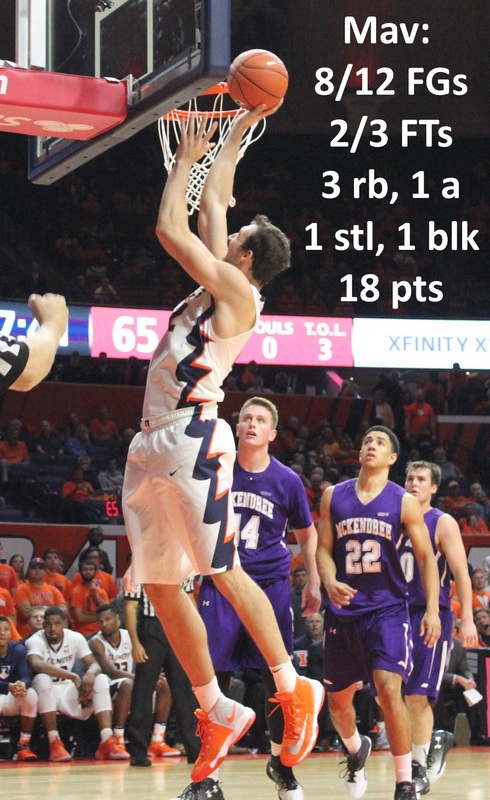 25 points, seven rebounds, two steals, two assists and a blocked shot. 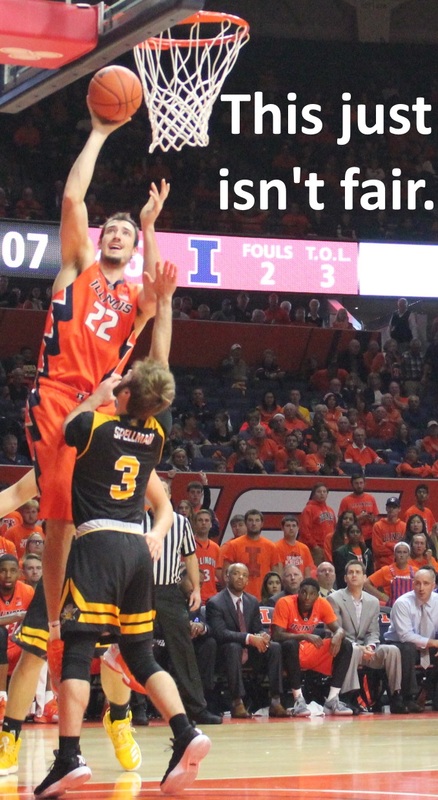 And he just plain tries hard. 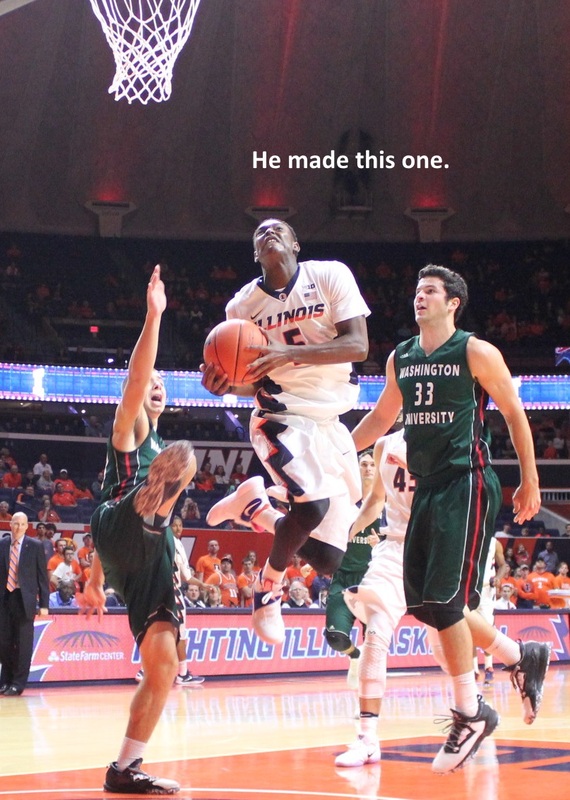 Abrams has inspired and flummoxed Illini fans his entire career. 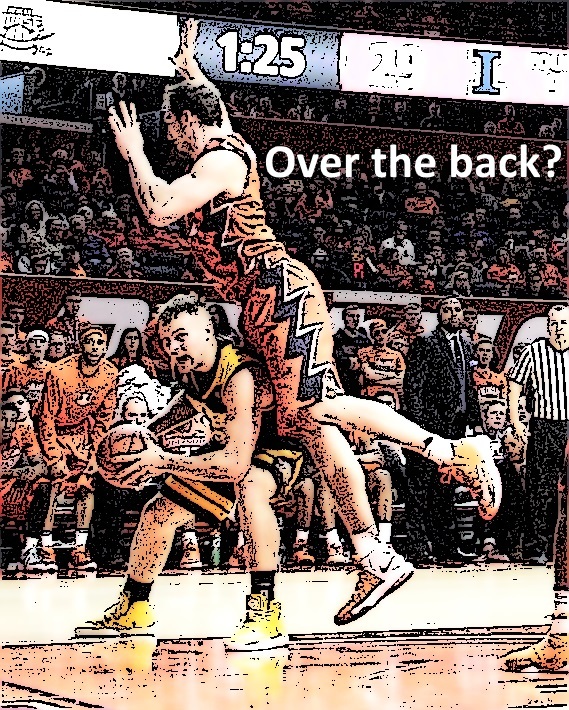 He always puts the team on his back. 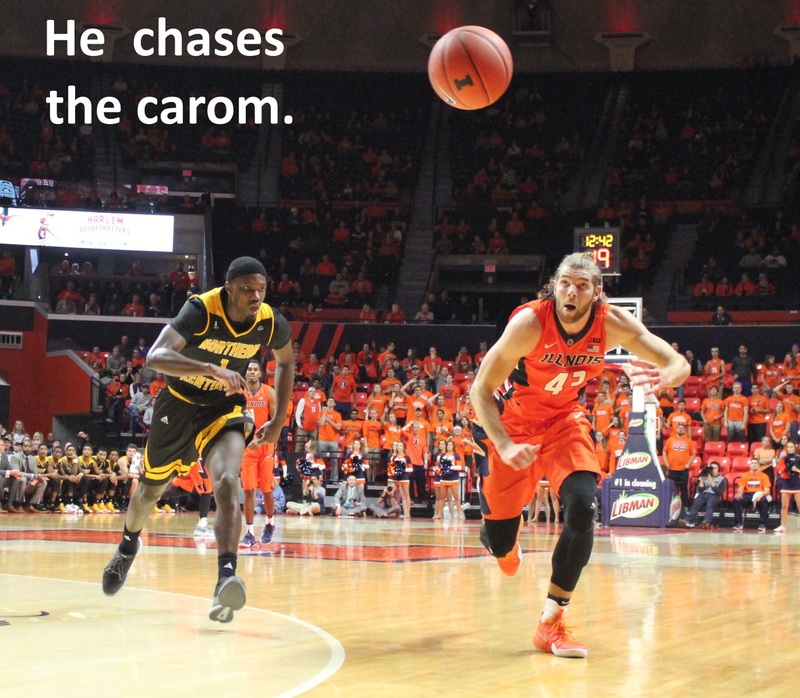 He sometimes carries it to victory. 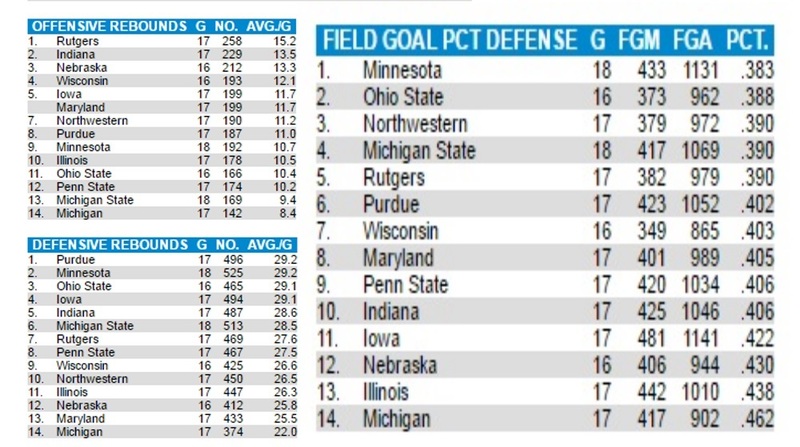 The dagger at Minnesota comes to mind. 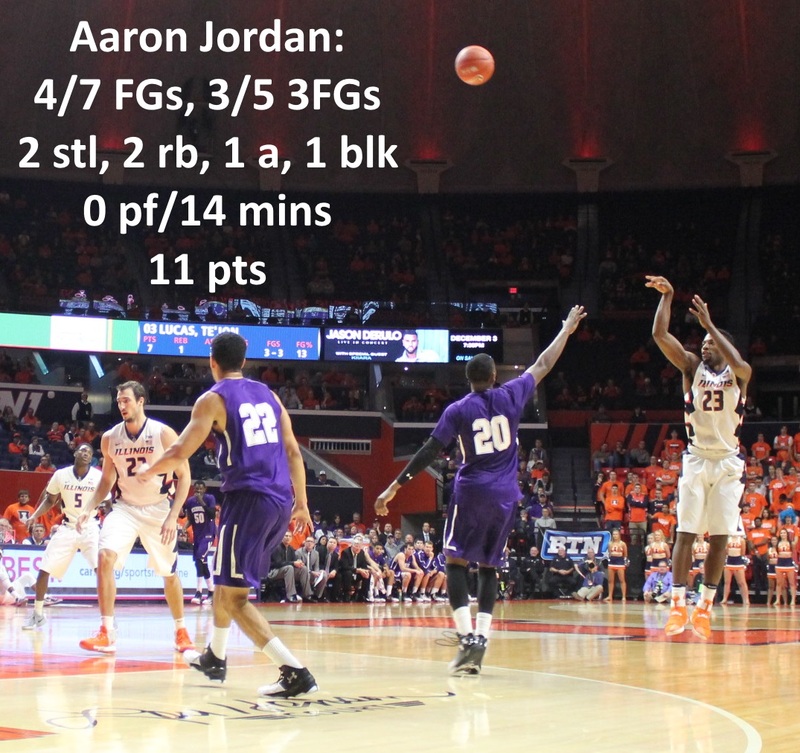 His tying and go-ahead free-throws in Braggin’ Rights 2013 will not be soon forgotten. 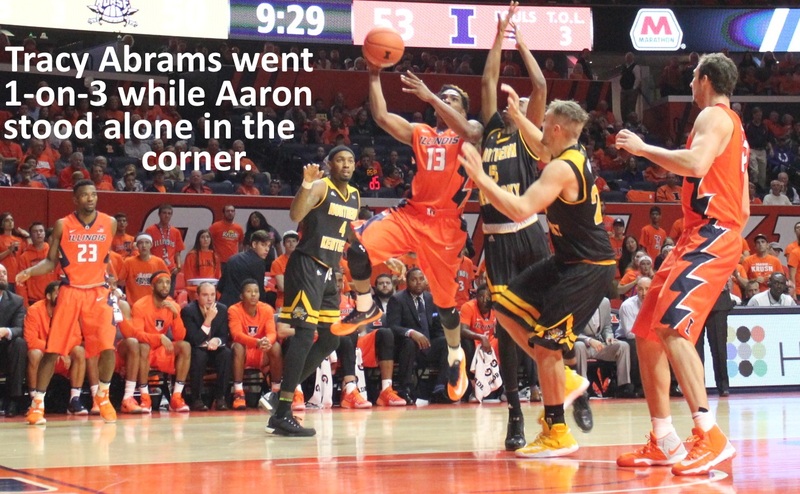 Abrams assisted on Ekey’s buzzer-beater at Iowa, an option play called 44 Flat Fade. 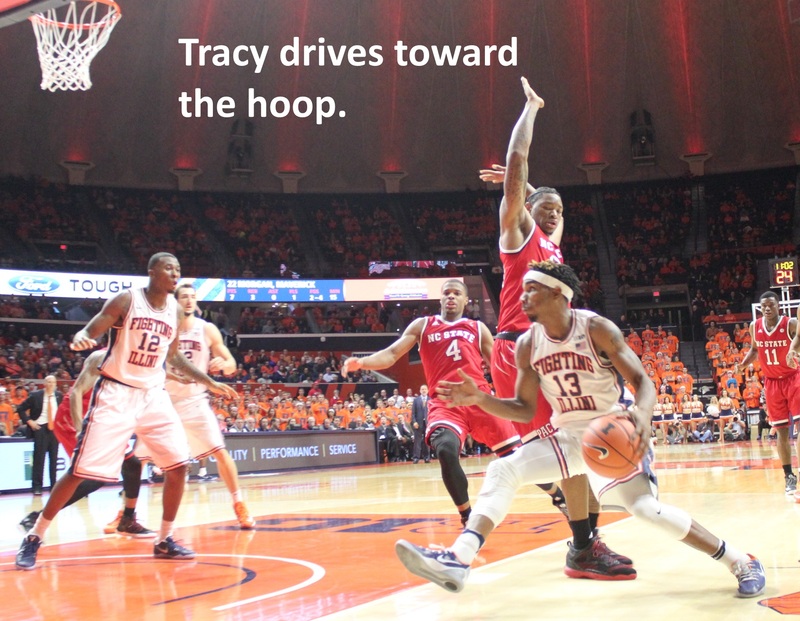 But even on that play, the ball seemed to stick in Tracy’s hands longer than you’d ideally want it to stick. 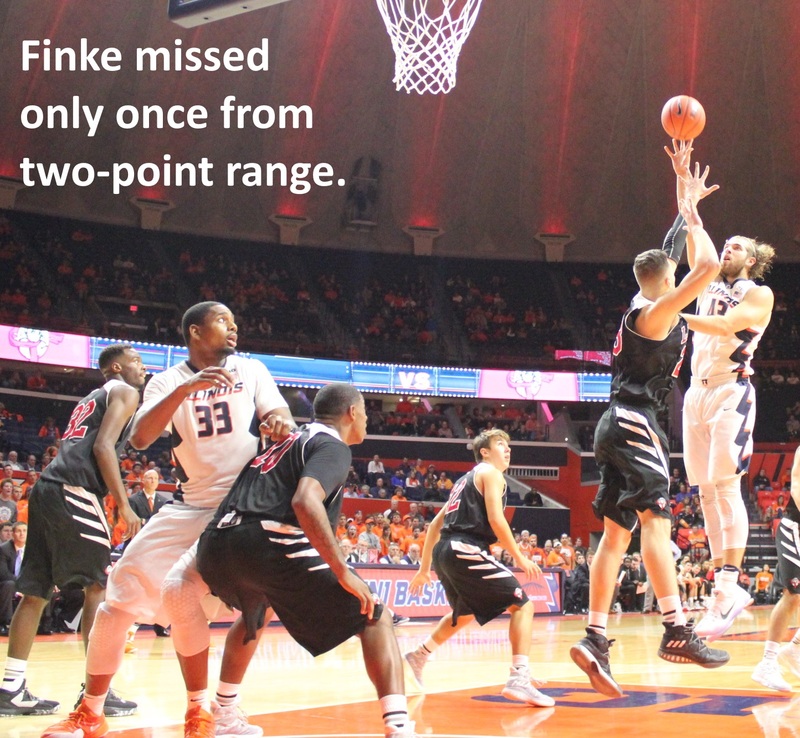 That allowed Aaron White to get so far up Ekey’s grill, that science has yet to determine how the shot went in. 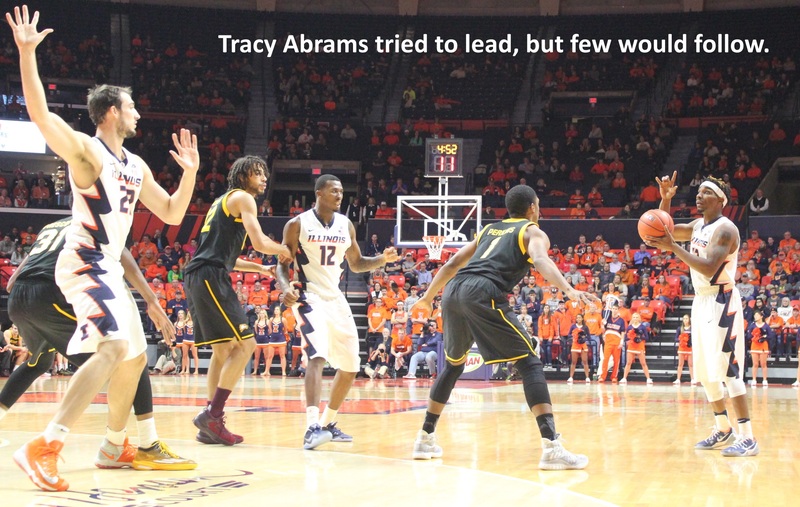 It’s that stickiness that’s held Tracy Abrams down. 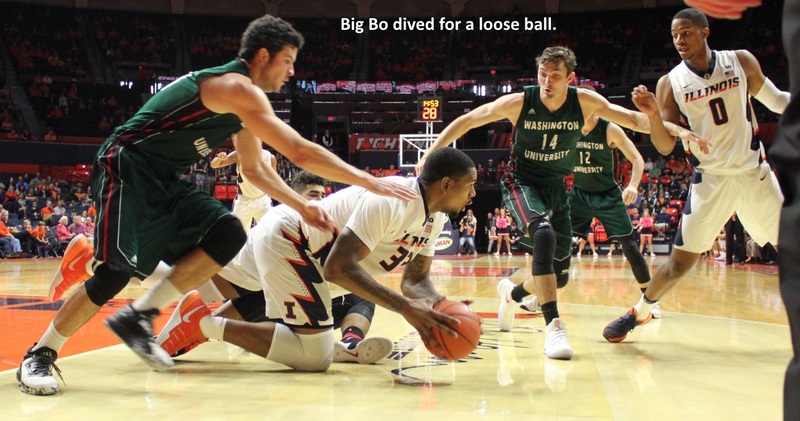 He’s never been able to get rid of the ball quickly. 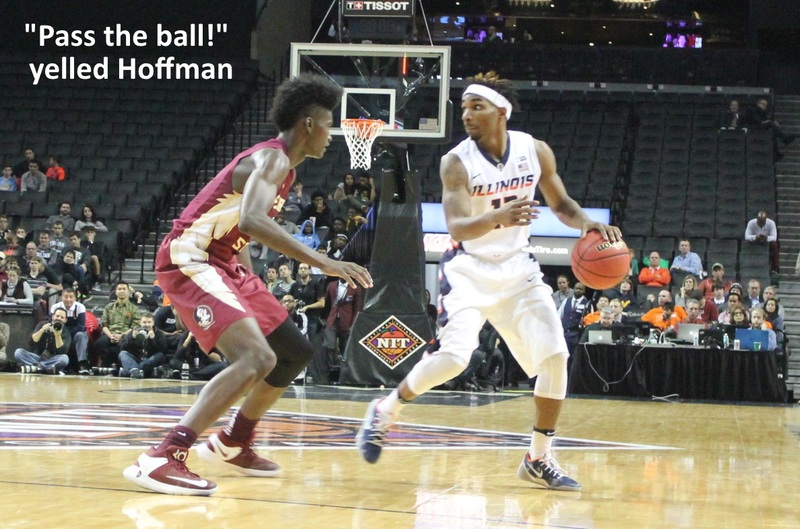 Getting rid of the ball quickly is Jaylon Tate’s preeminent skill. 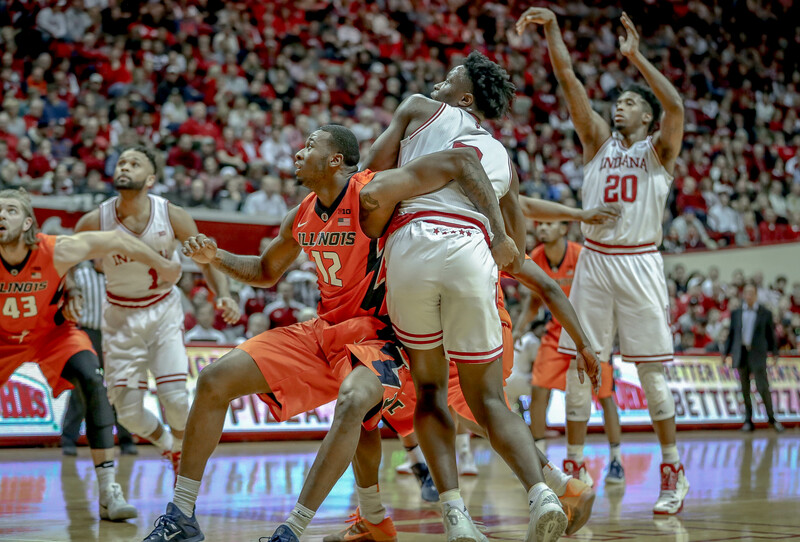 Abrams has never demonstrated any fear, but he’s also never demonstrated the ability to penetrate and kick, one of the foremost skills required of Groce’s offense. 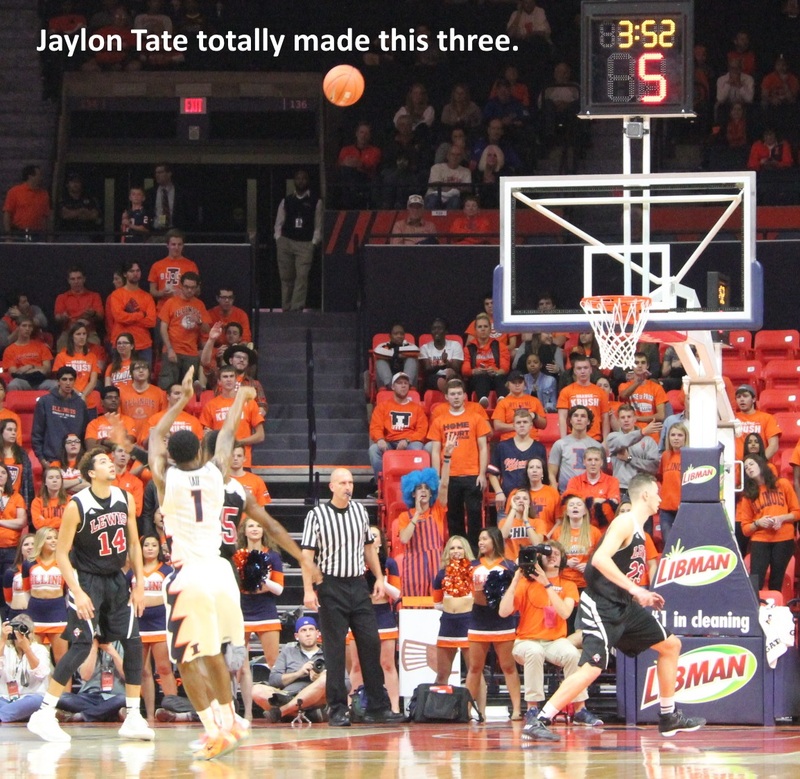 Jaylon Tate is good at that, too. 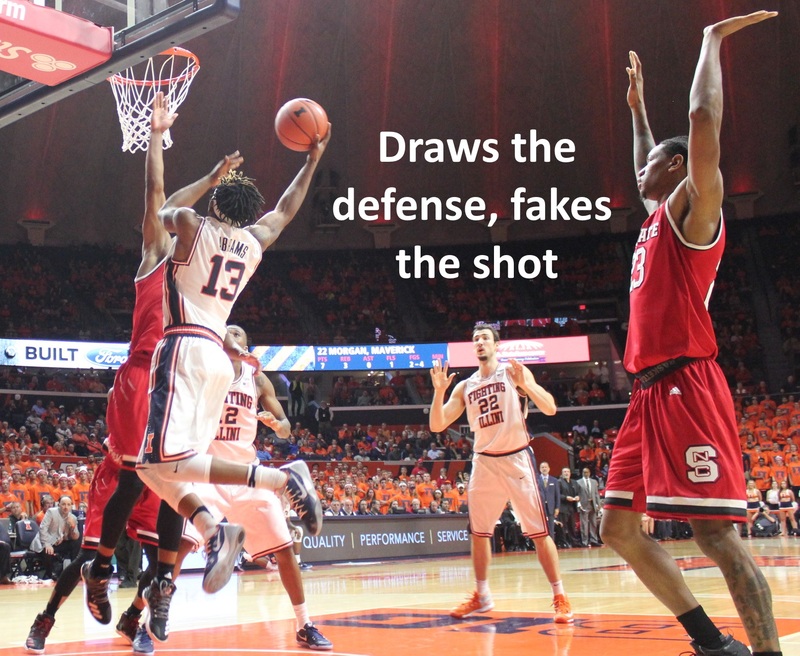 The thing Tate can’t do, famously, is shoot. 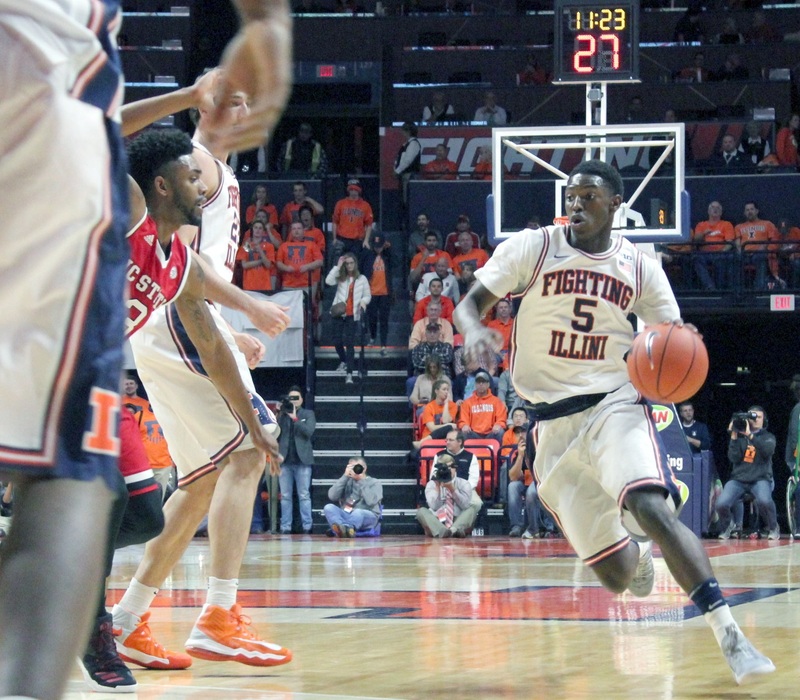 “Who cares?” said Howard Moore, in a hallway of the Marriott O’Hare, during last autumn’s Big Ten Basketball Media Day. 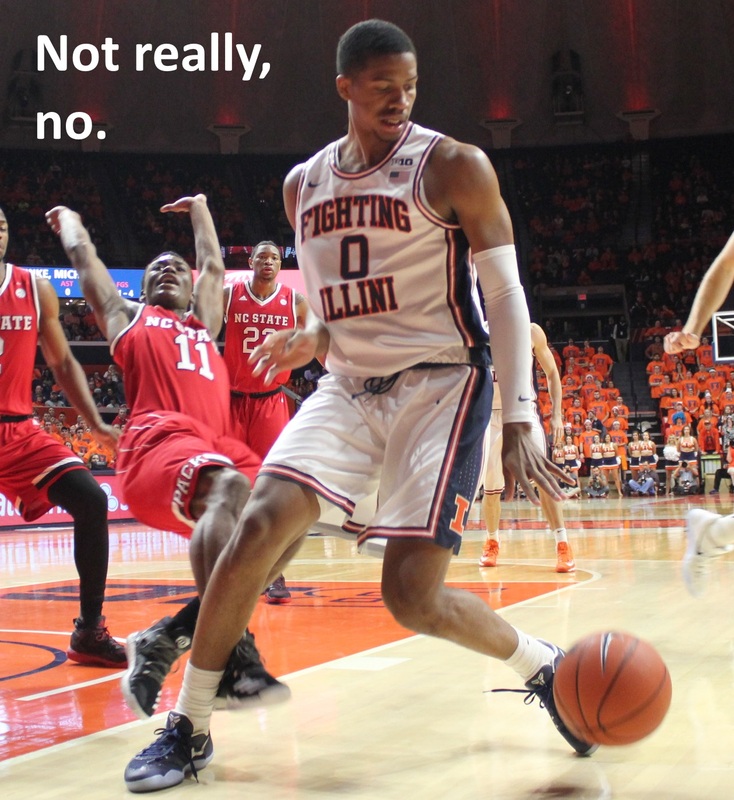 “Really,” agreed Stephen Bardo. 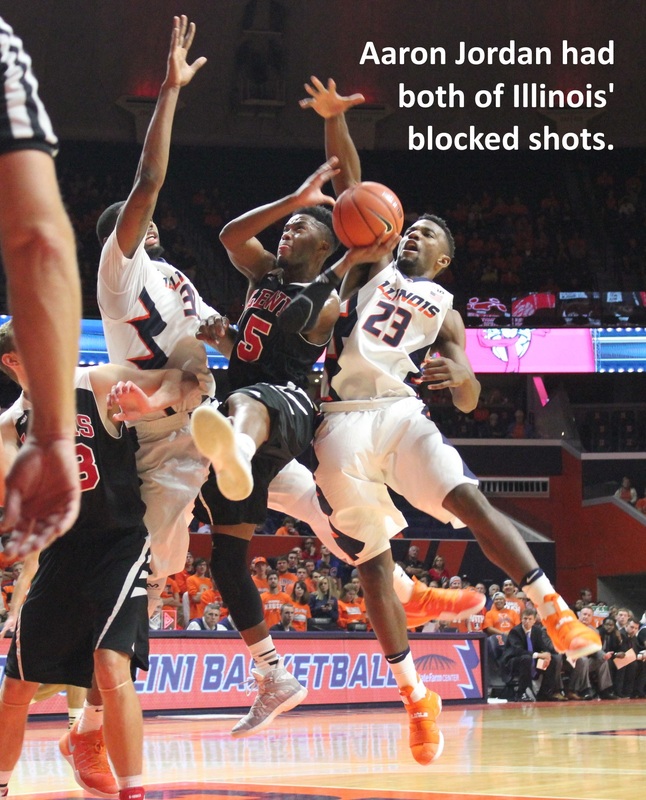 Bardo and Moore blocked the intersection of two arterial hallways for much of that morning. 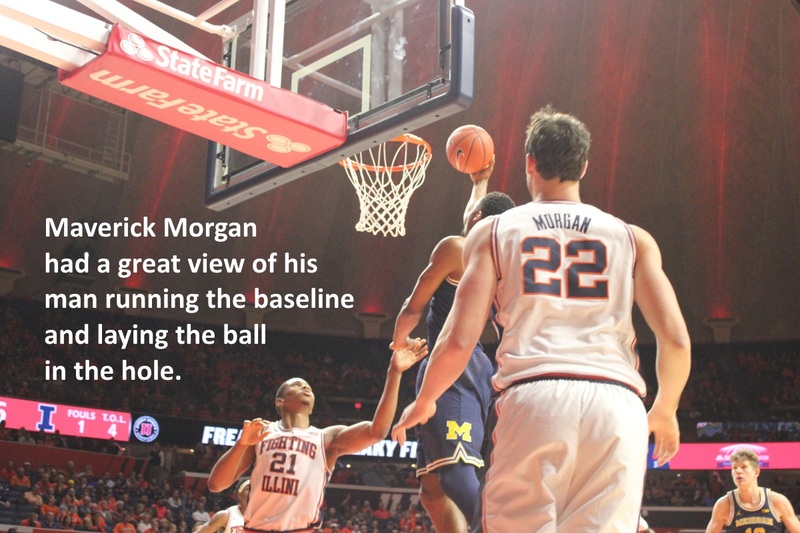 Moore had taken a job as BTN analyst before Bo Ryan’s retirement freed up his old position on the Badger staff. 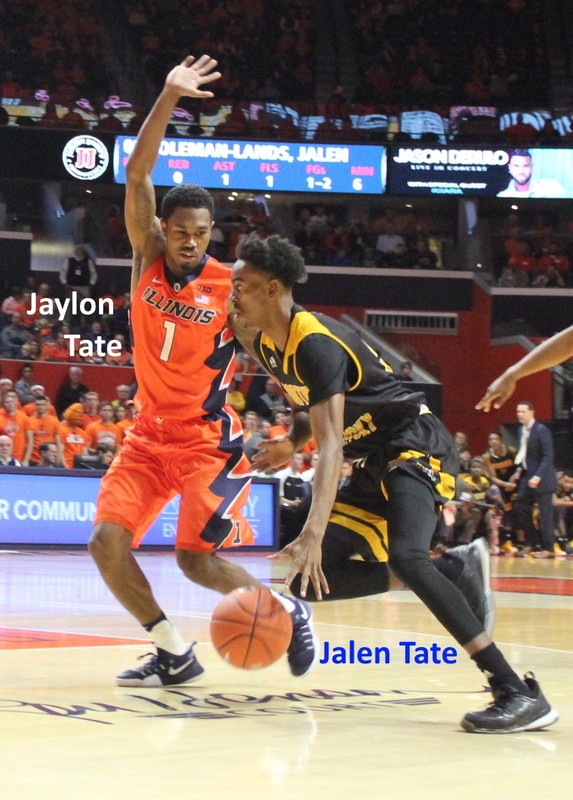 Count him among Jaylon Tate’s fans. 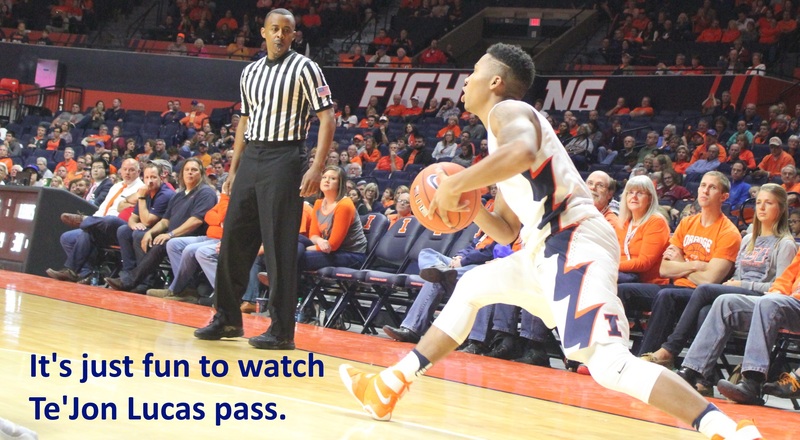 Coaches love watching good passers. 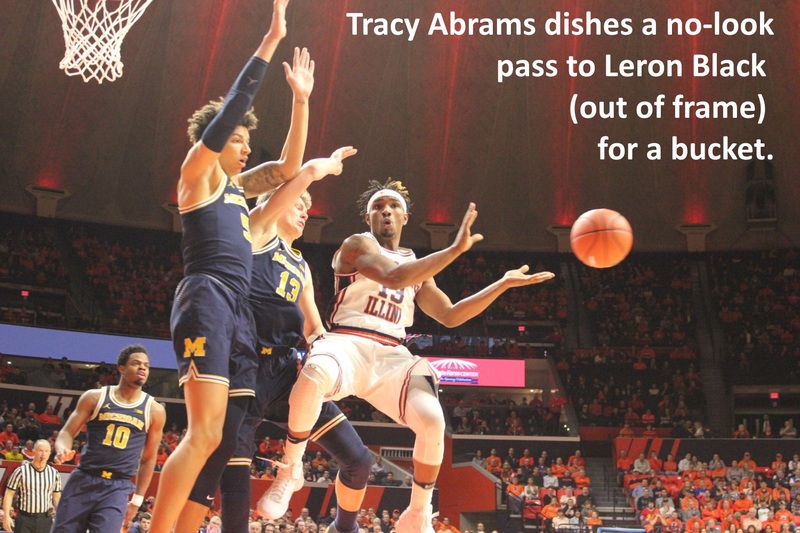 Tracy Abrams is no Derek Harper, and Te’Jon Lucas is probably not the second-coming of Bruce Douglas. 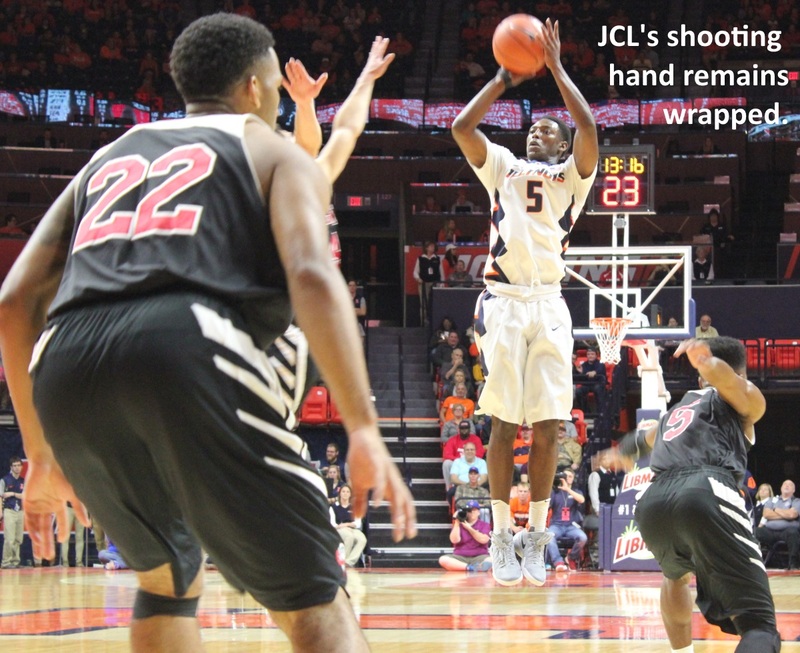 Jaylon Tate could pull a Chester Frazier on us, and finish his Illini career as a competent shooter. 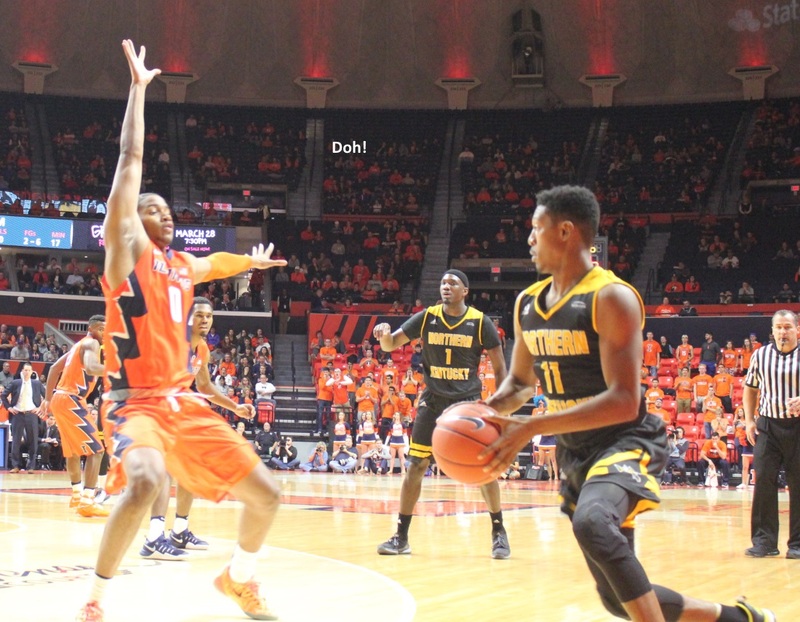 But there’s no Gary Nottingham on staff to analyze and correct shooting form. 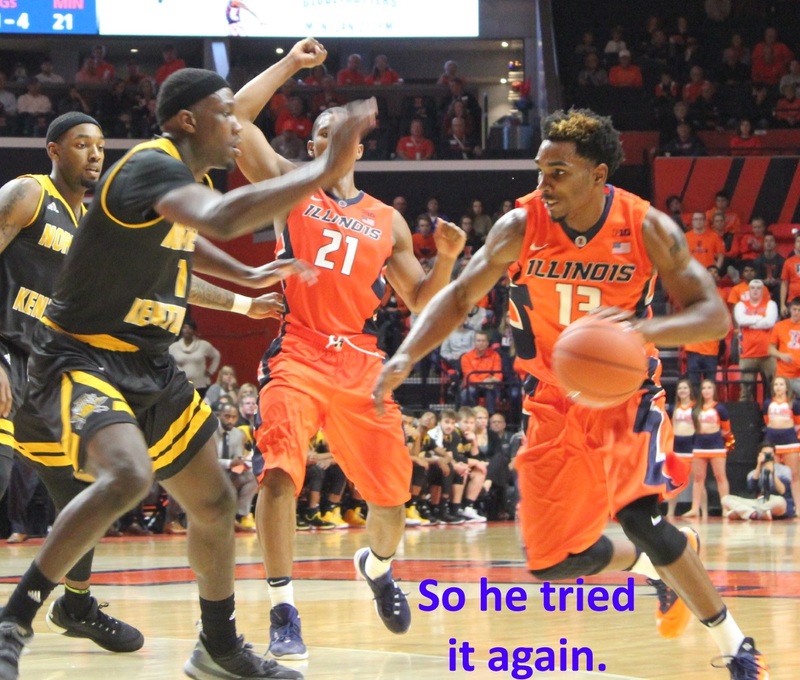 It seems unlikely that Tate would follow the Quinn Richardson example. 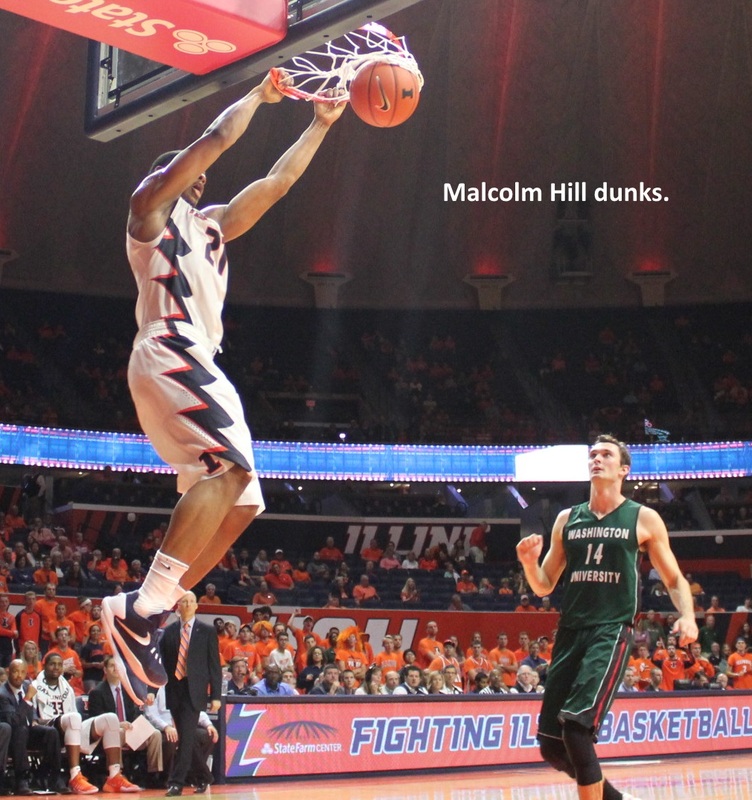 But it would be fun watching him alley-oop to Jeremiah Tilmon.